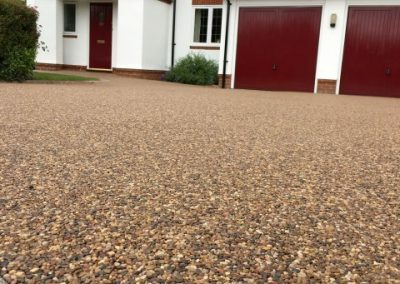 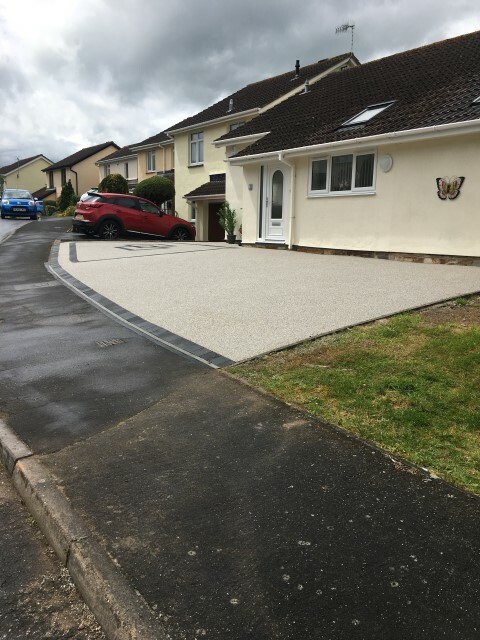 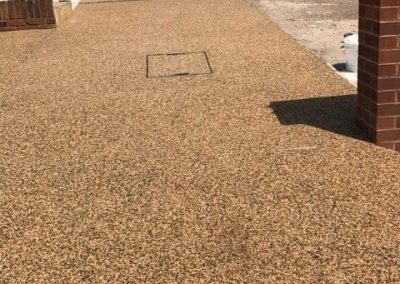 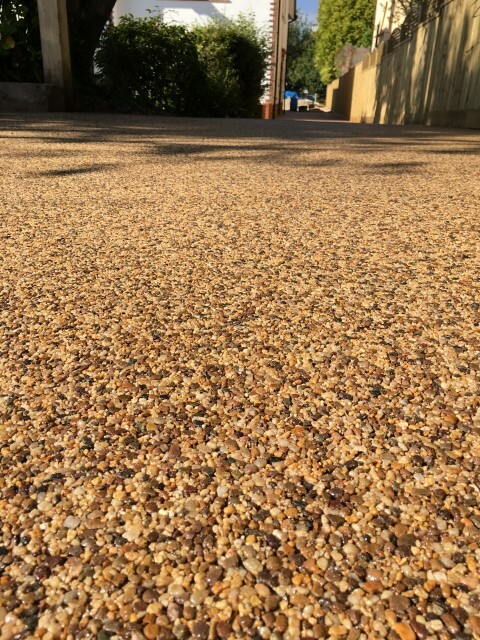 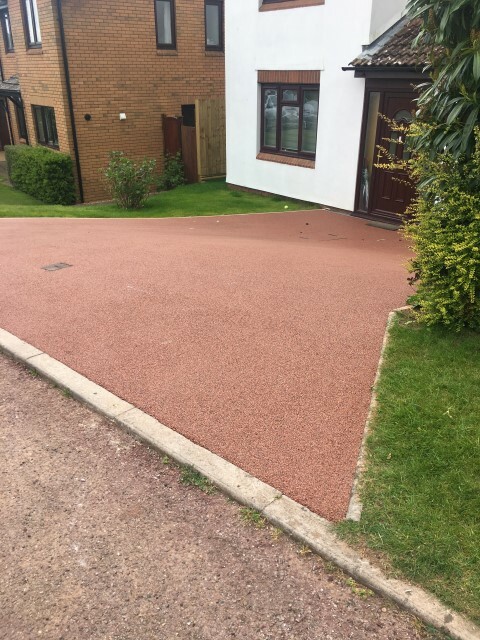 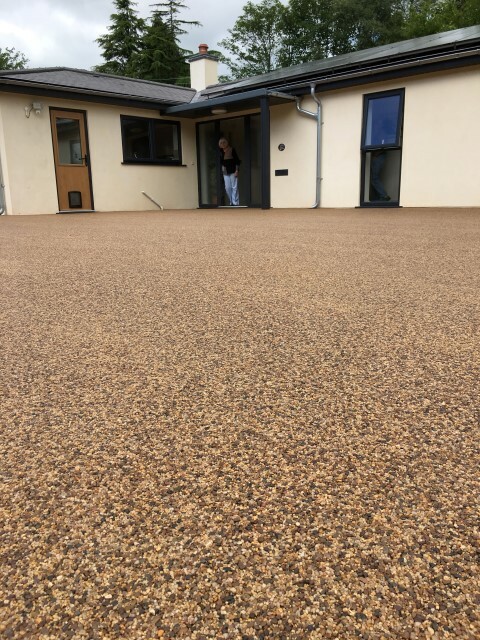 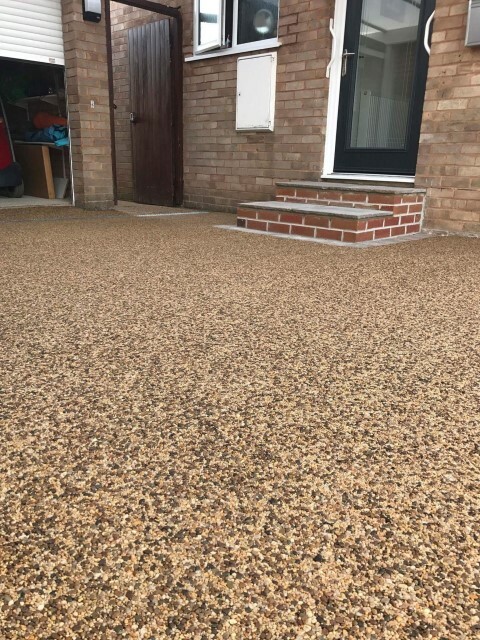 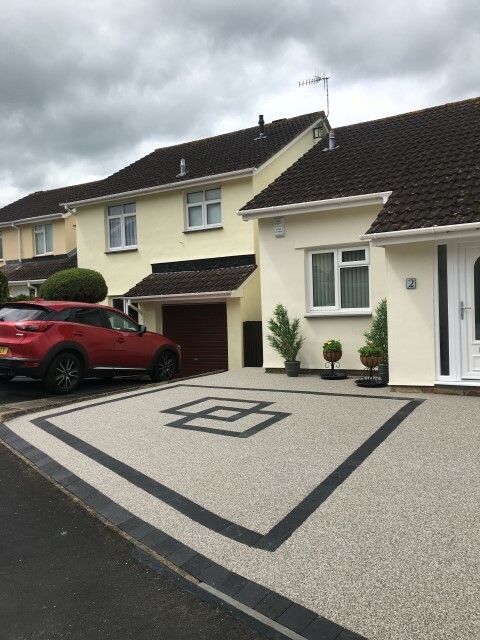 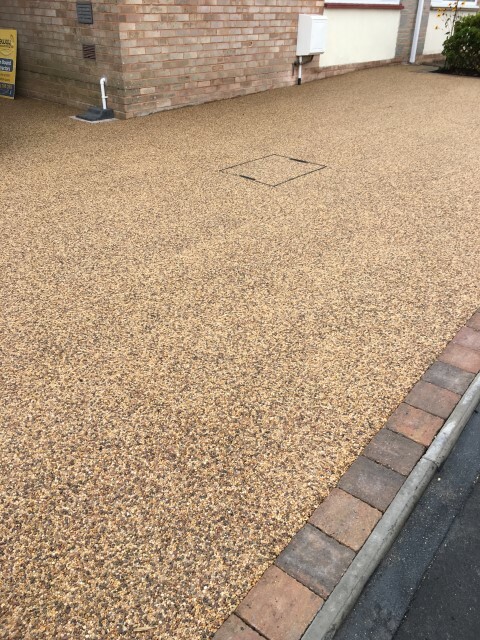 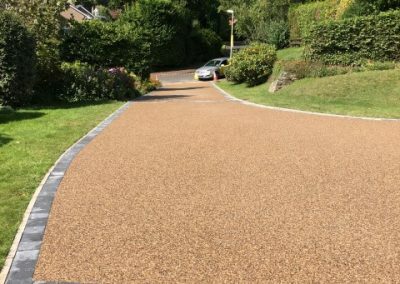 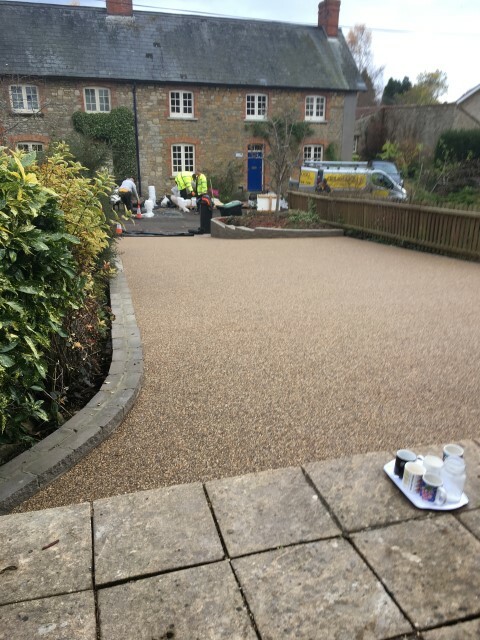 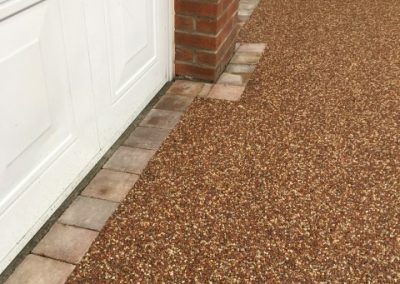 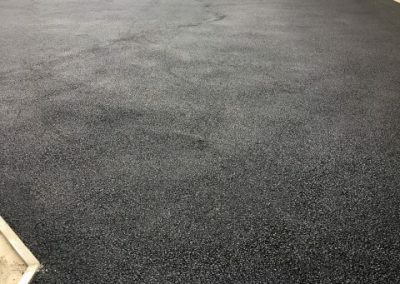 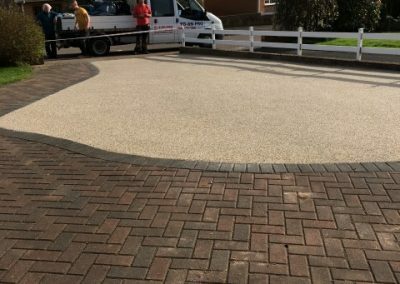 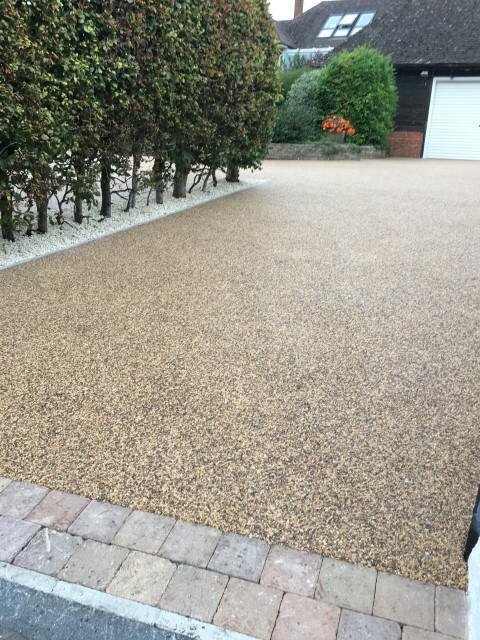 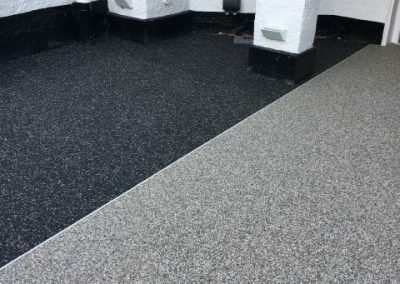 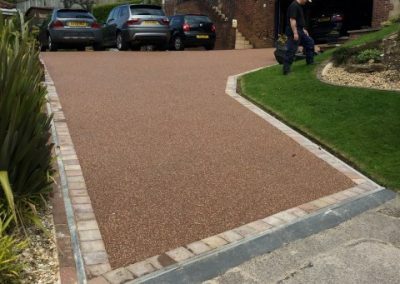 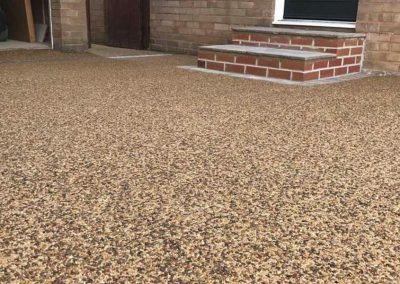 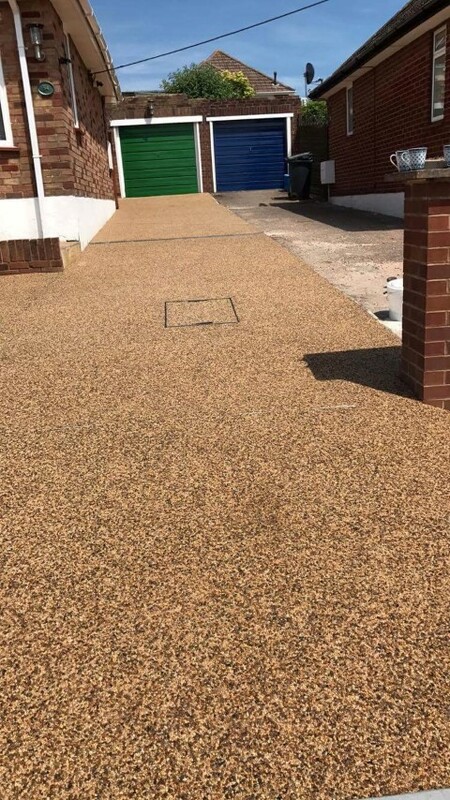 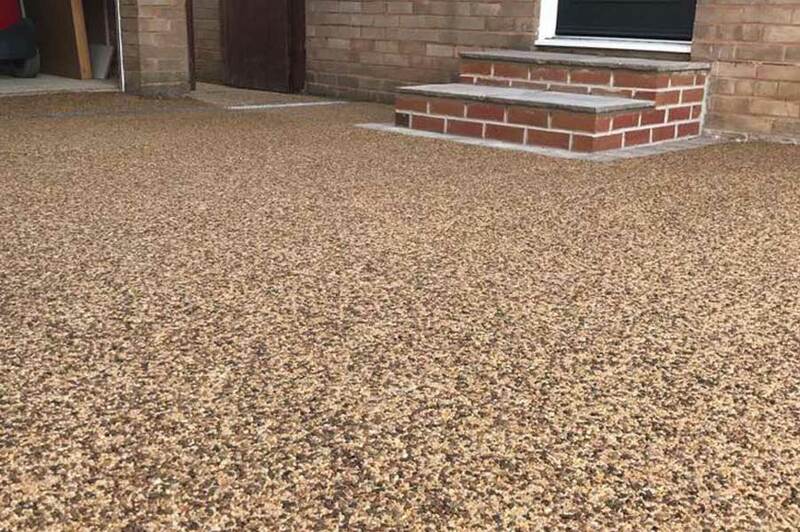 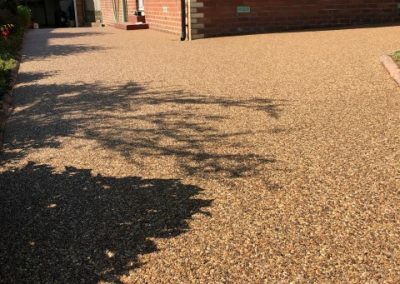 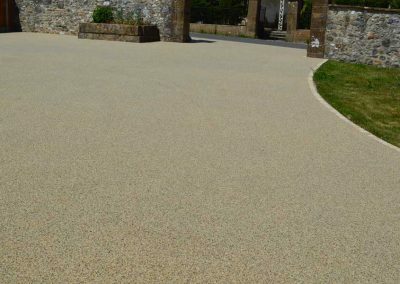 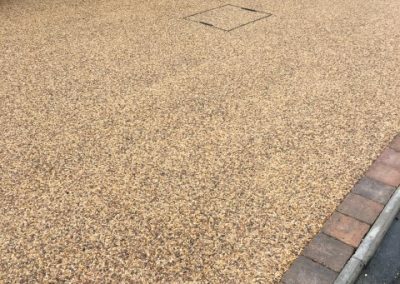 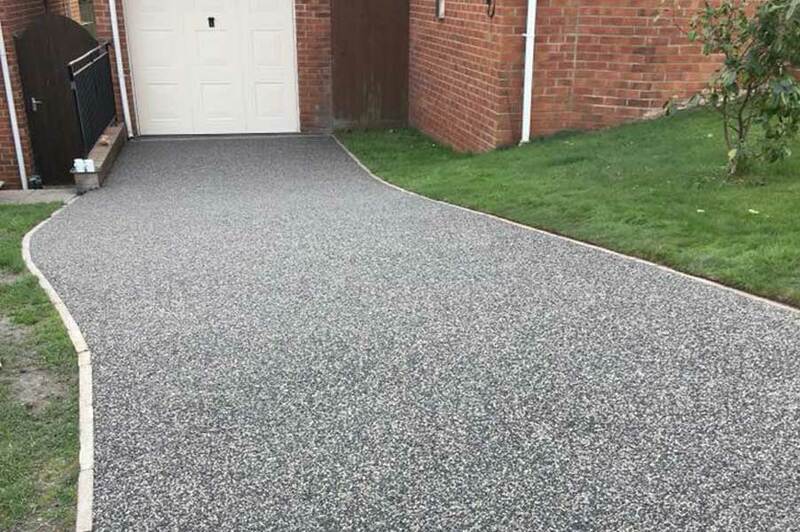 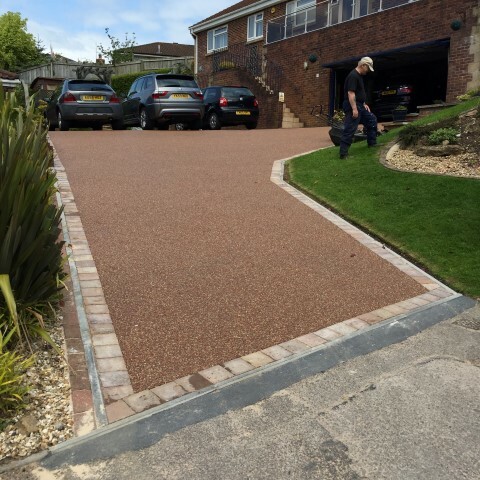 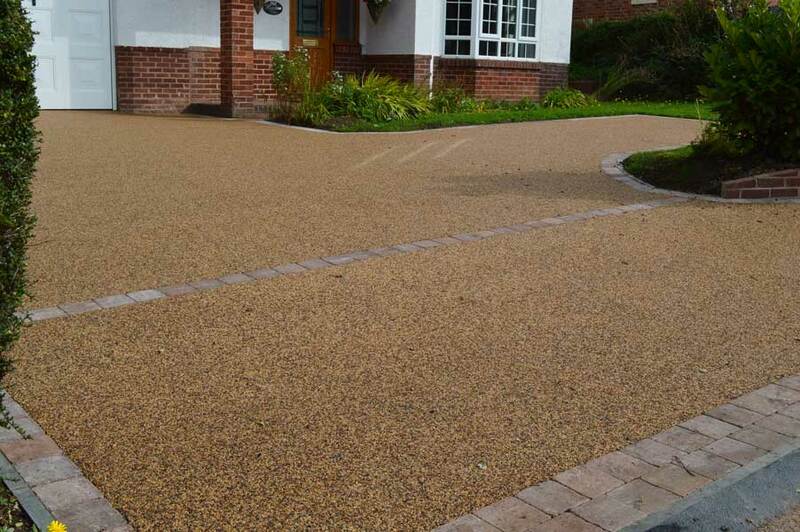 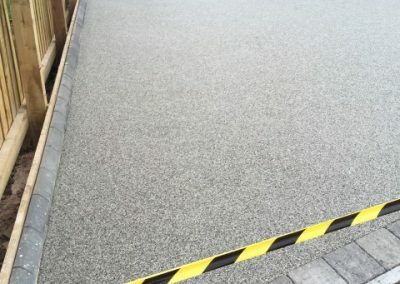 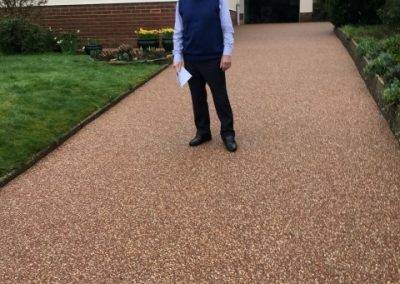 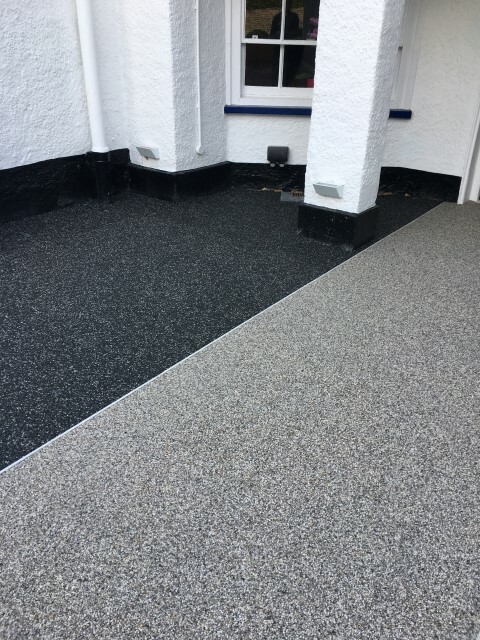 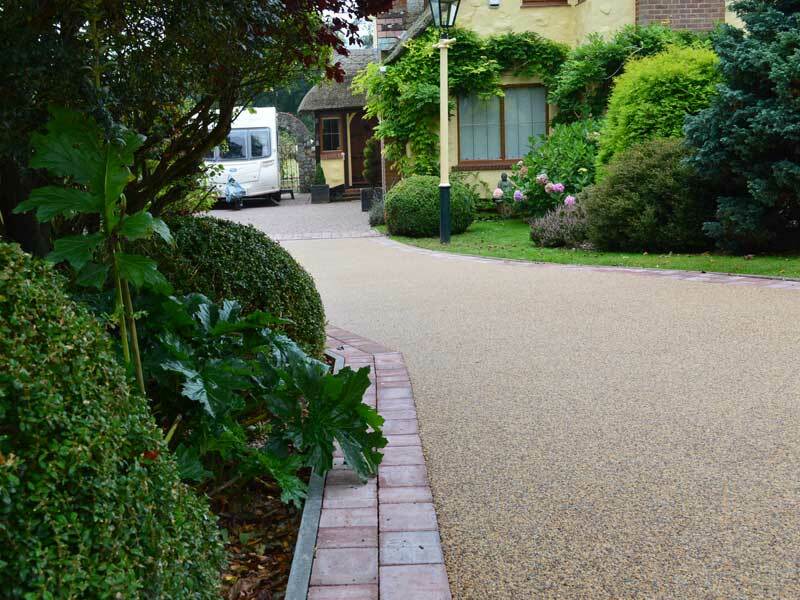 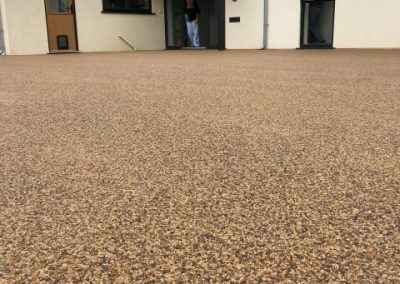 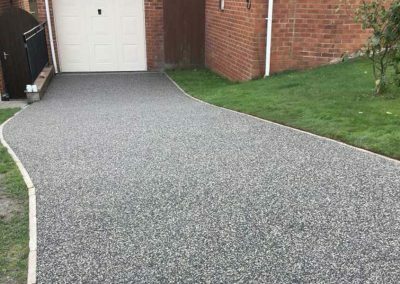 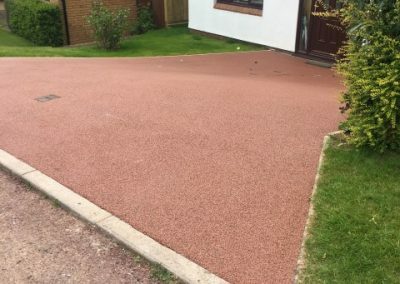 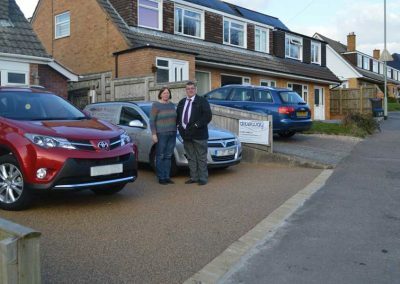 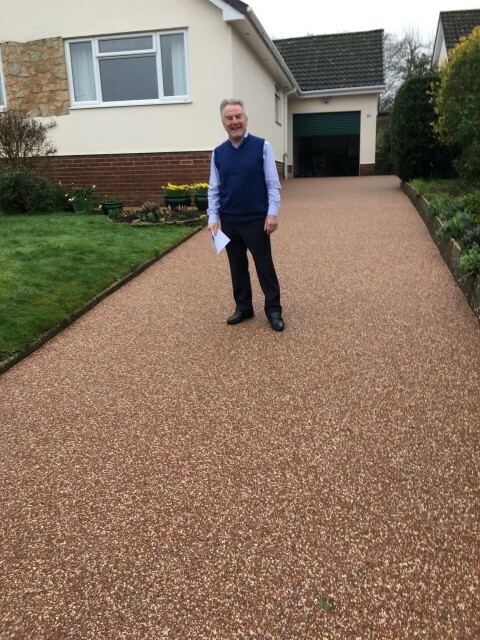 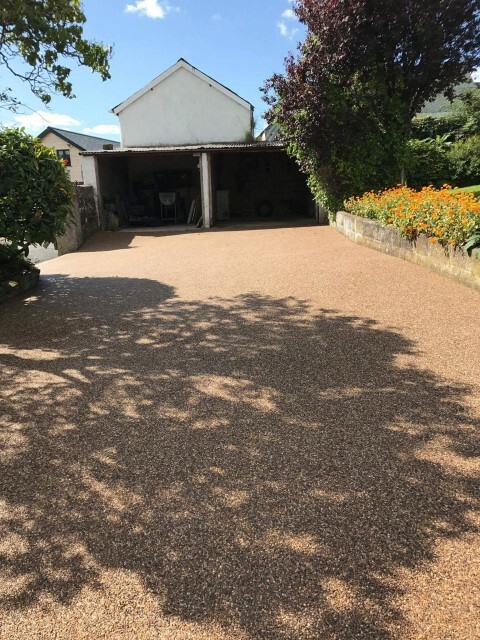 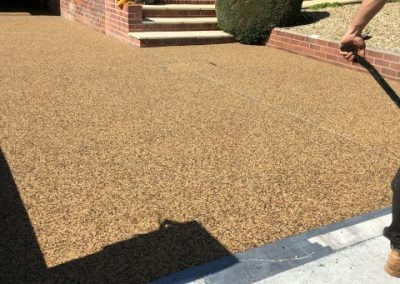 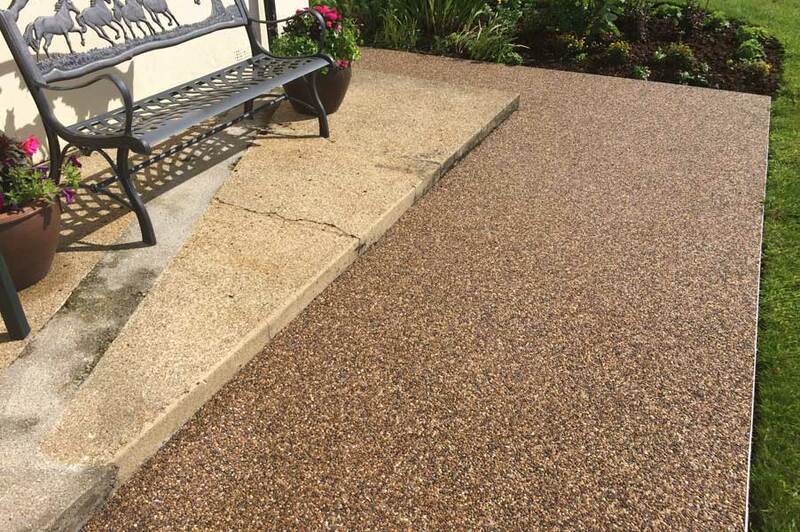 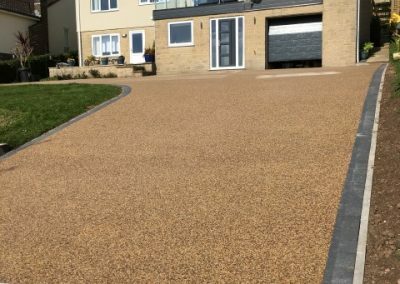 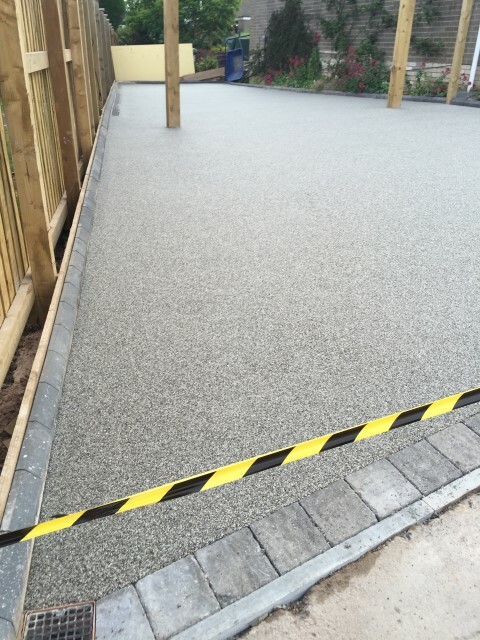 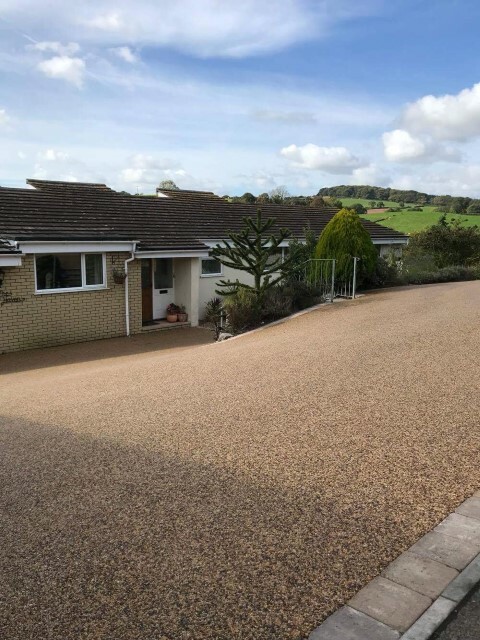 Resin Bound Surfacing is a resin bound aggregate surface for pedestrian and vehicular traffic that is hard-wearing, permeable and finished in a wide range of colours and styles making it an ideal, versatile solution for driveways, footpaths, playgrounds, car parks and patio areas. 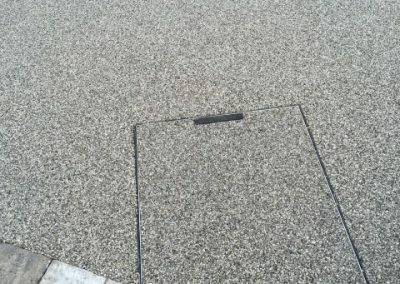 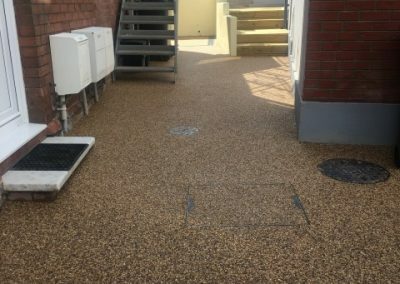 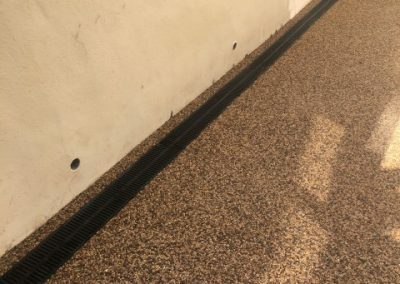 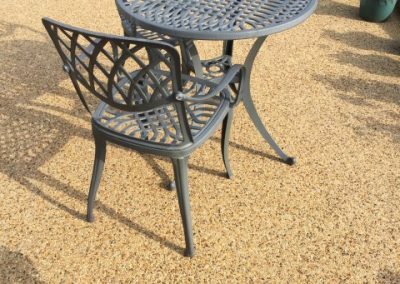 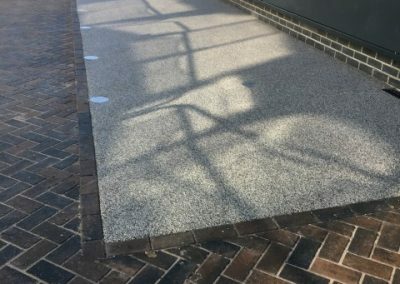 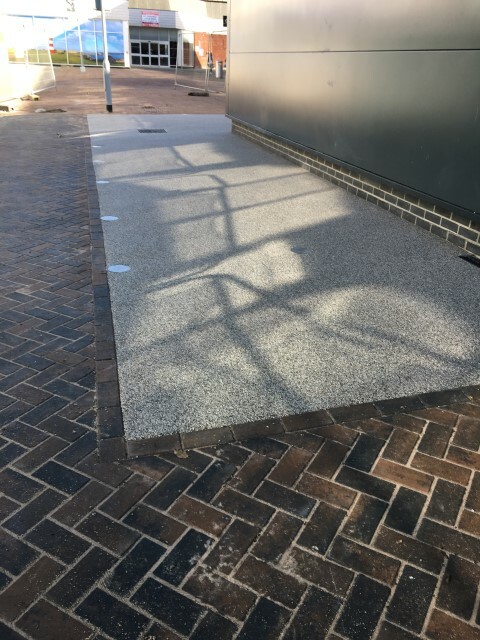 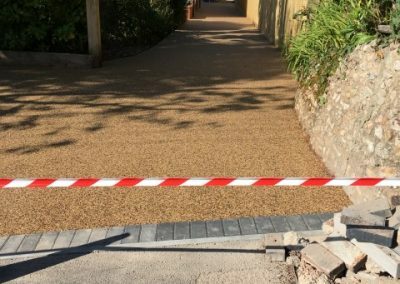 Resin Bound surfaces are decorative, functional, seamless and slightly flexible with an open matrix system which allows water to drain through to the base. 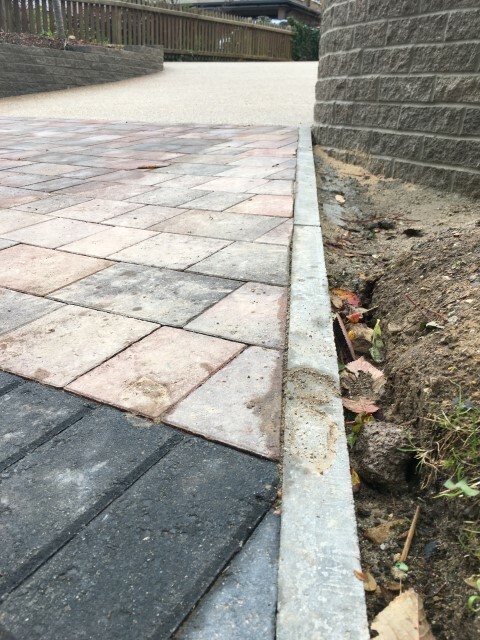 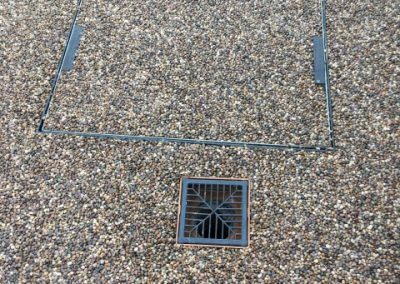 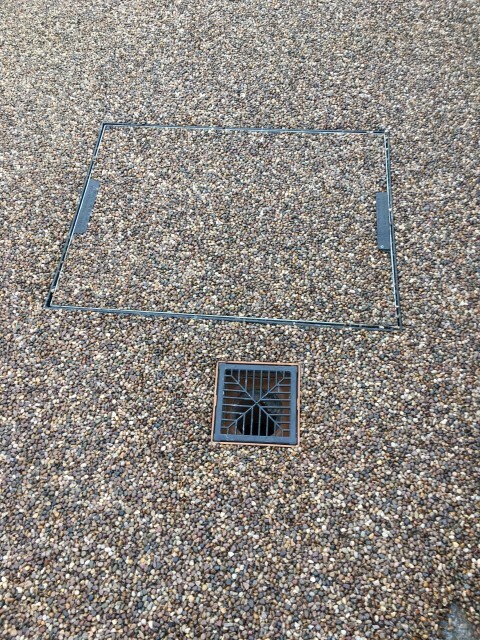 This efficient integrated drainage system eliminates water ponding and allows water to drain to planted areas or land drains so your drive is left puddle-free and looking its best. 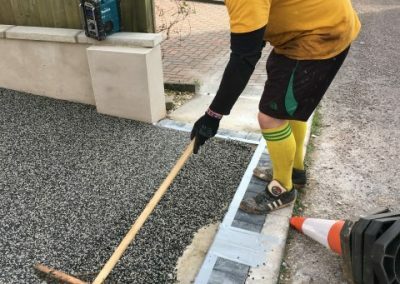 The surfacing may be applied to SuDS compliant bases and sub-bases, reducing the impact of urban development on flood risk and allowing water to flow into water courses. 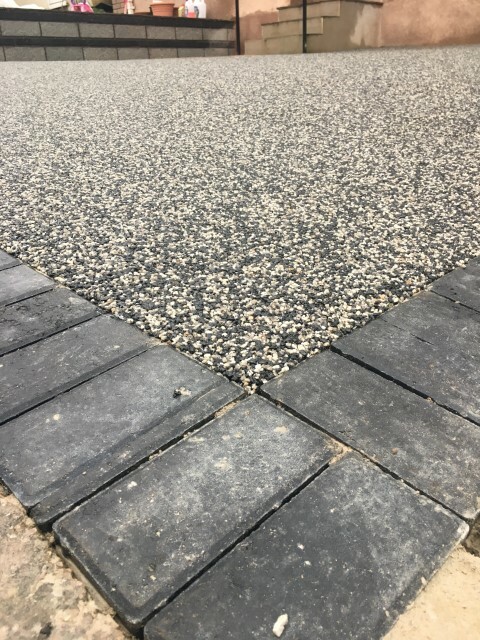 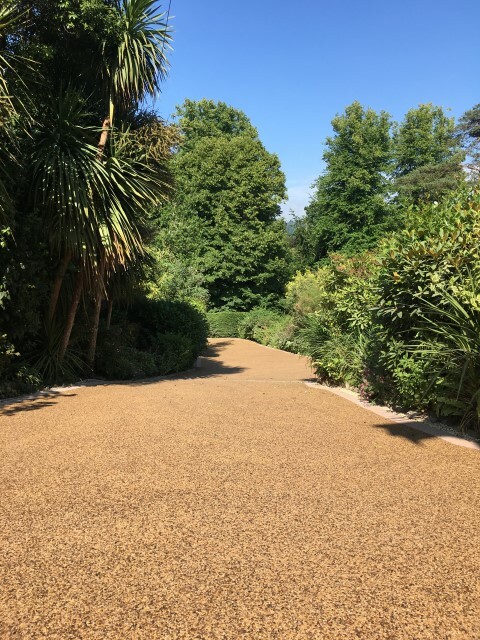 The system uses a two-part resin mix which is combined with natural aggregate in a forced action mixer to completely bind the final mix together into a beautiful, seamless paving solution laid at 18-20mm thickness. 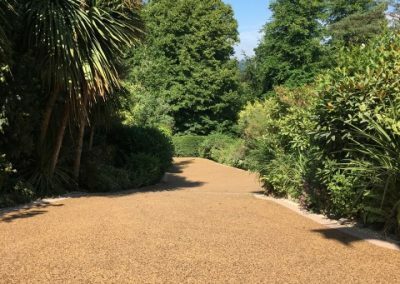 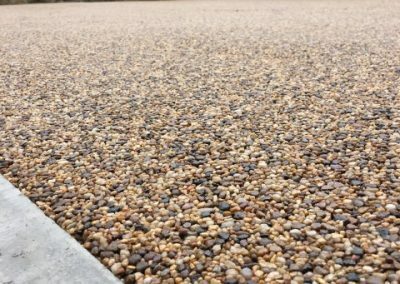 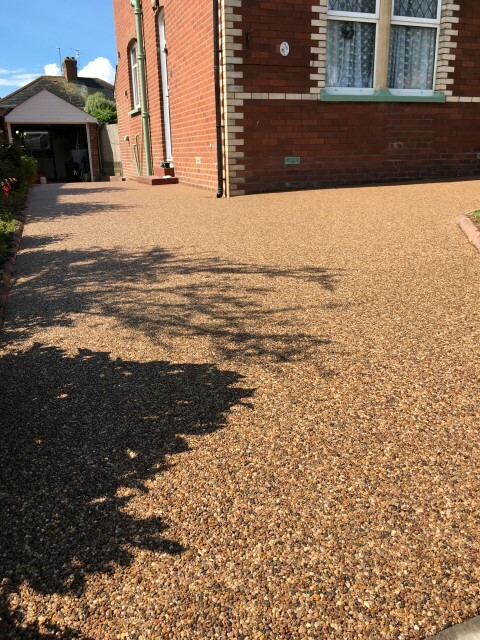 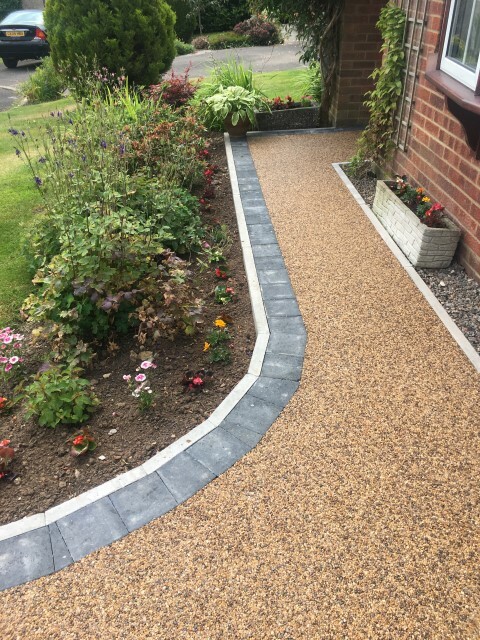 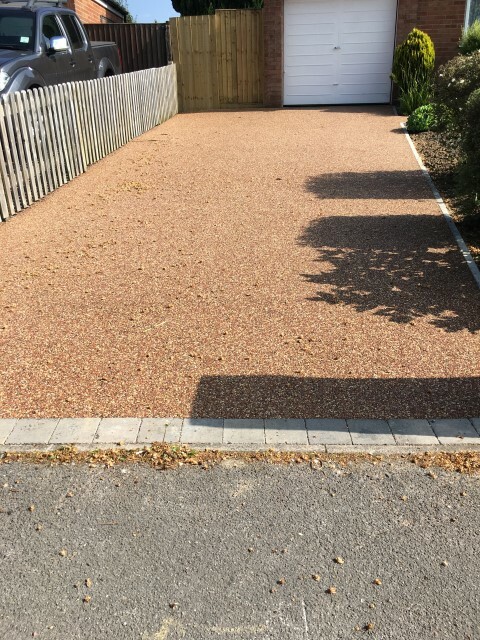 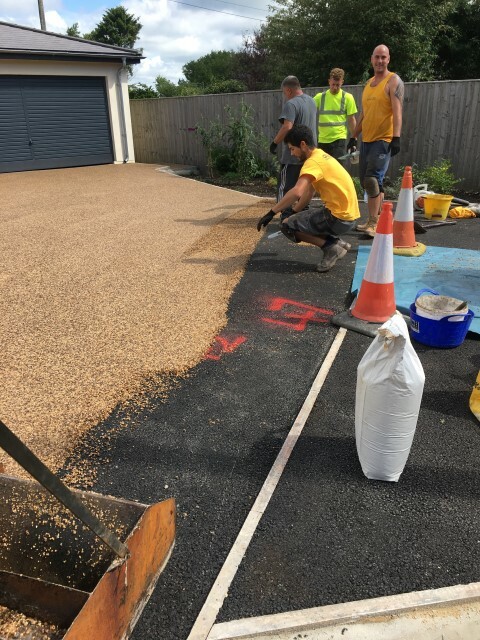 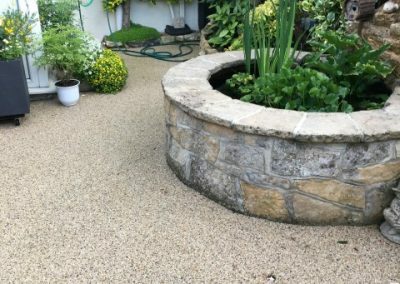 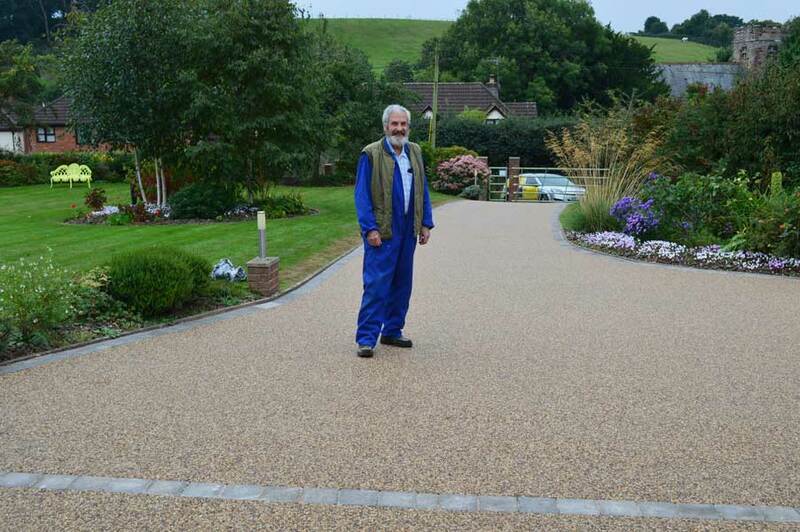 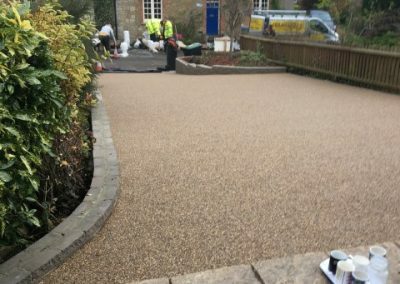 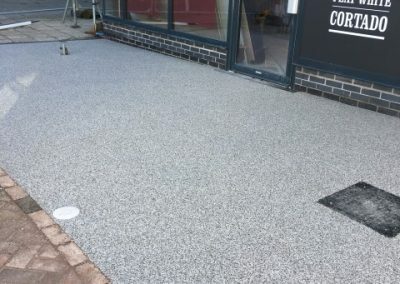 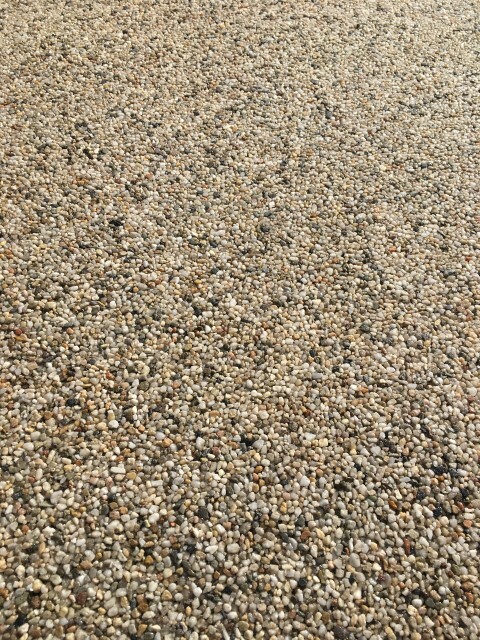 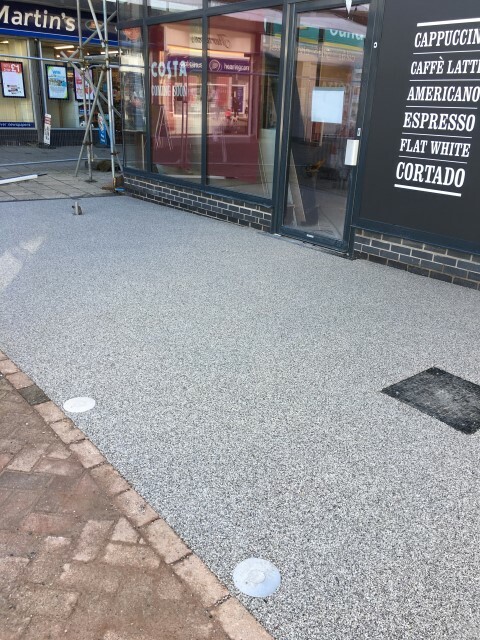 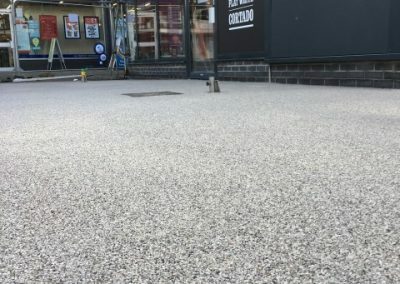 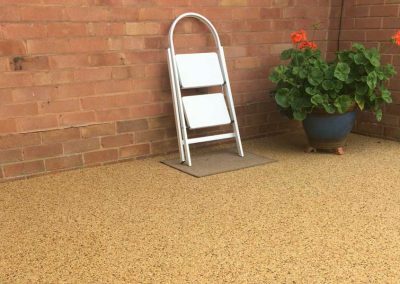 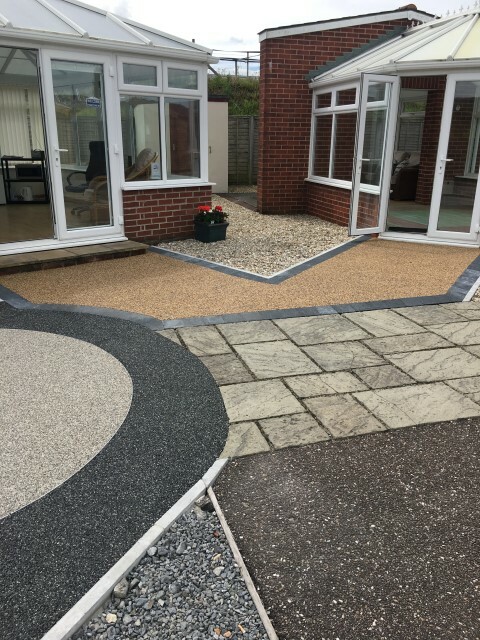 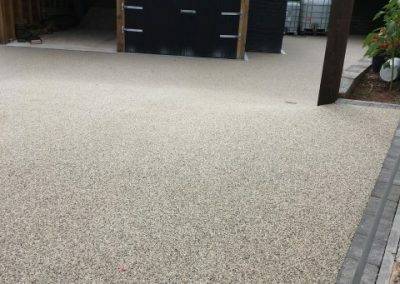 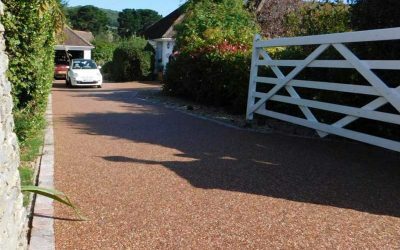 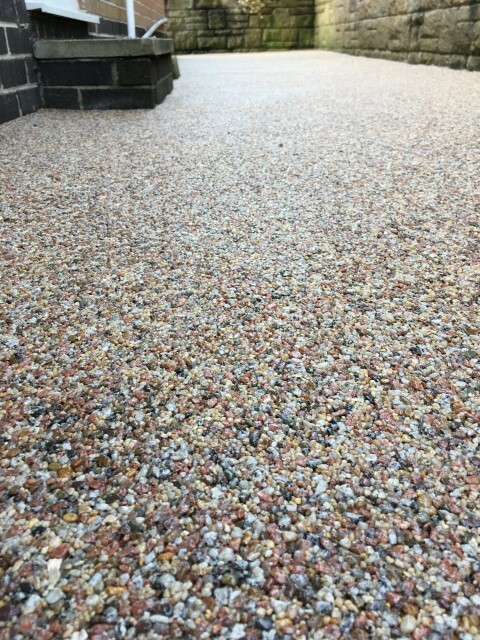 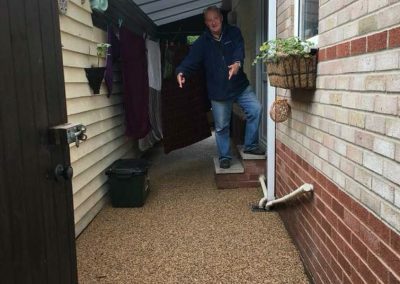 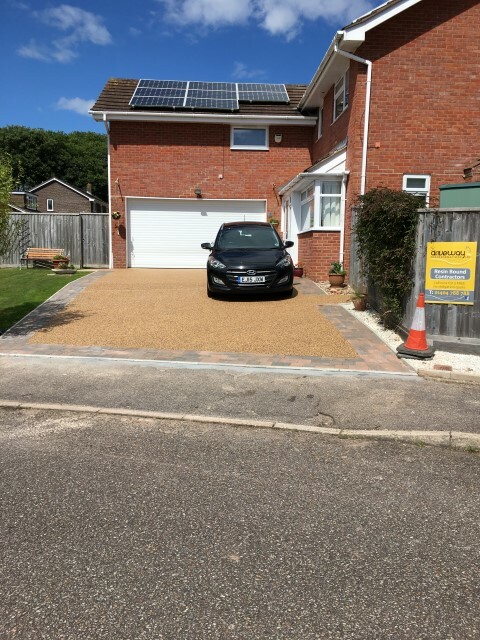 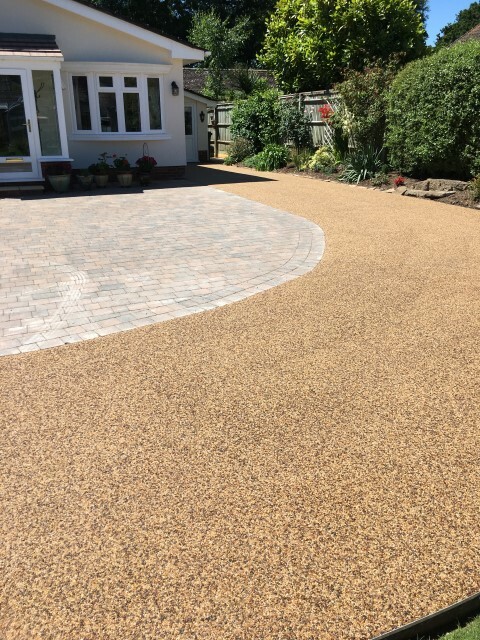 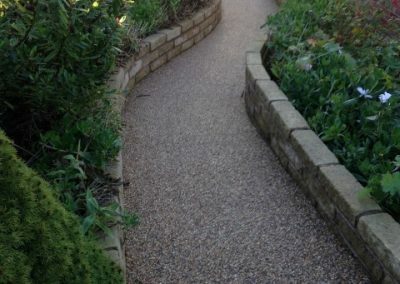 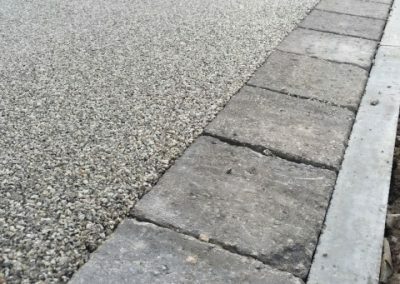 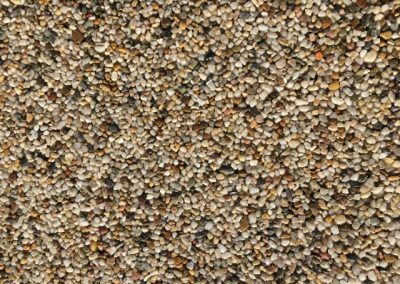 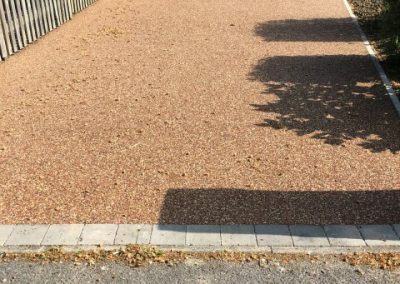 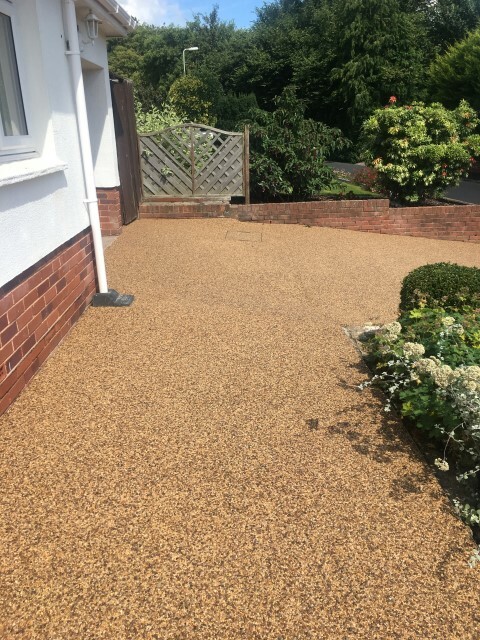 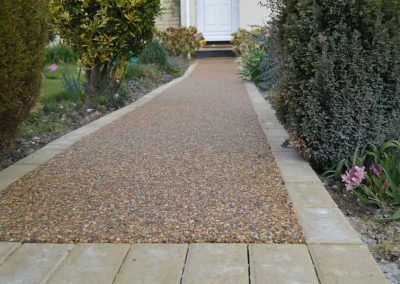 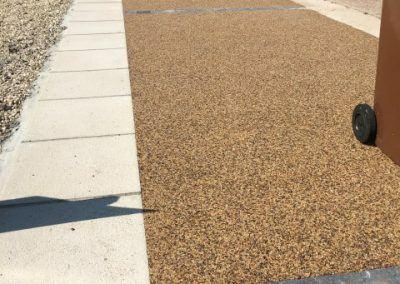 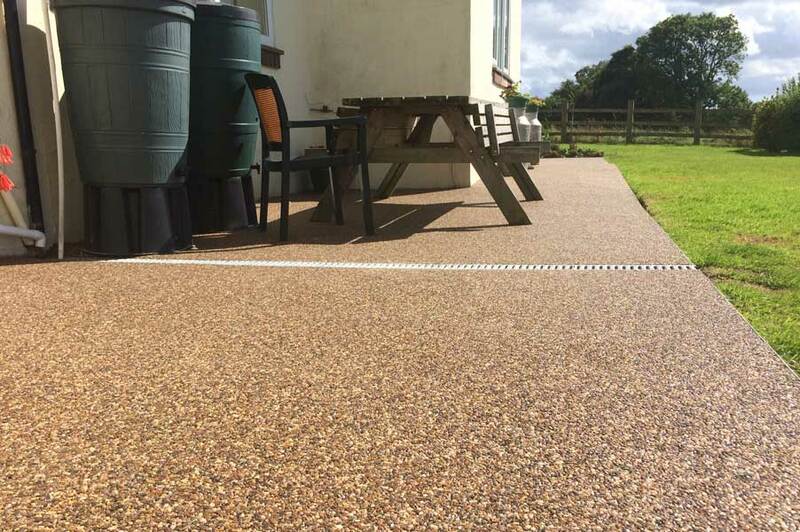 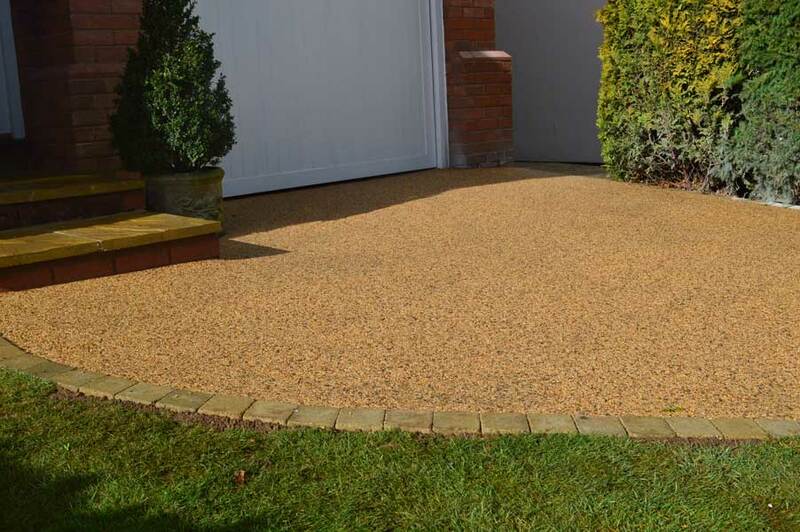 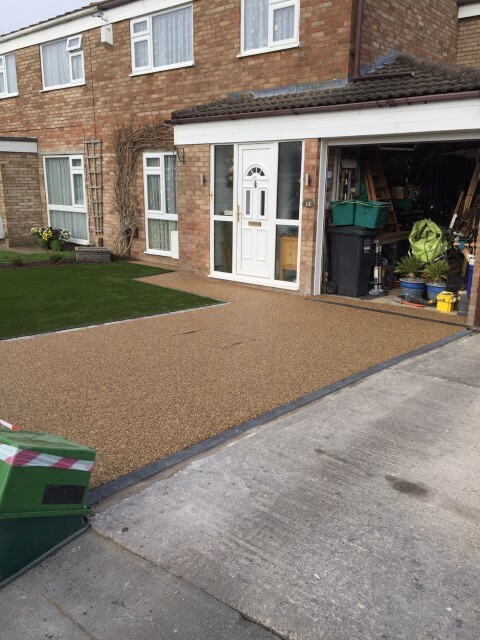 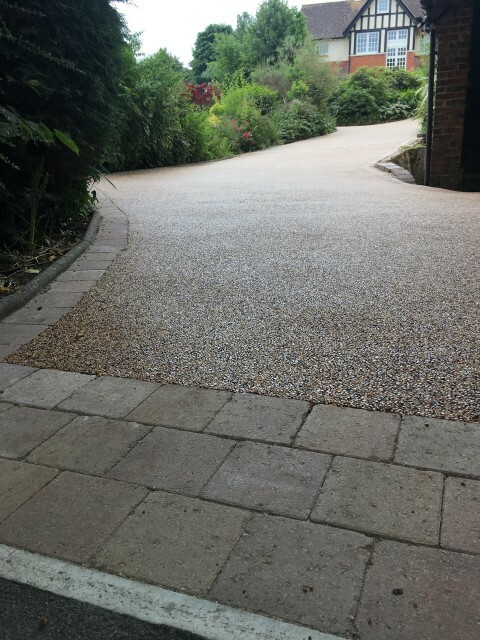 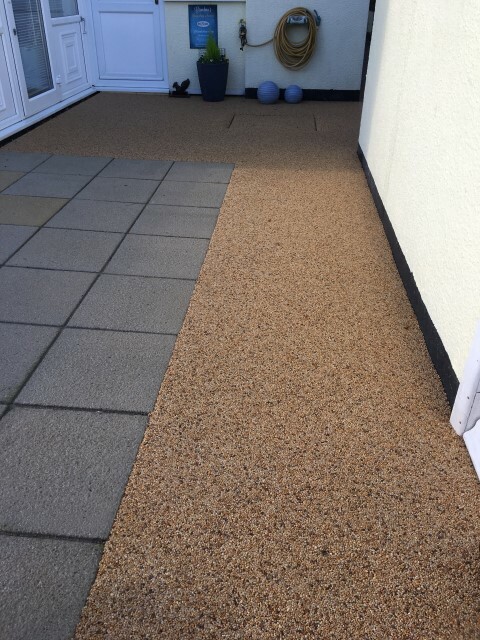 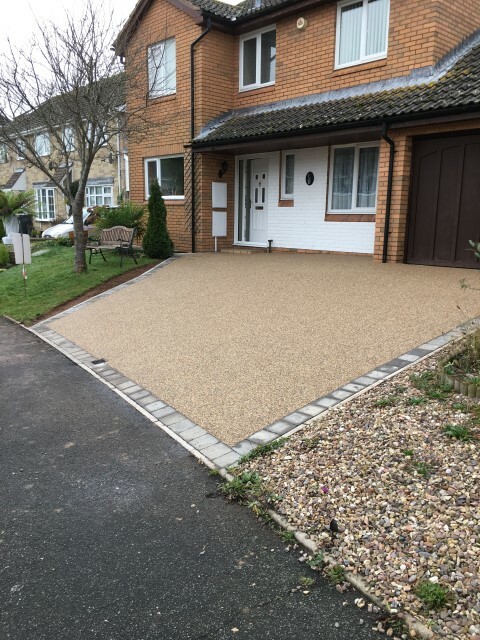 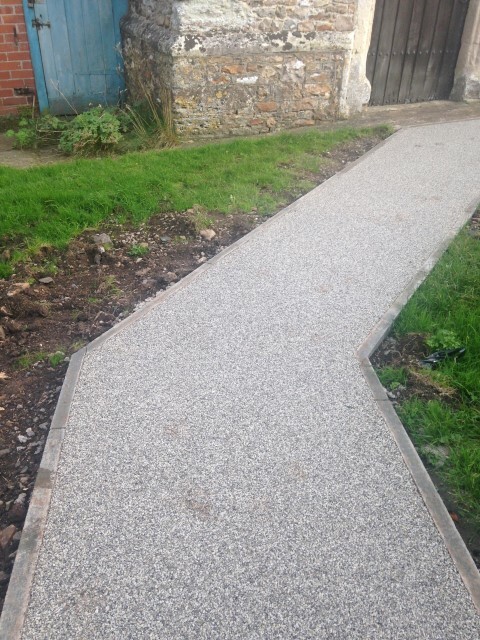 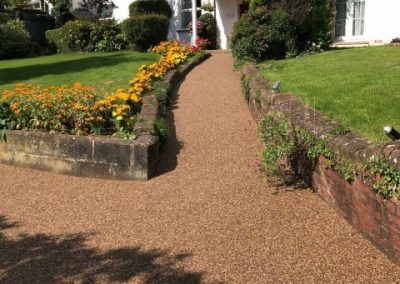 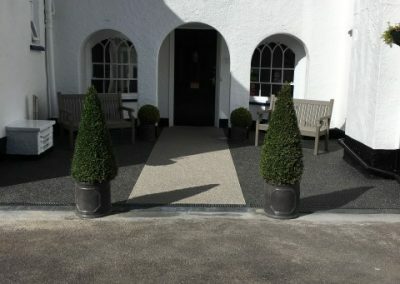 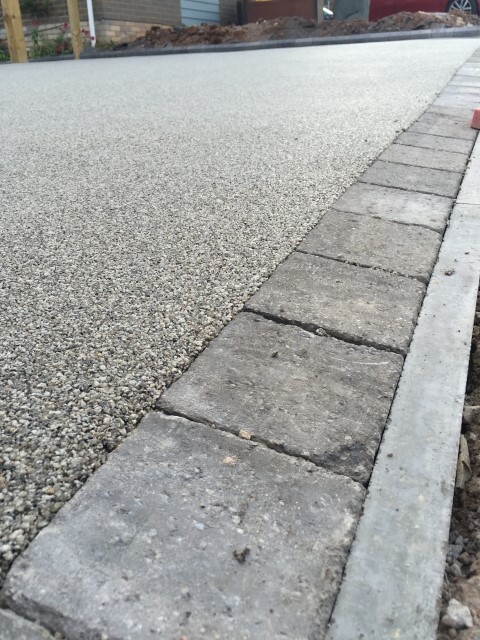 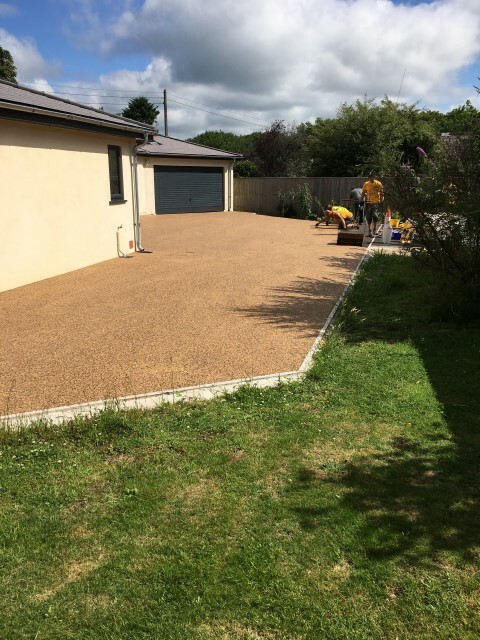 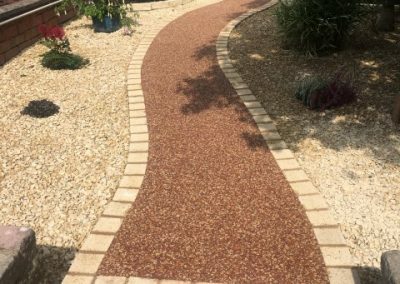 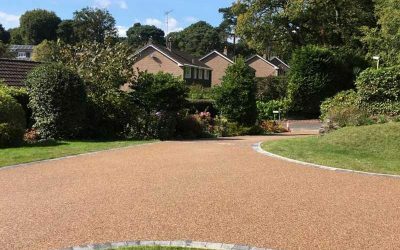 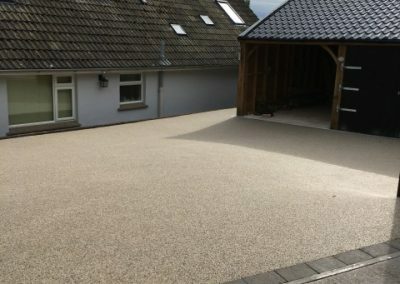 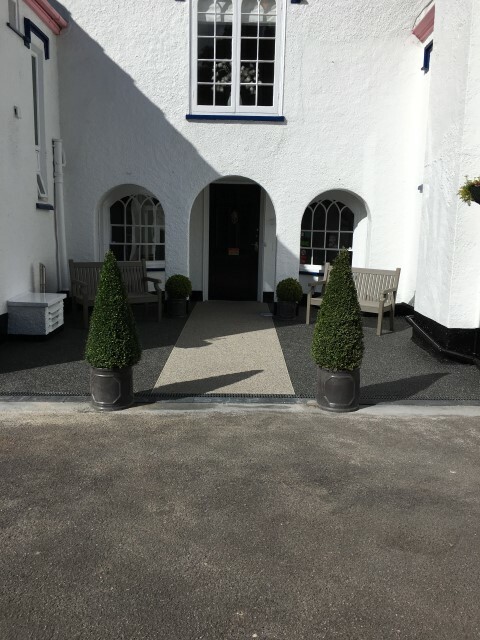 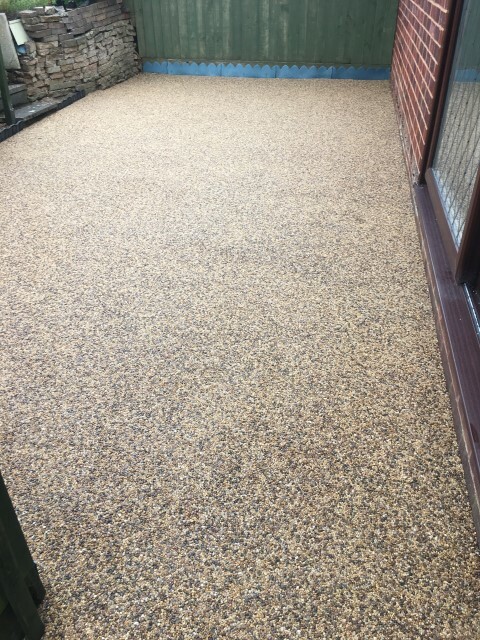 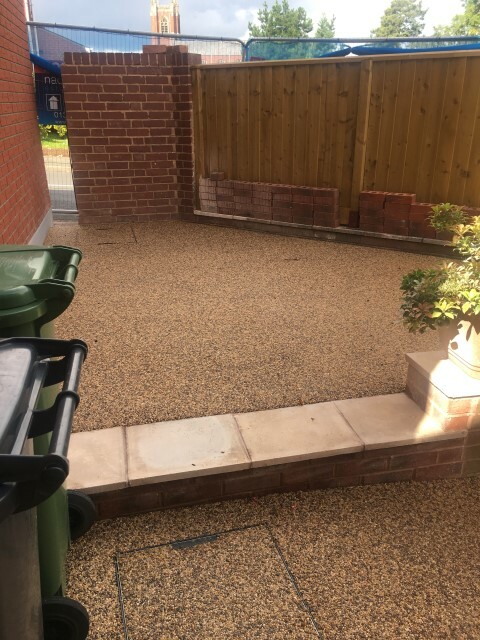 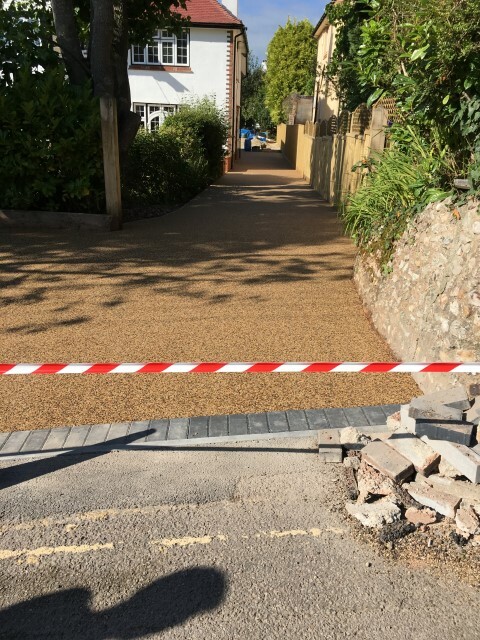 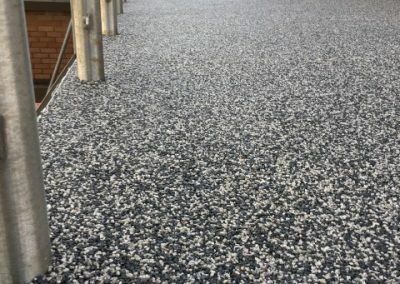 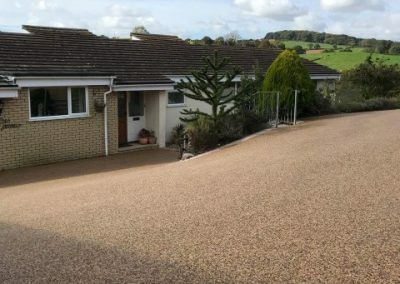 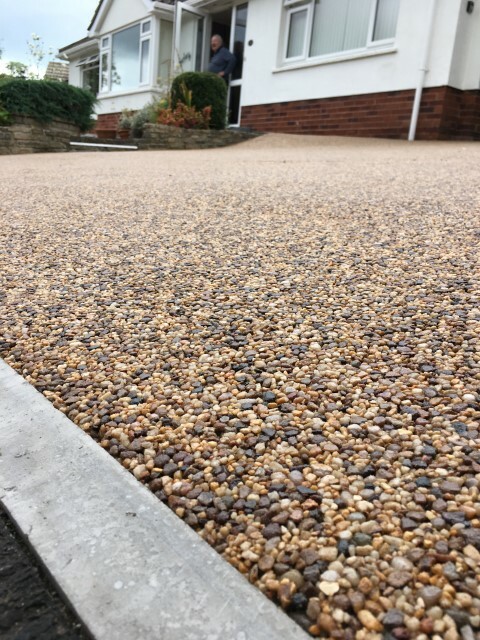 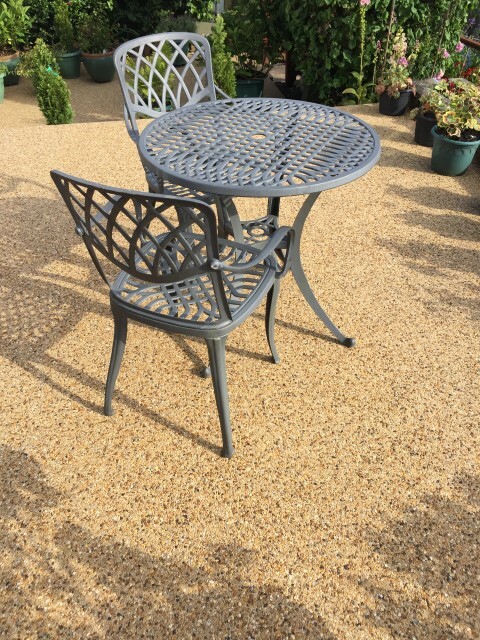 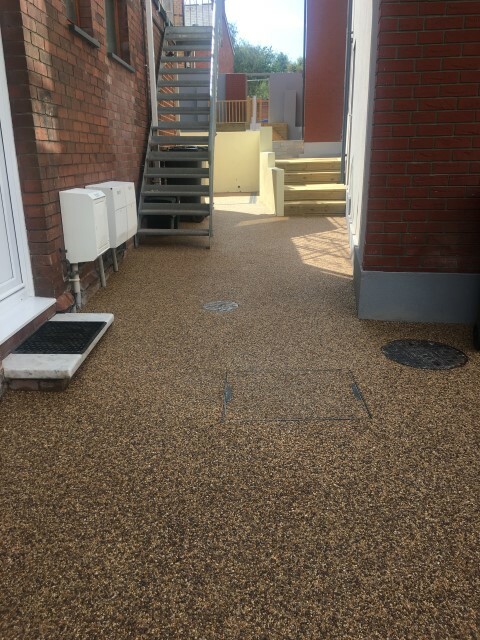 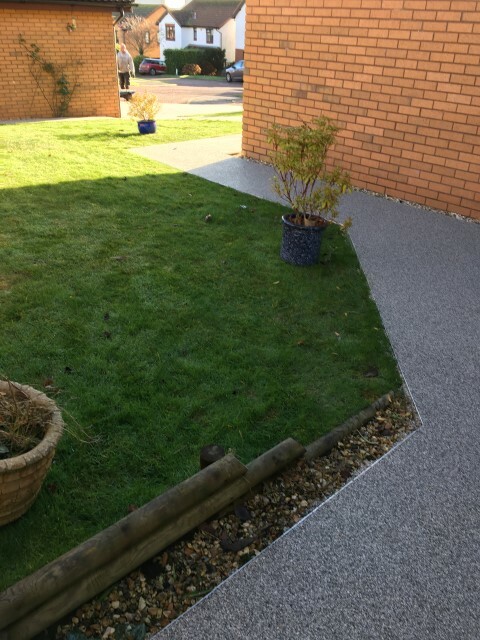 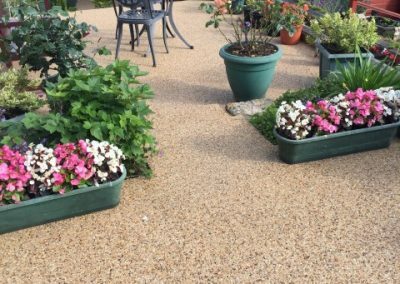 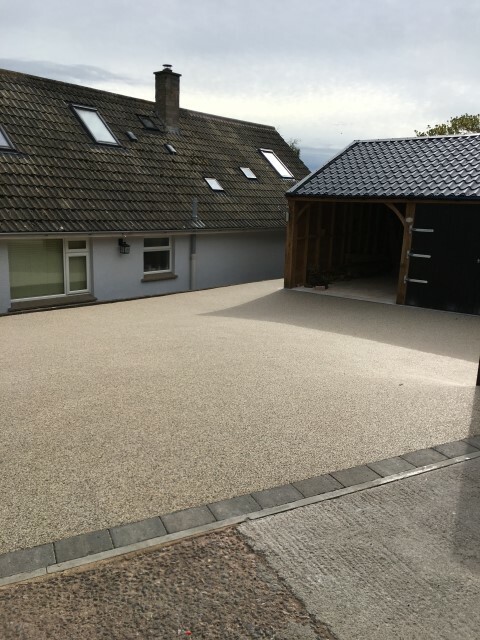 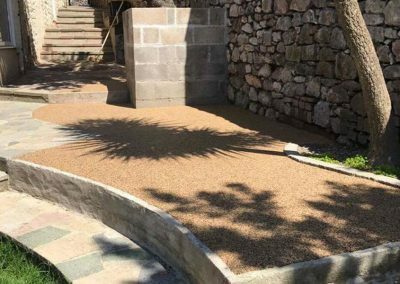 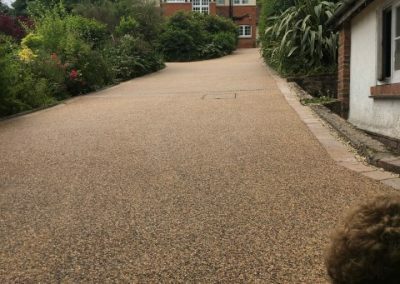 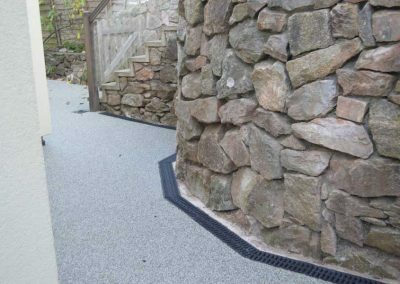 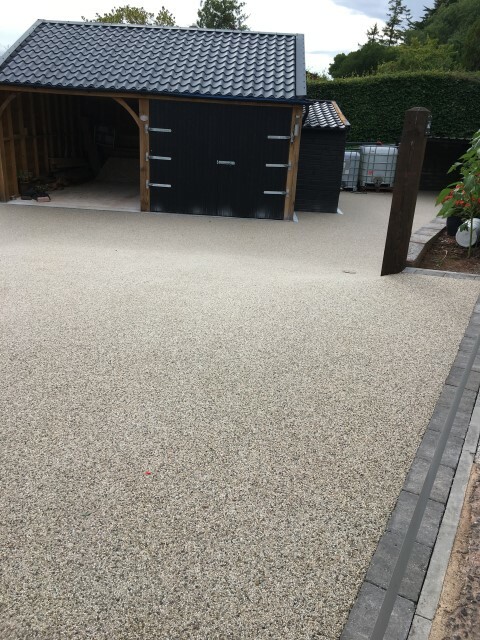 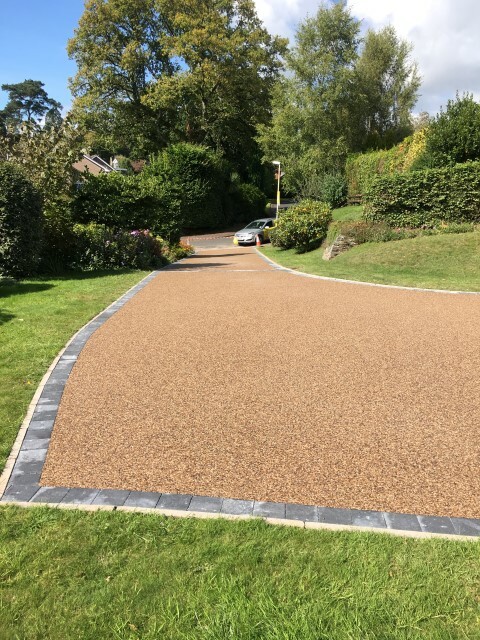 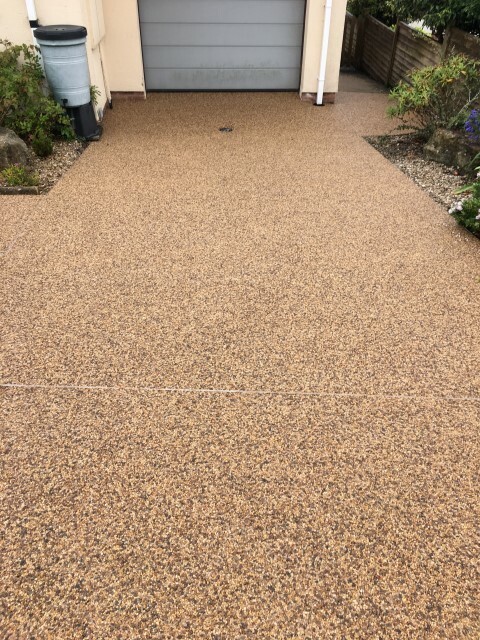 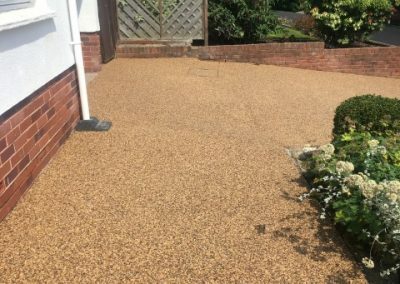 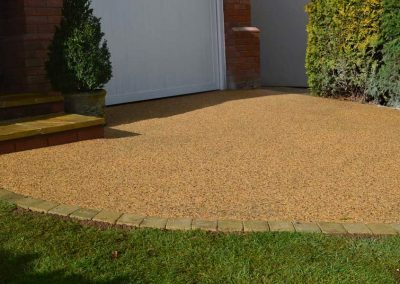 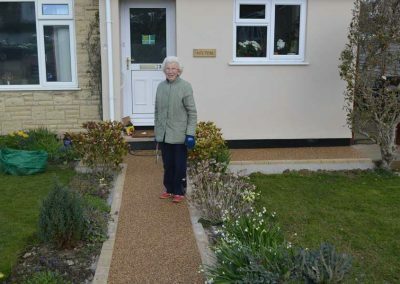 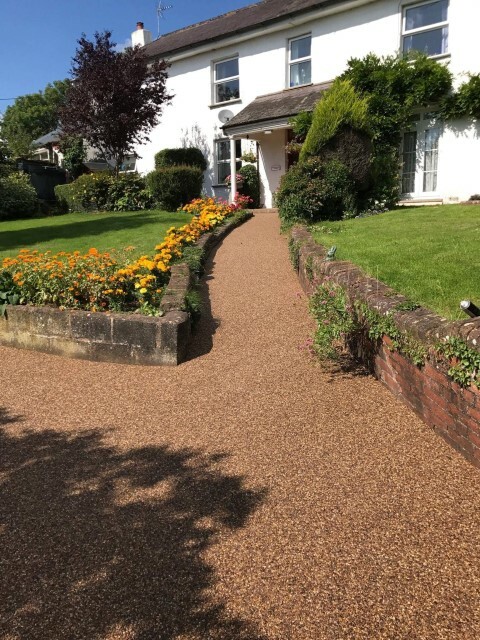 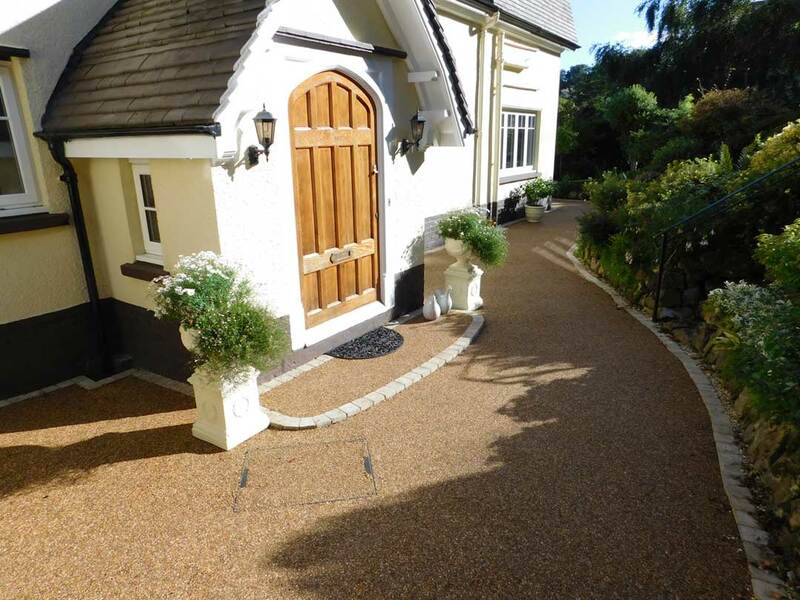 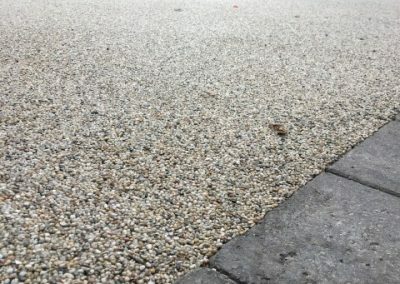 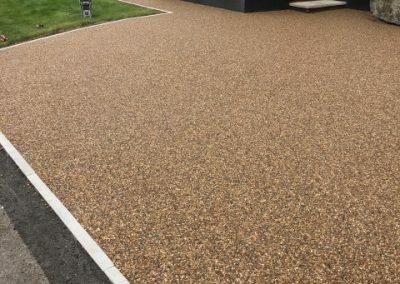 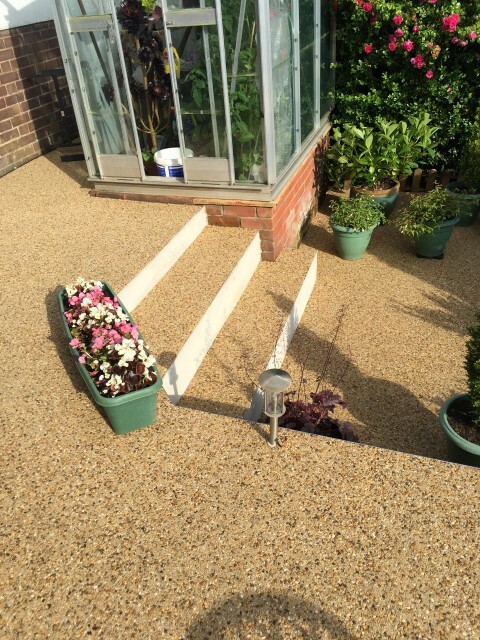 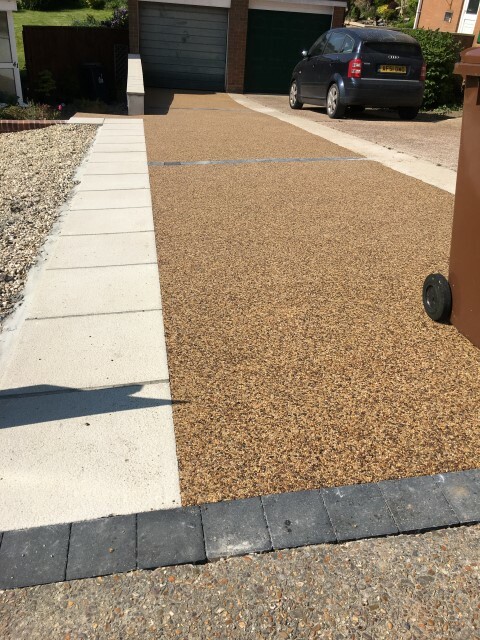 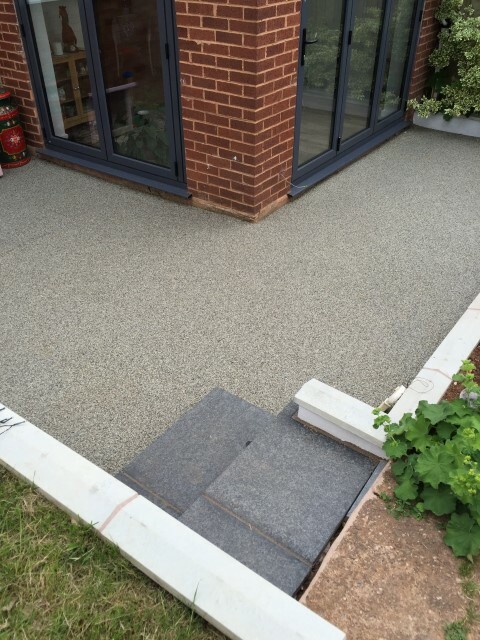 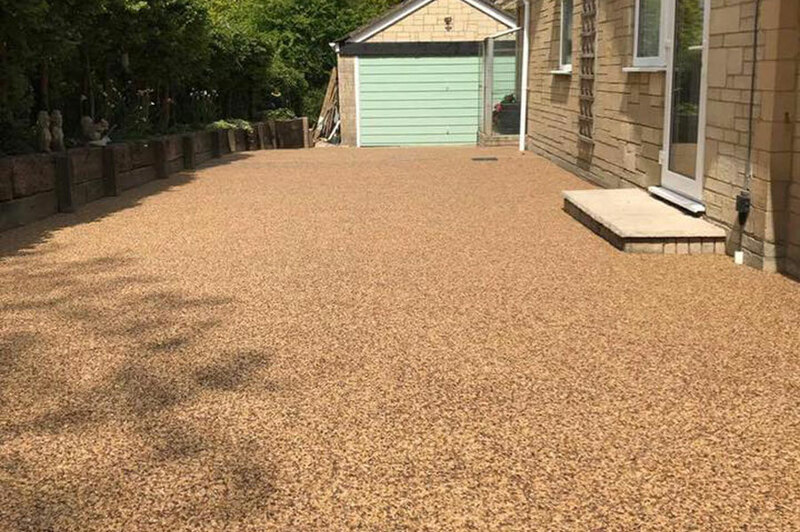 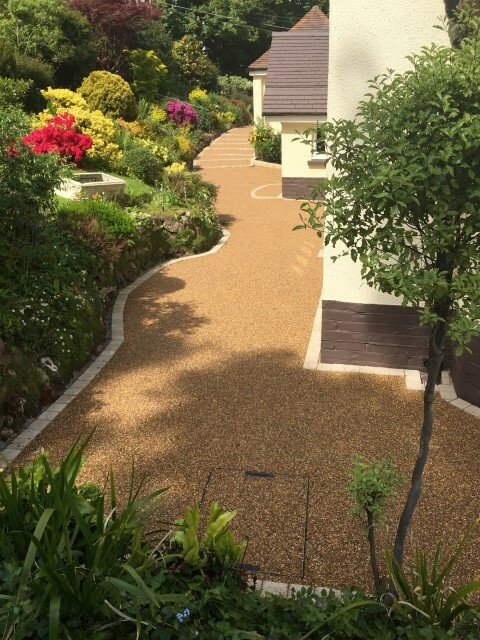 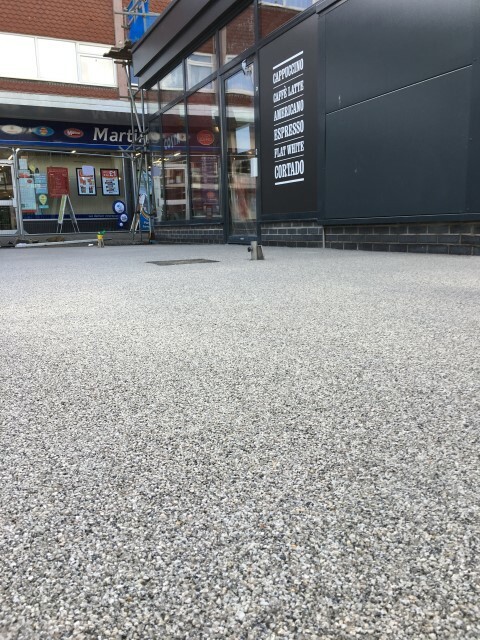 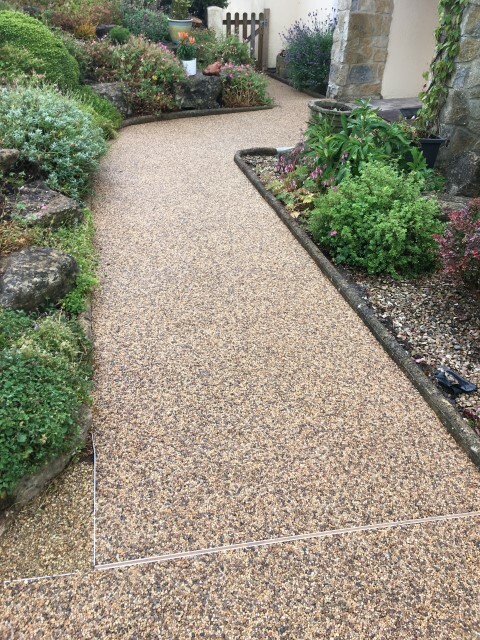 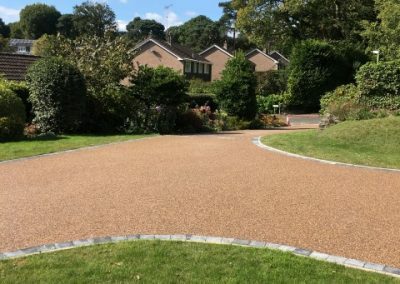 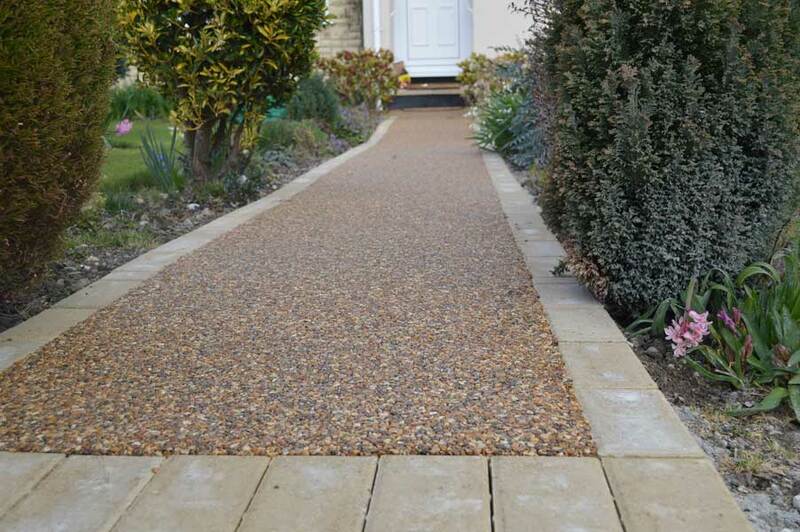 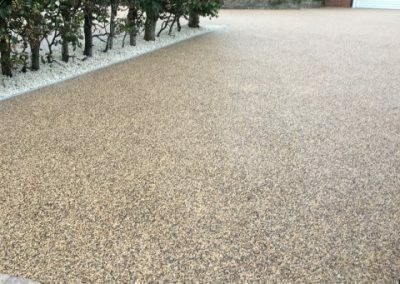 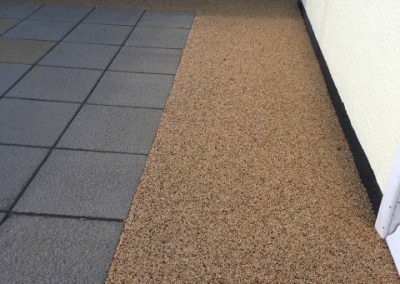 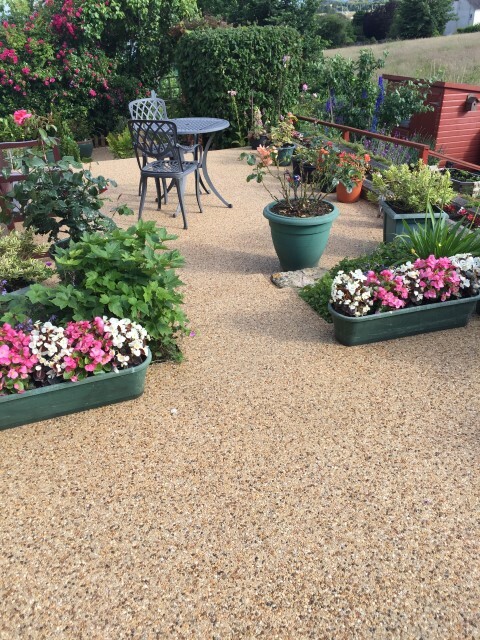 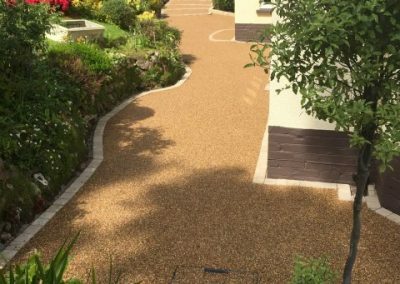 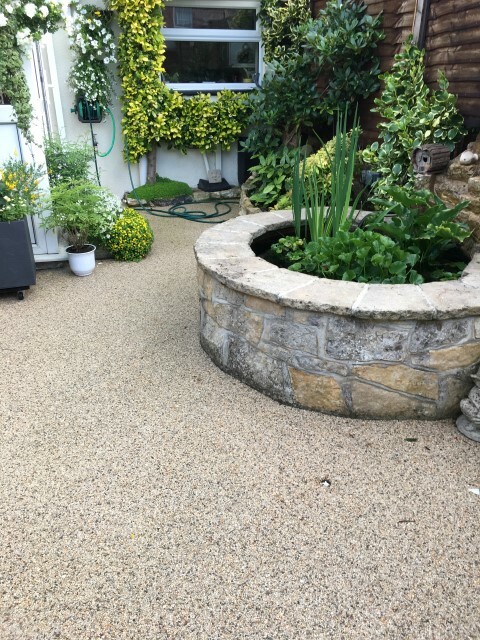 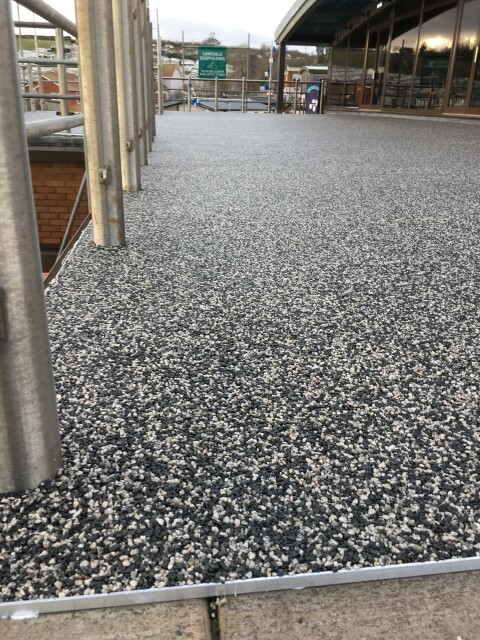 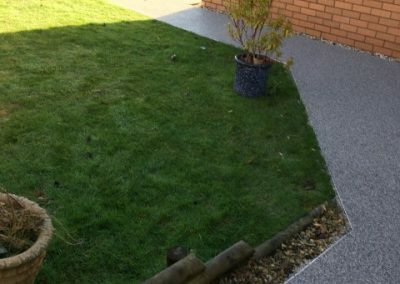 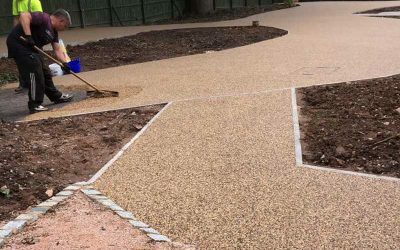 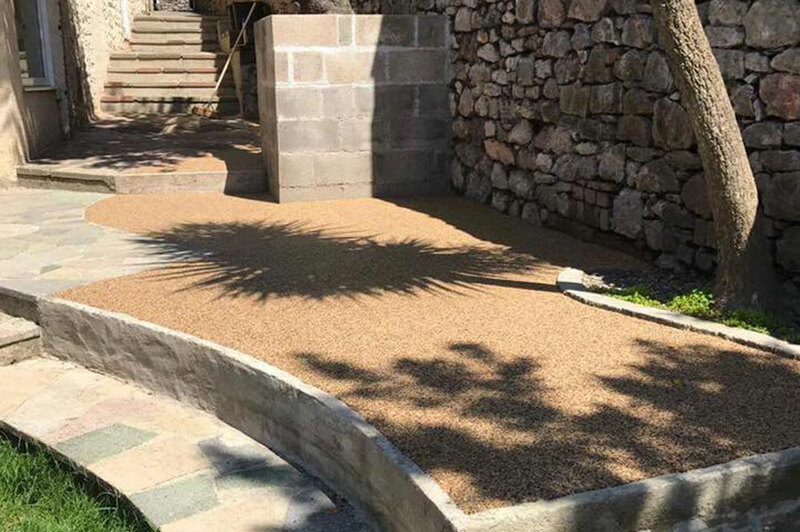 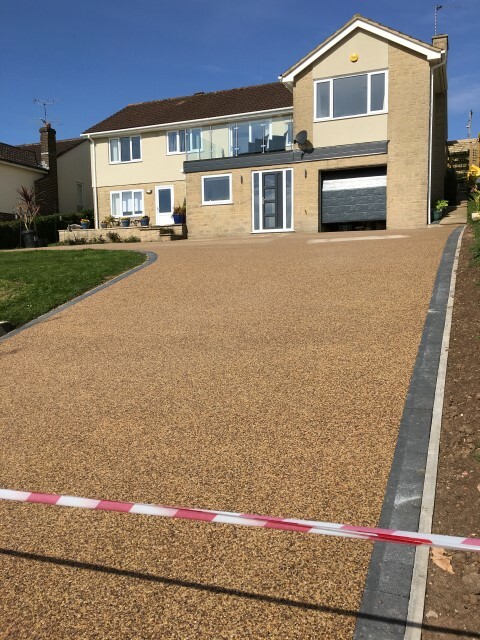 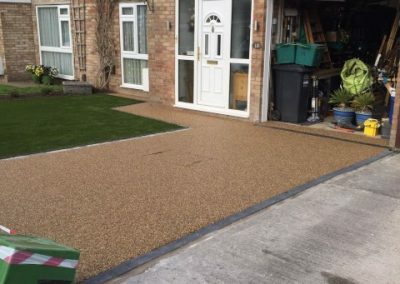 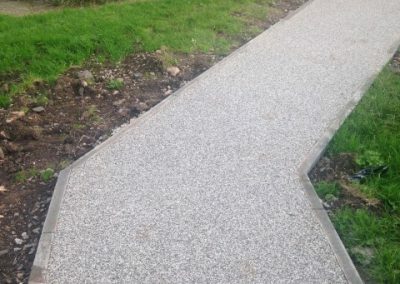 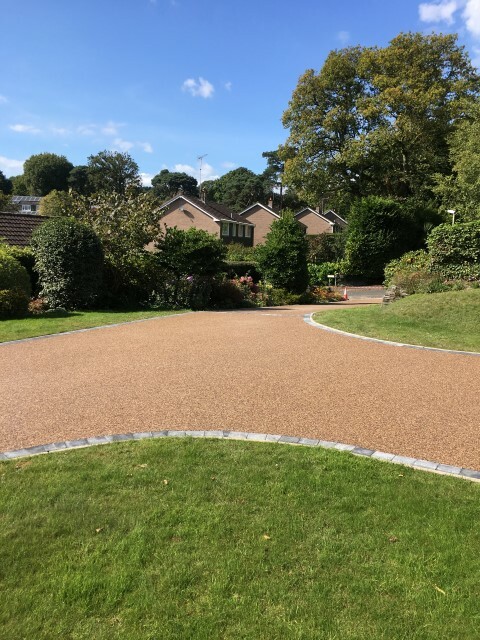 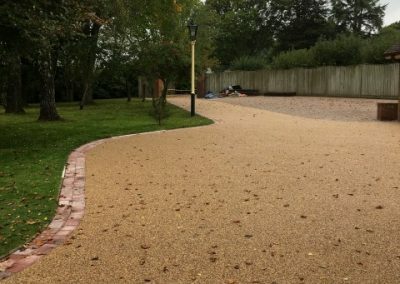 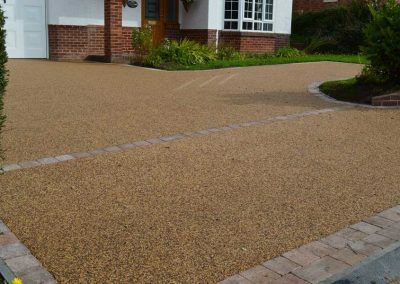 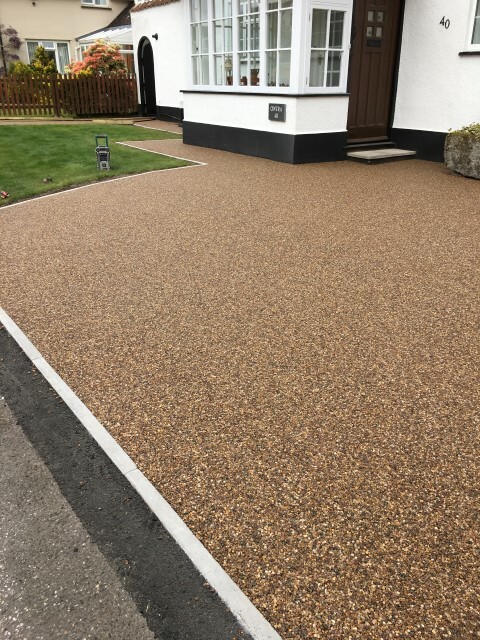 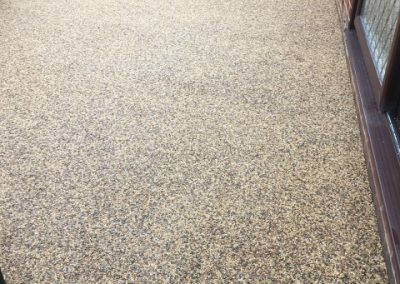 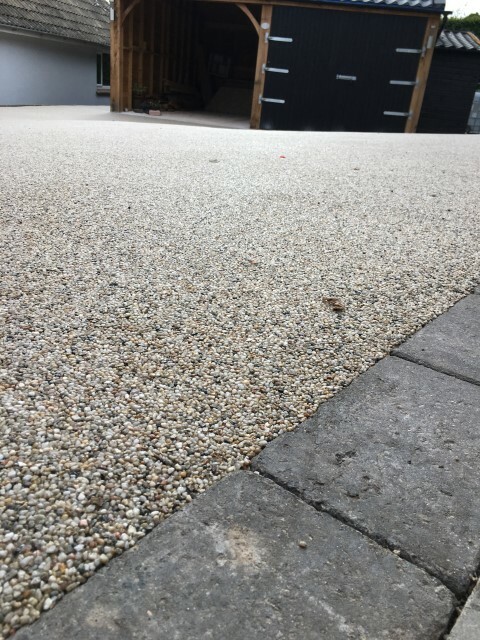 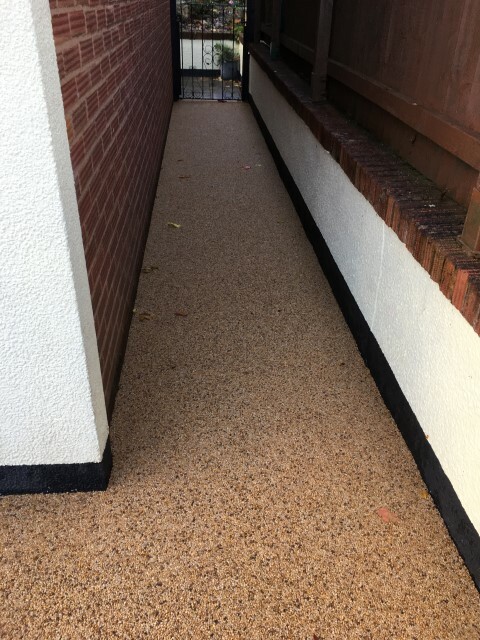 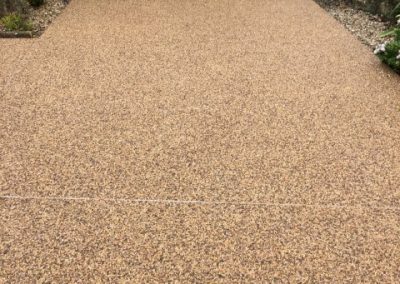 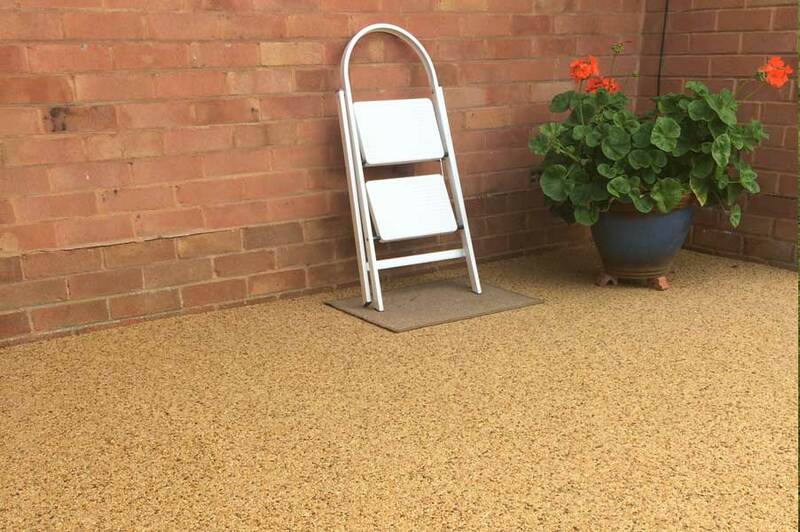 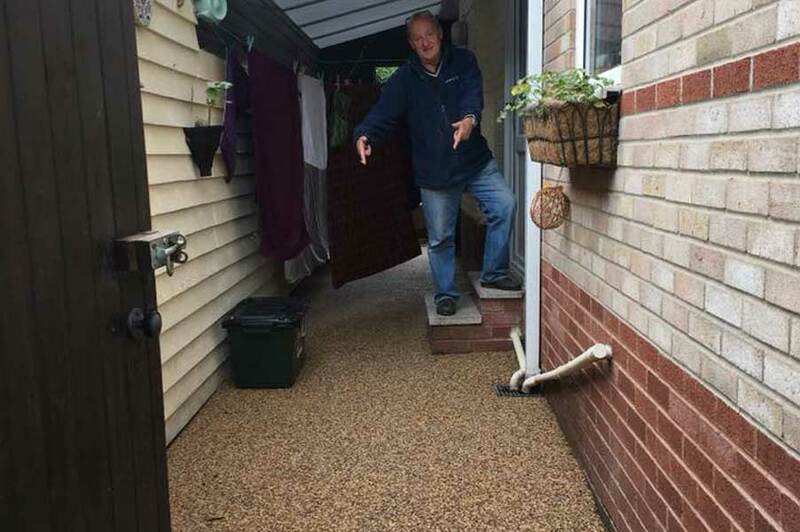 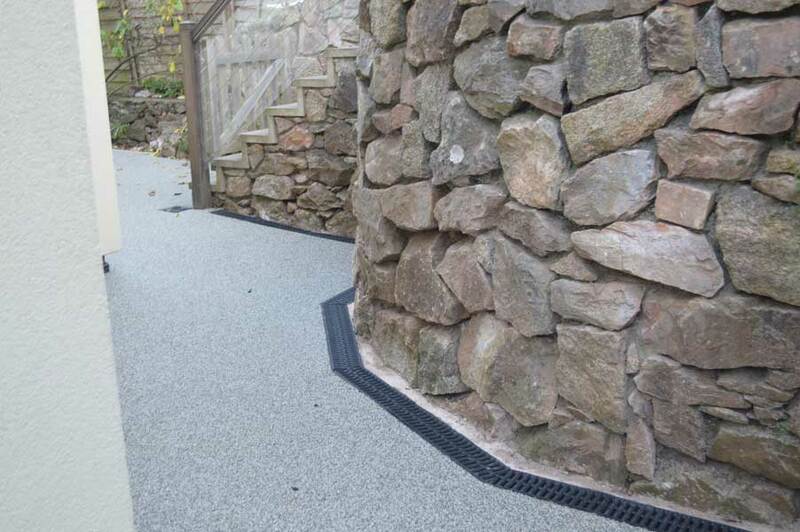 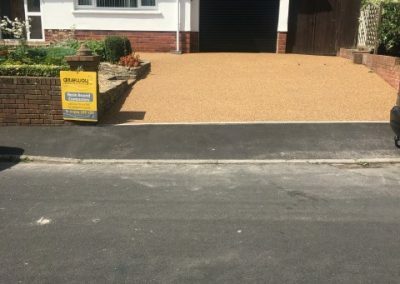 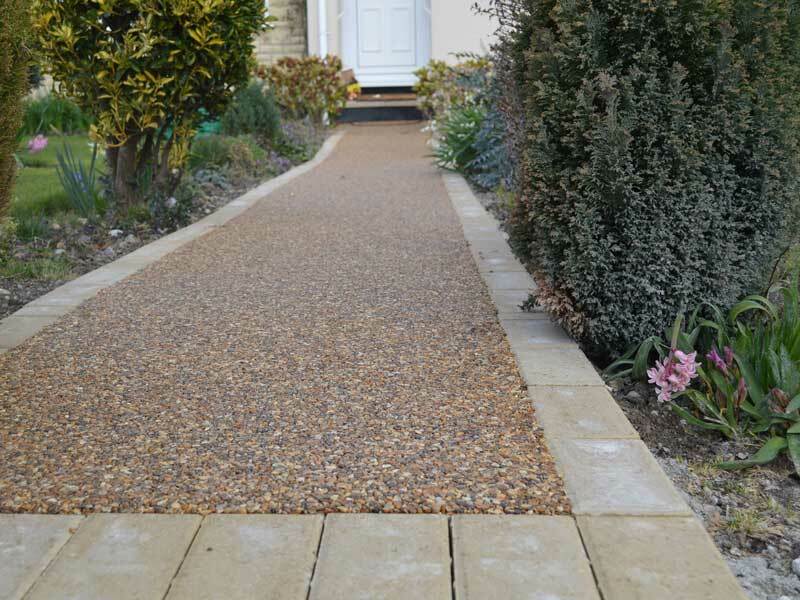 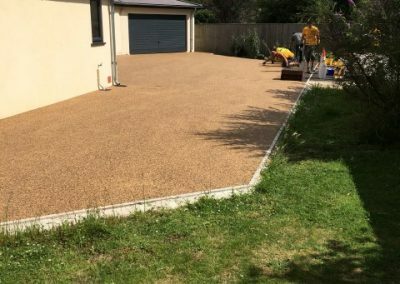 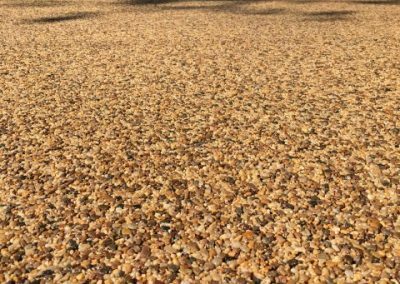 Resin bound aggregate provides a tough, easy to maintain and aesthetically pleasing surface that gives the appearance of natural gravel without the associated disadvantages. 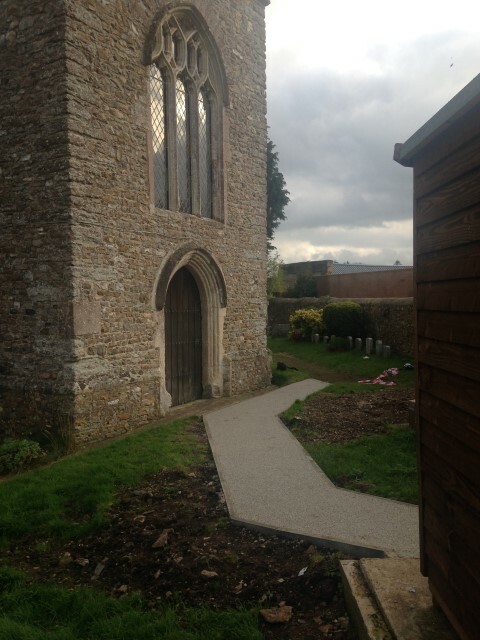 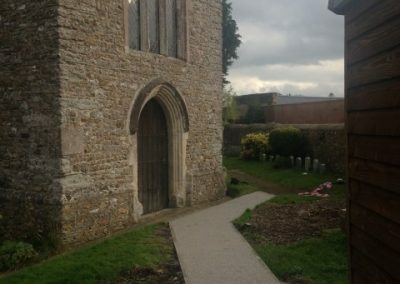 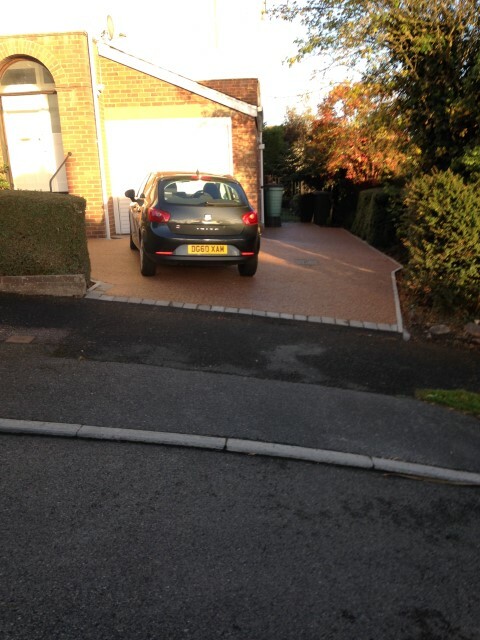 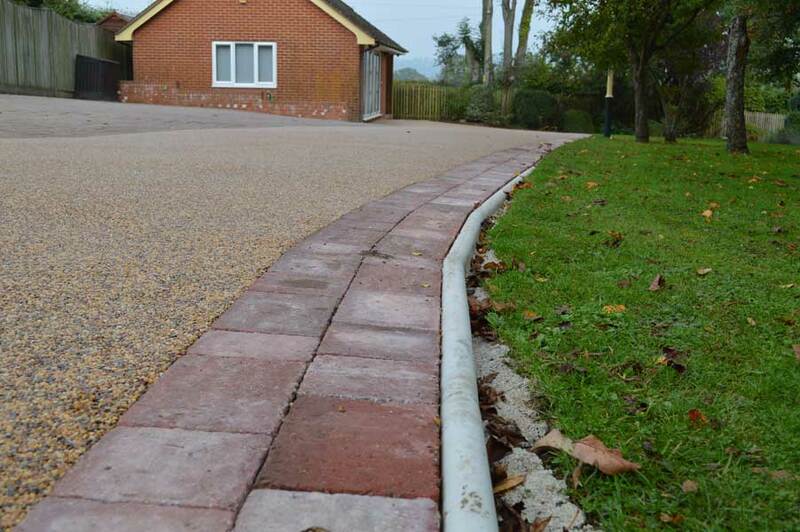 An existing base of either tarmac or concrete can be utilised if it is of a suitable condition. 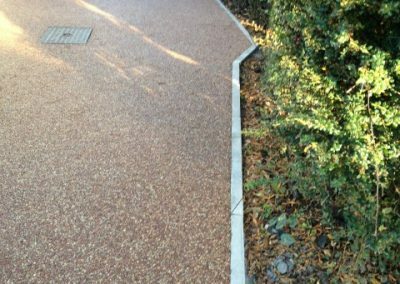 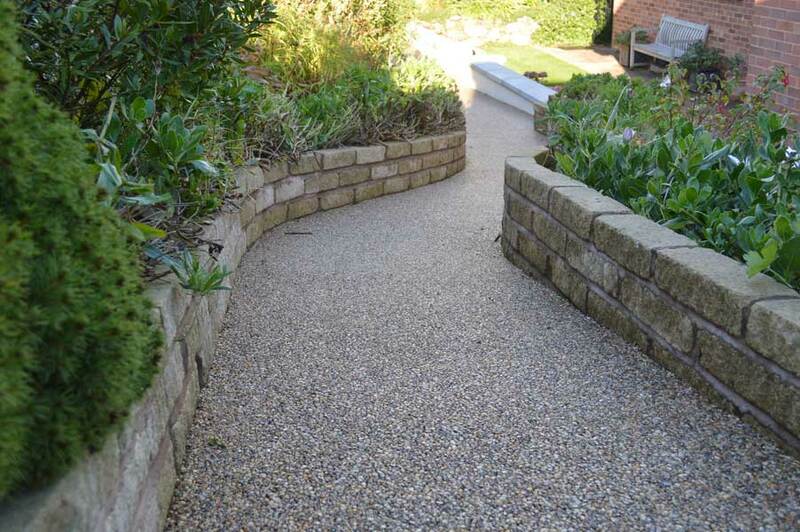 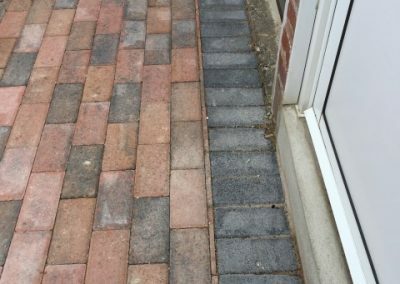 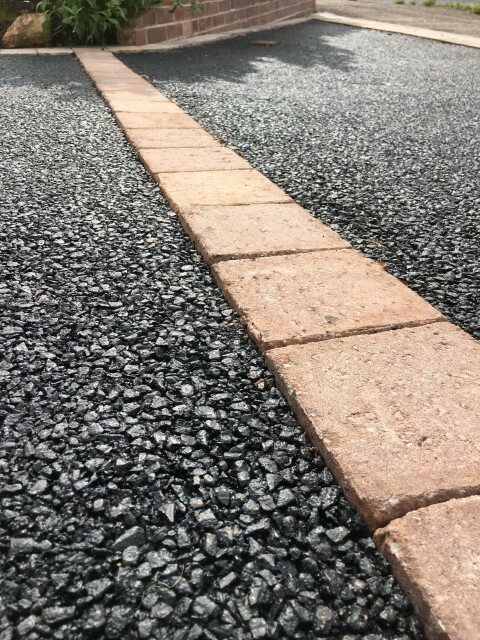 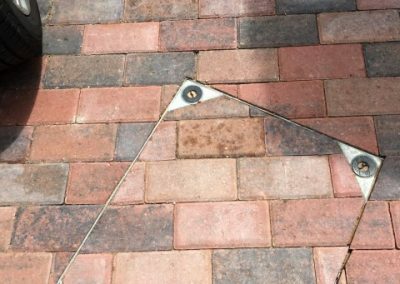 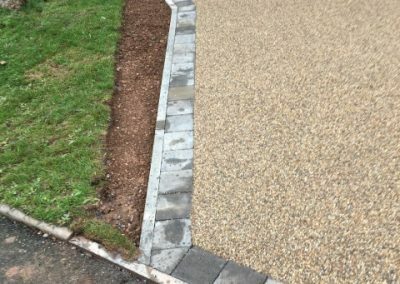 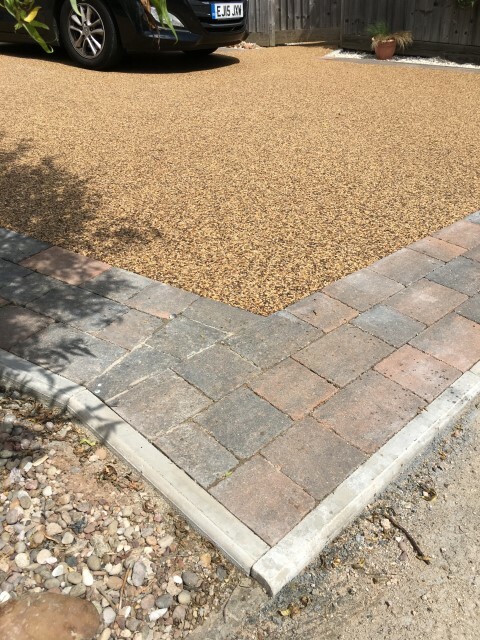 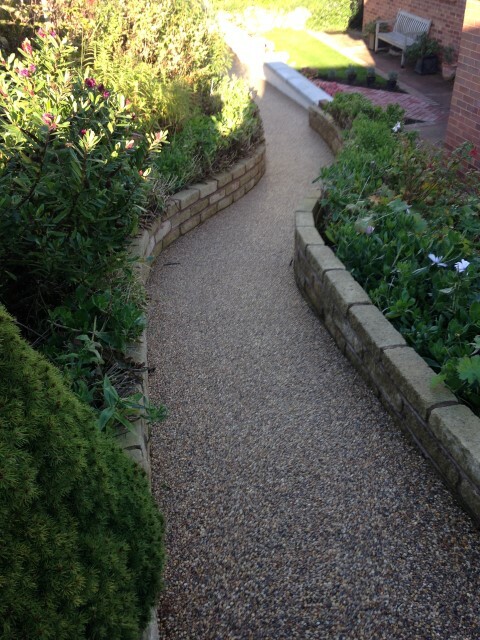 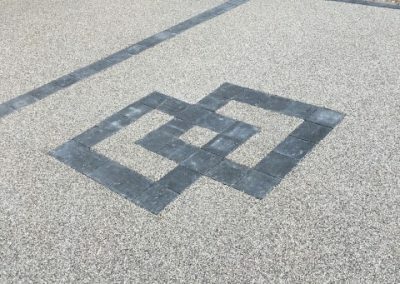 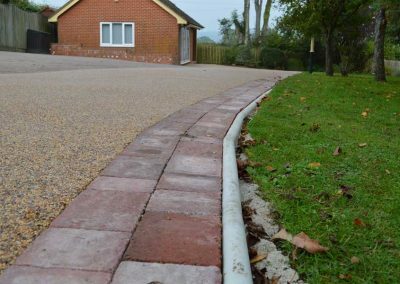 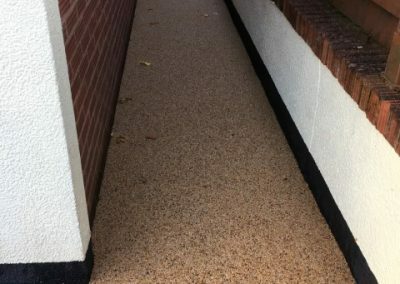 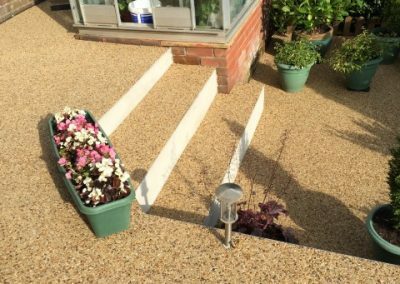 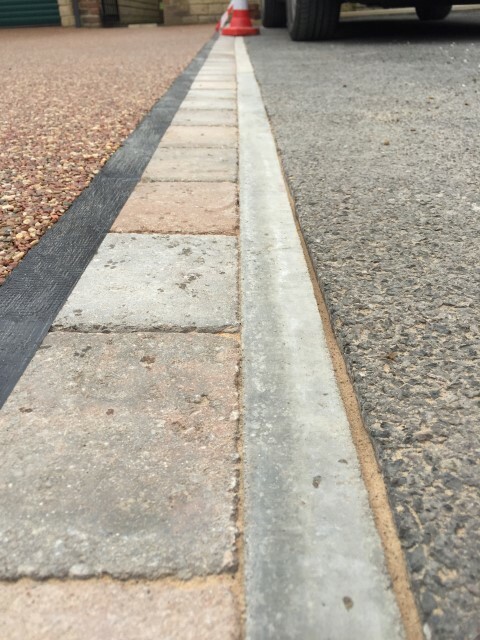 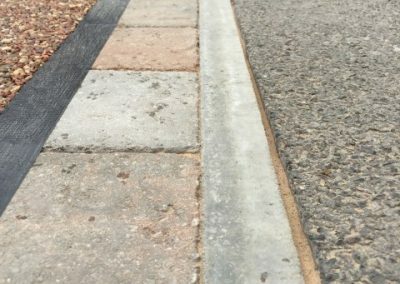 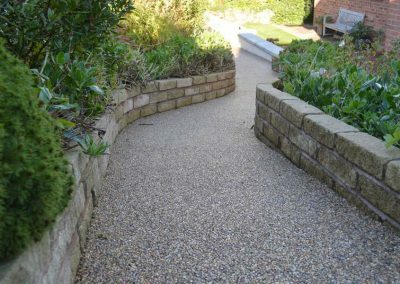 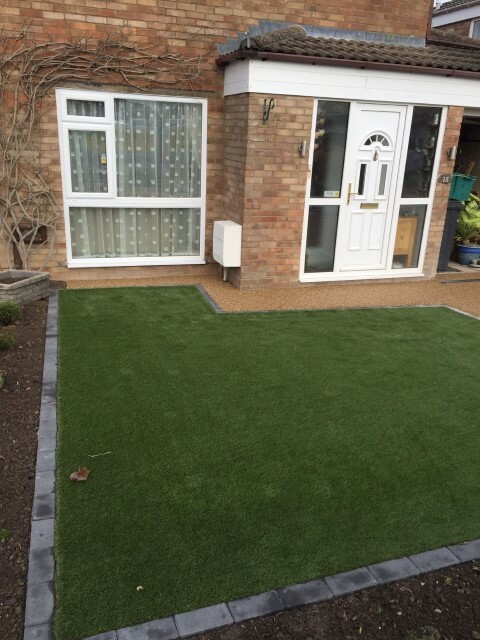 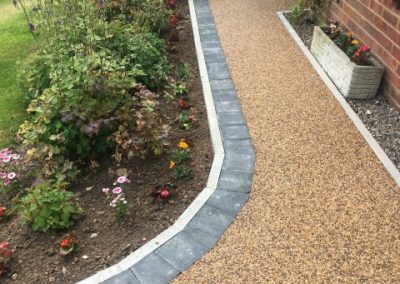 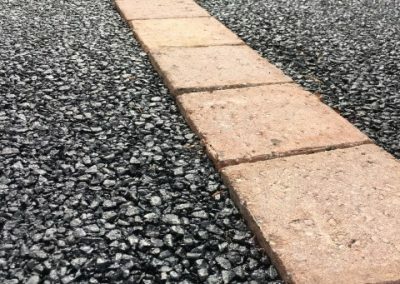 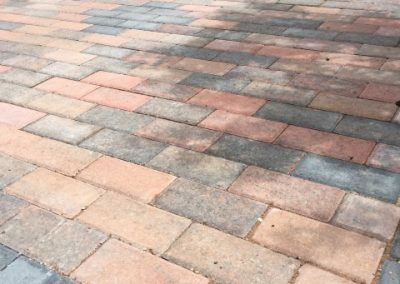 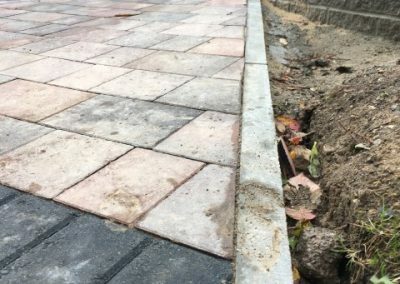 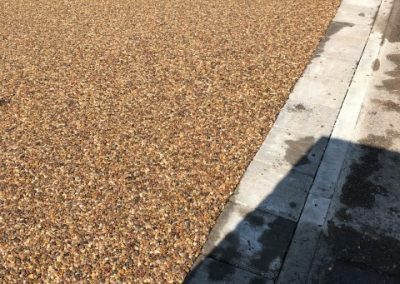 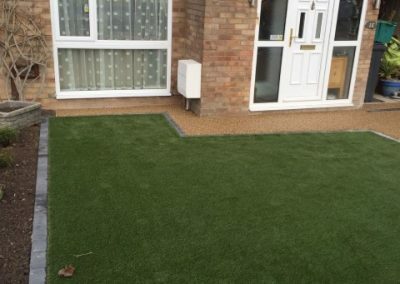 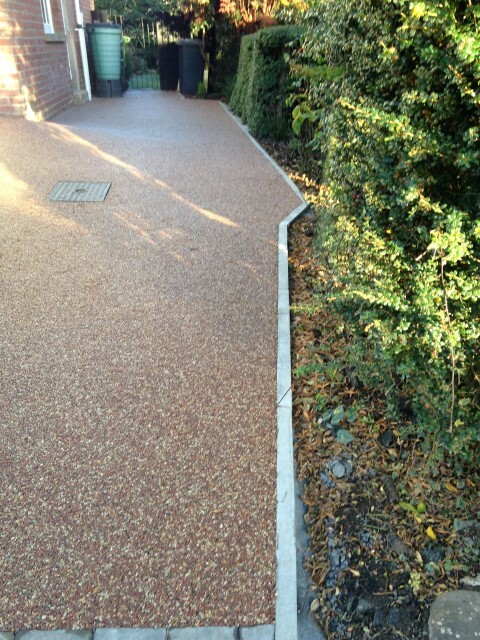 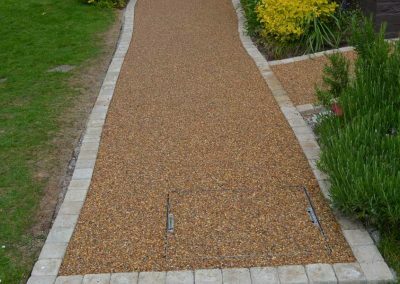 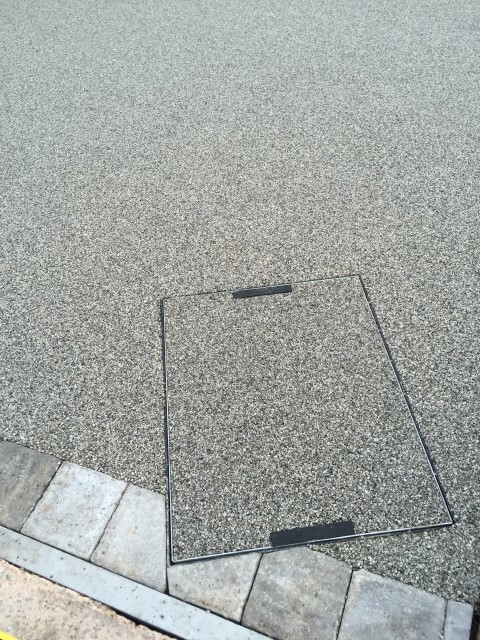 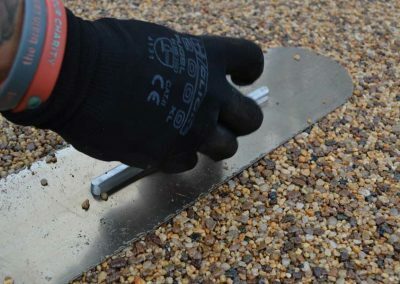 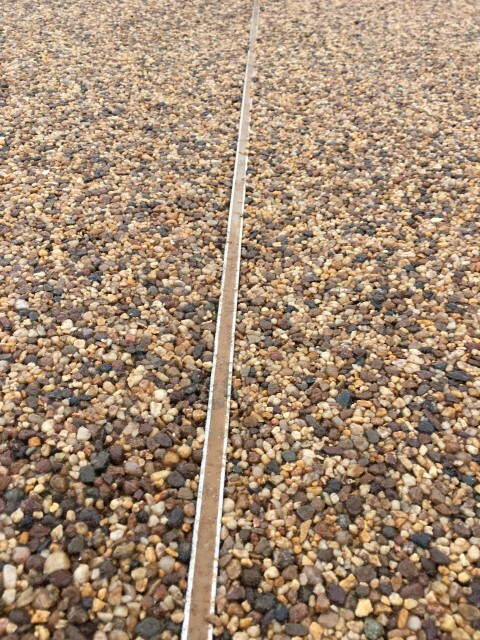 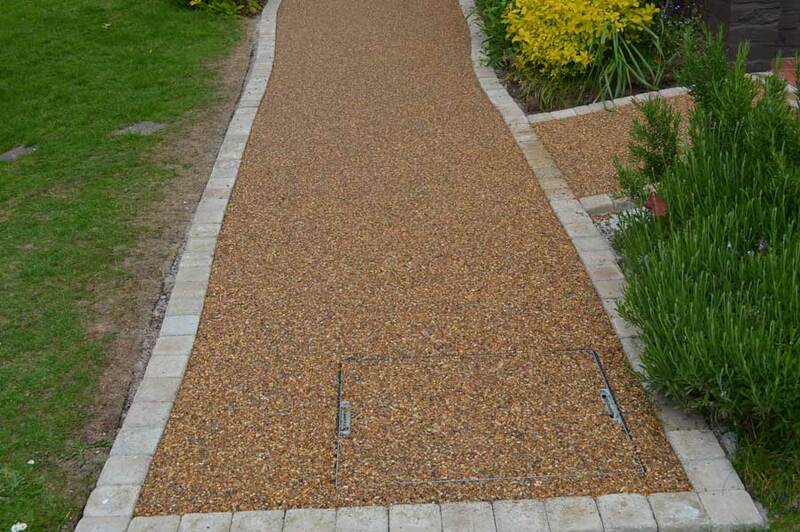 Edgings created from brick, stone, timber or steel should be installed to retain and protect the resin bound surfacing. 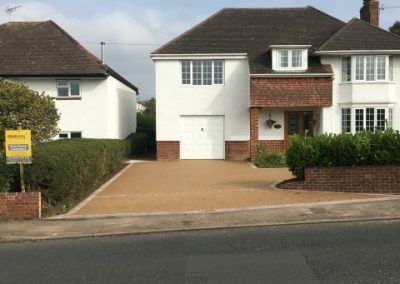 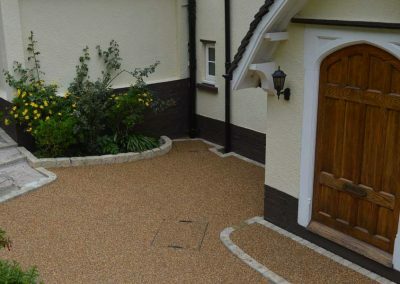 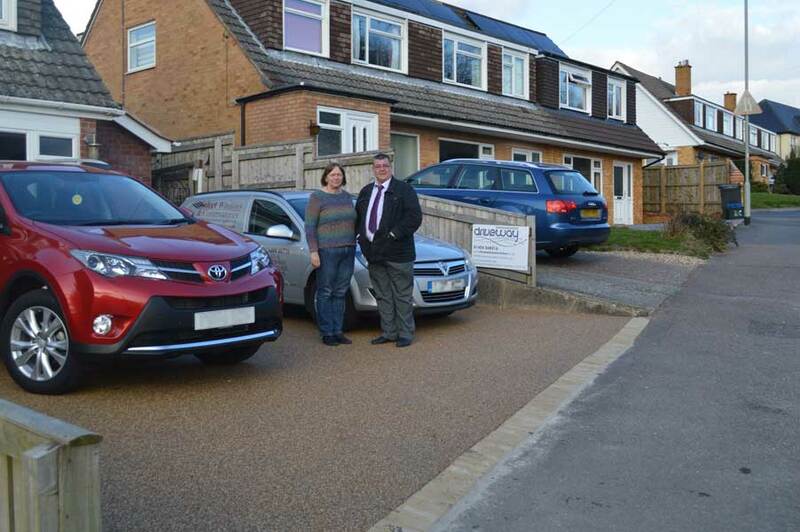 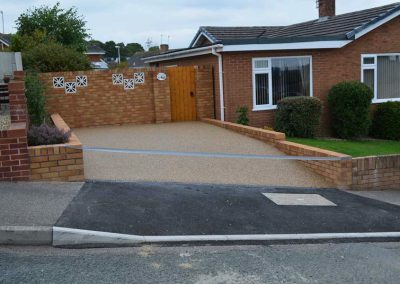 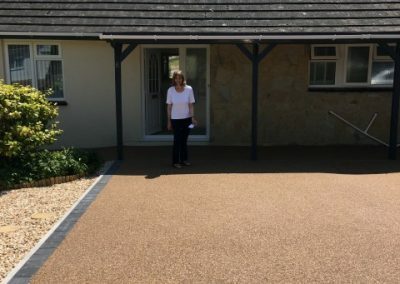 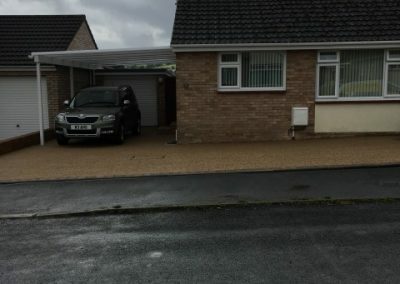 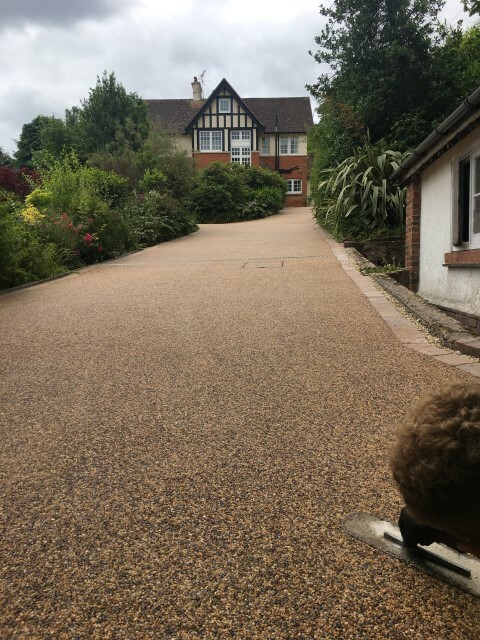 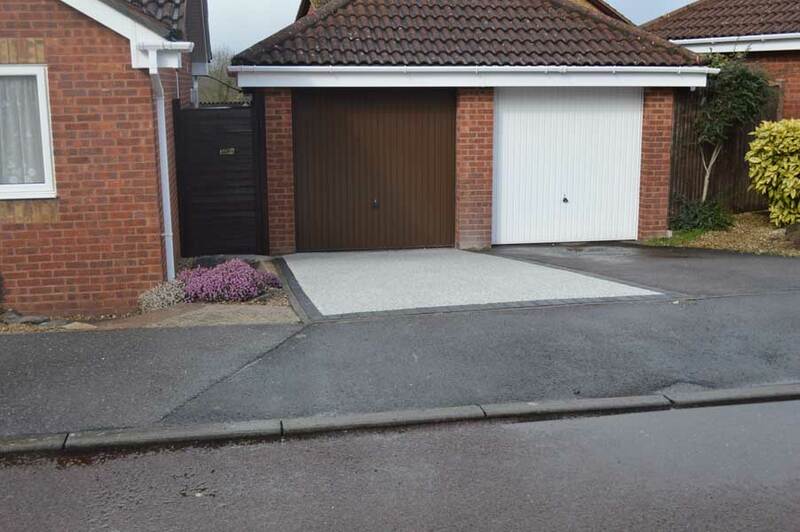 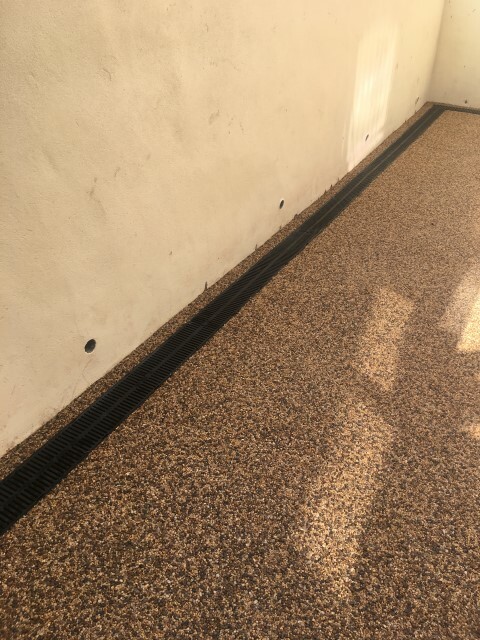 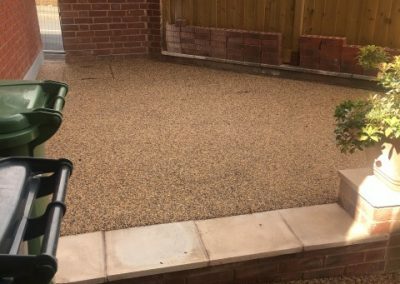 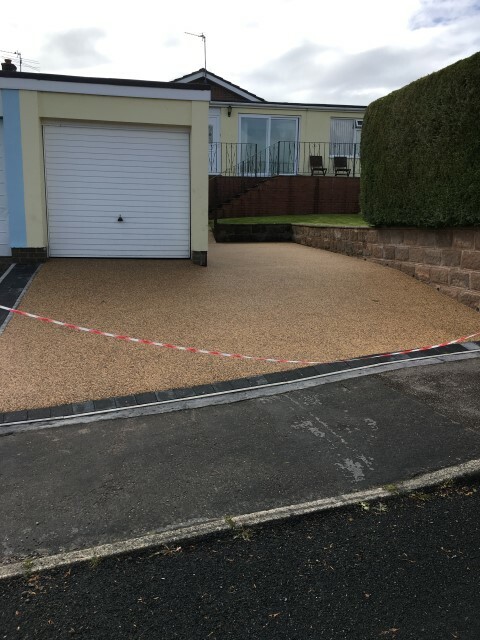 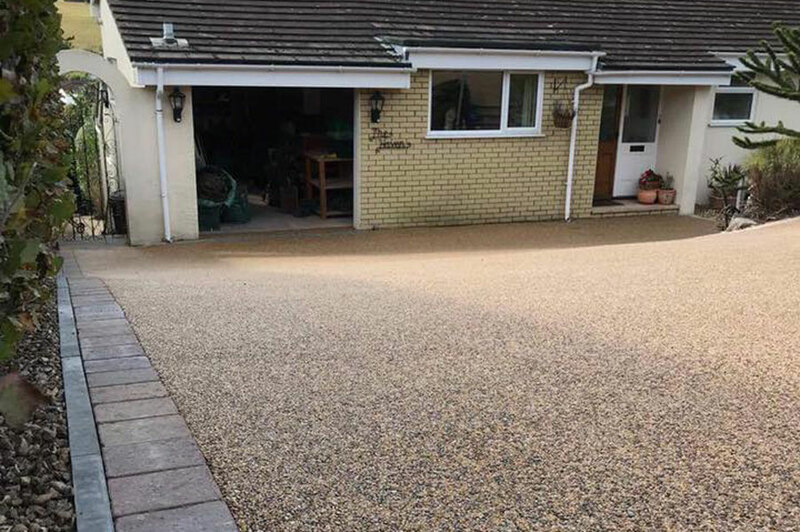 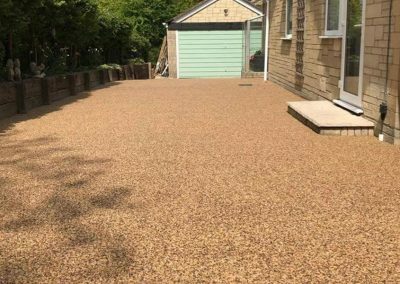 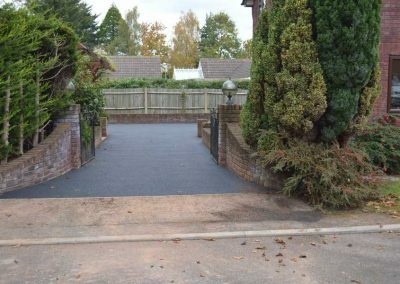 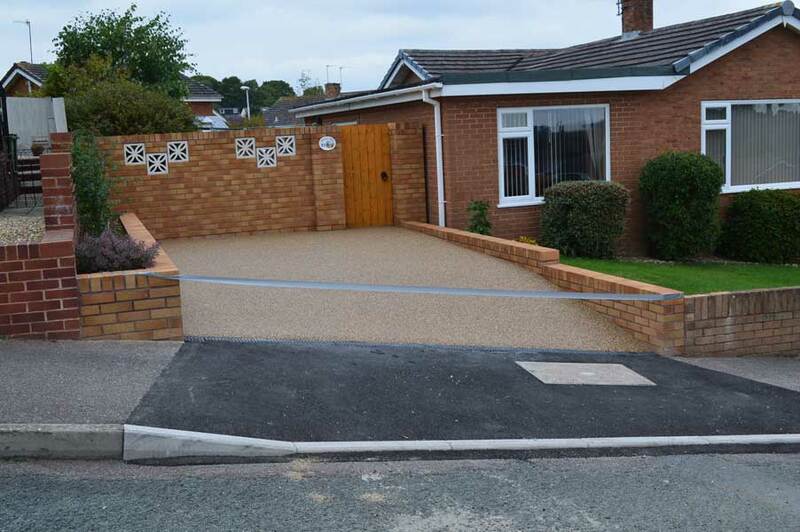 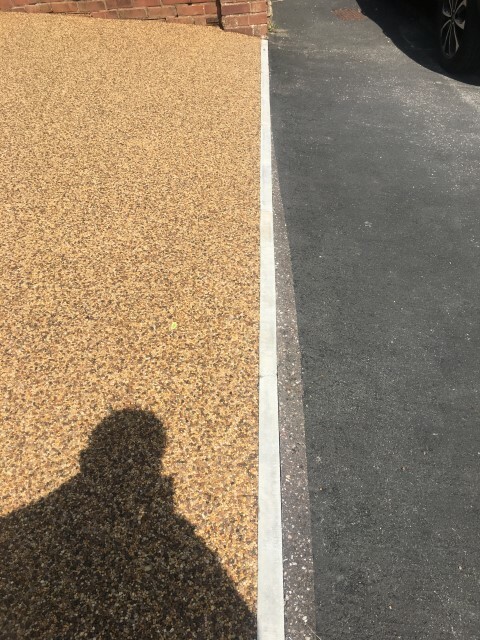 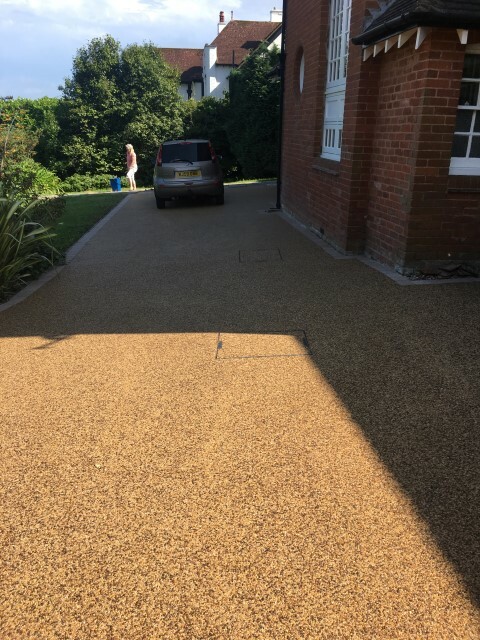 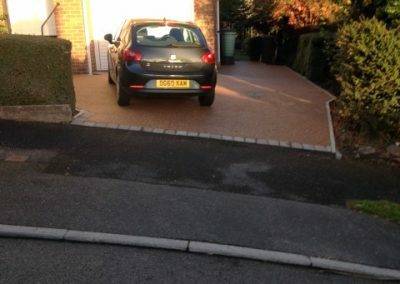 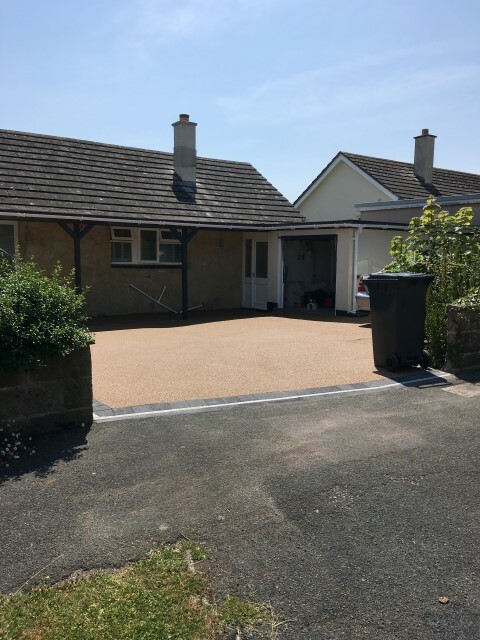 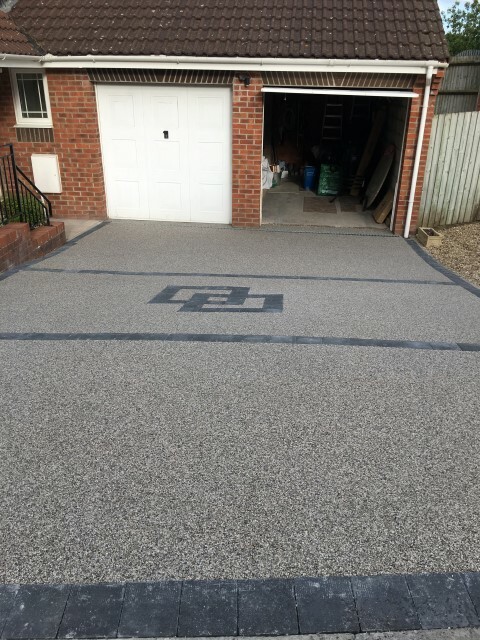 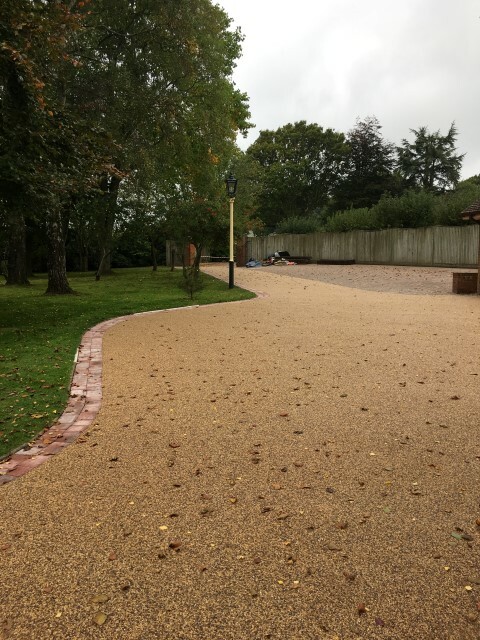 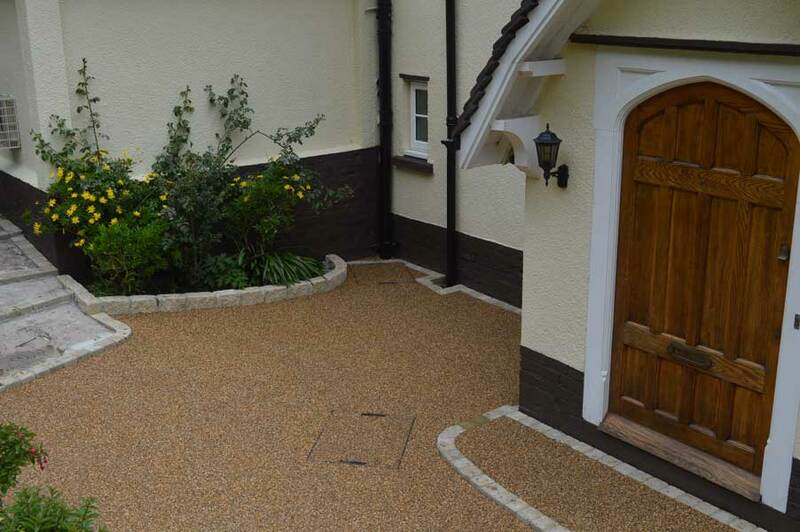 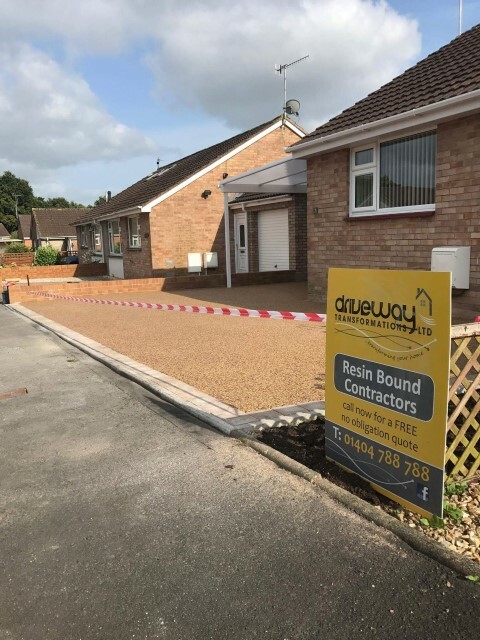 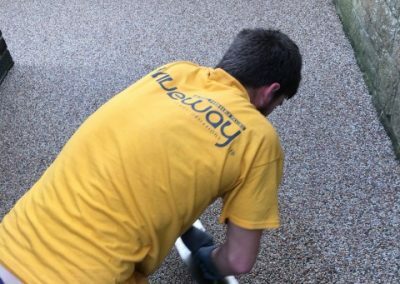 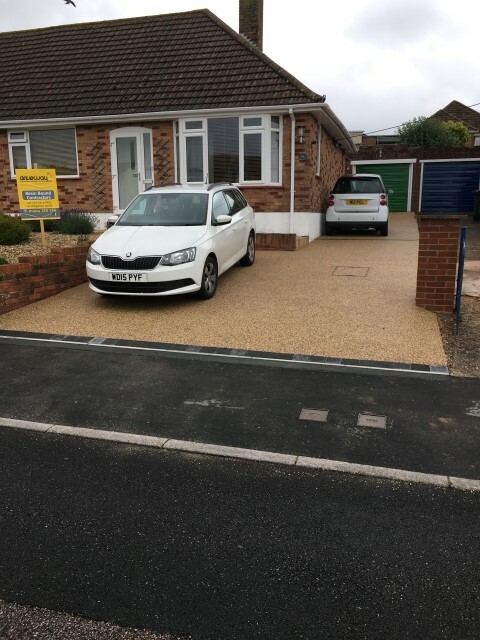 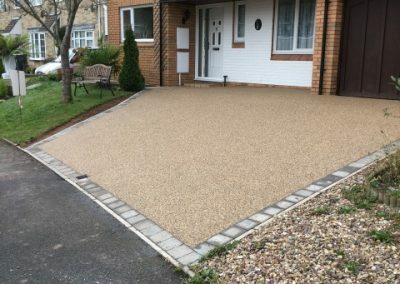 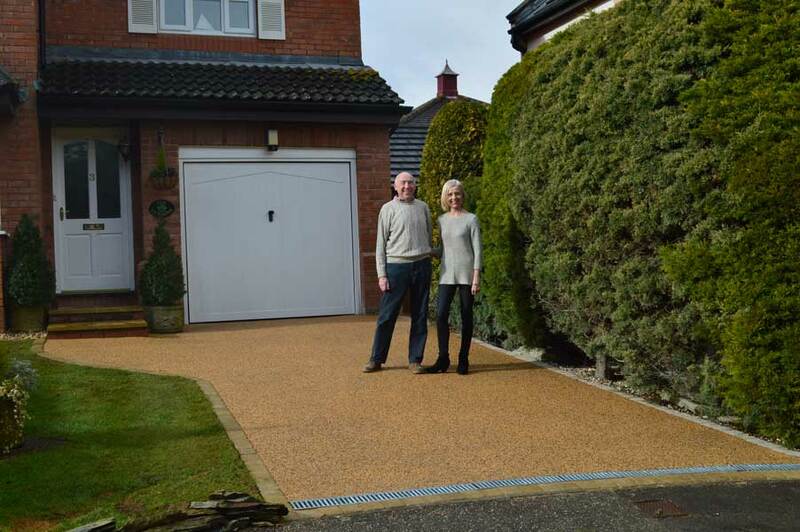 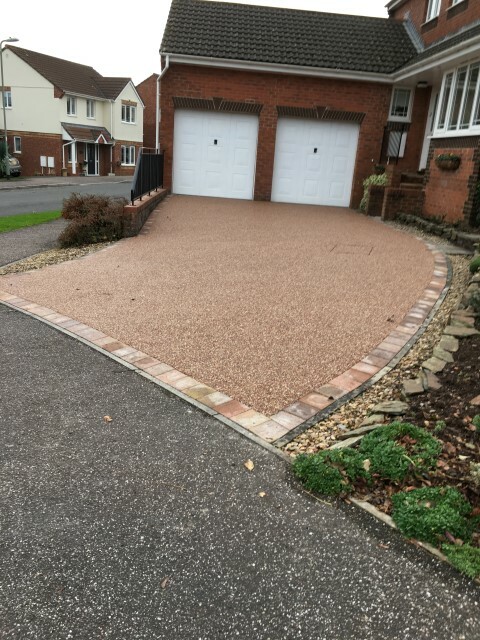 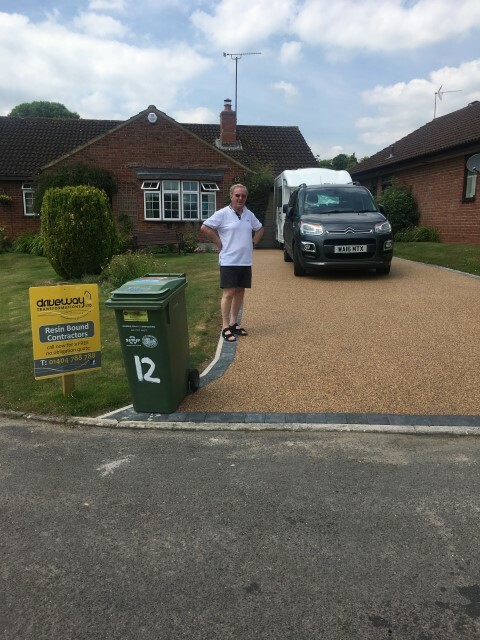 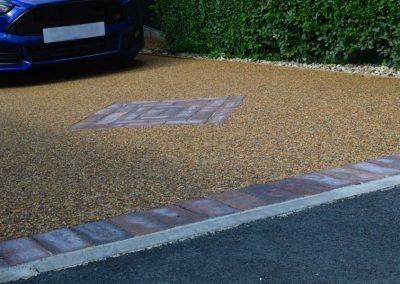 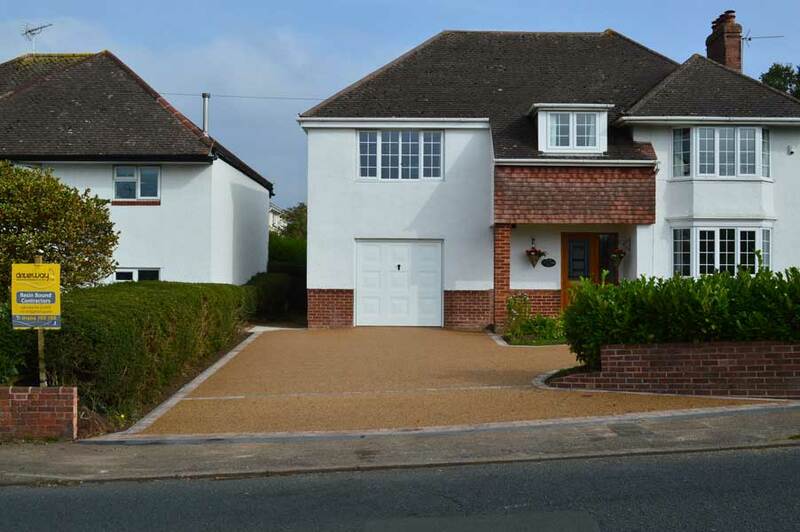 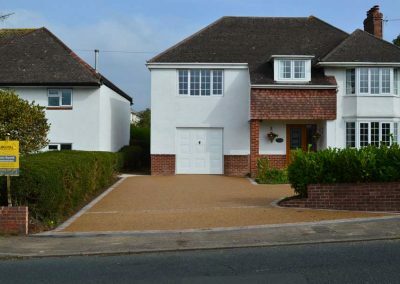 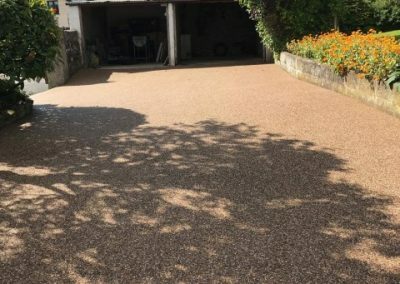 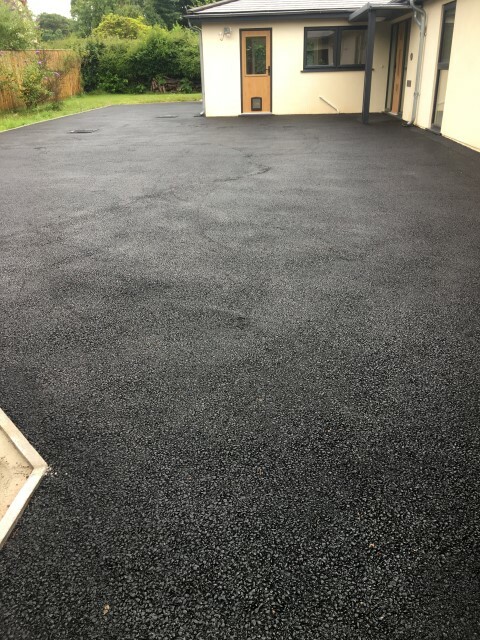 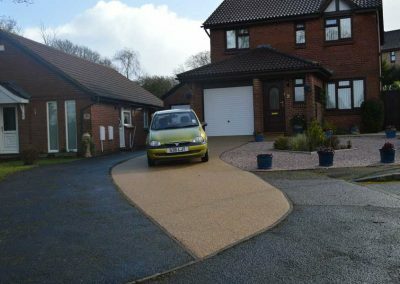 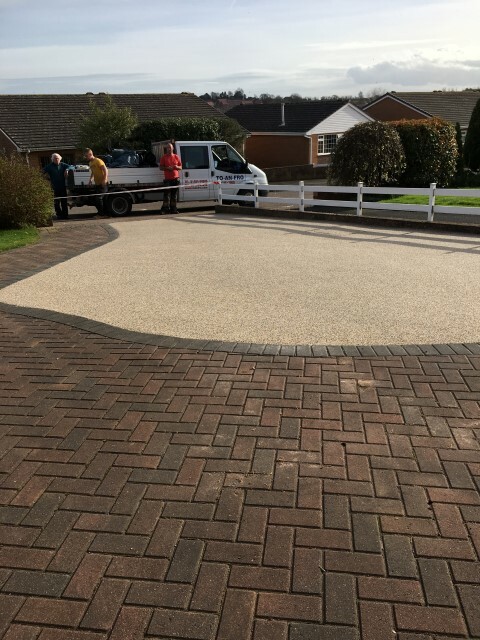 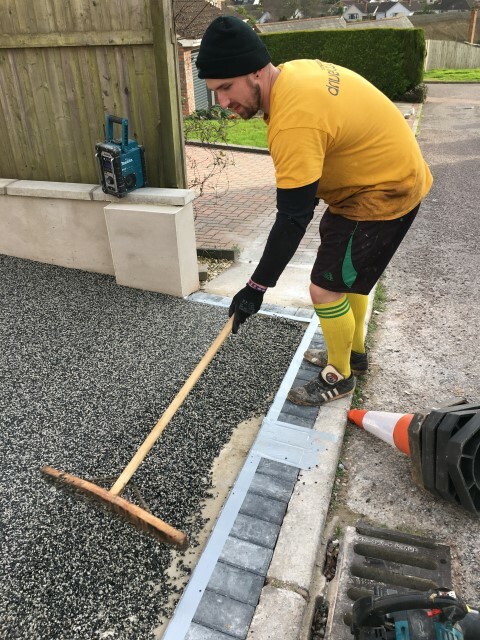 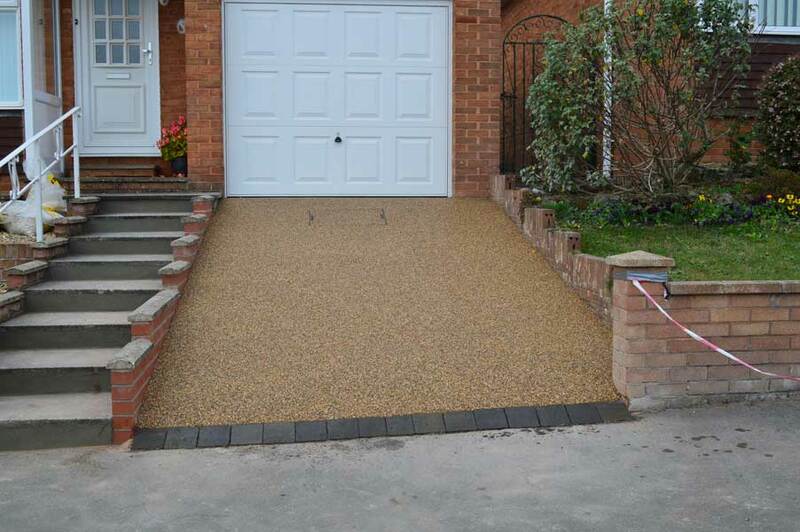 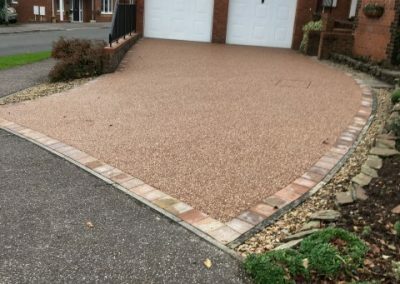 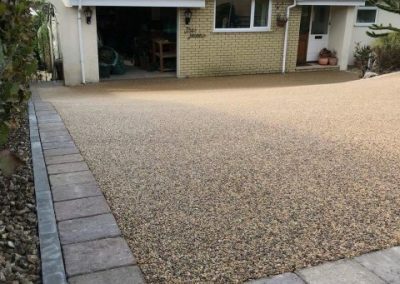 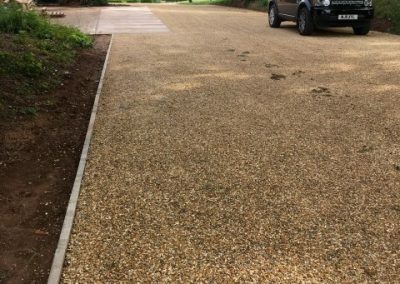 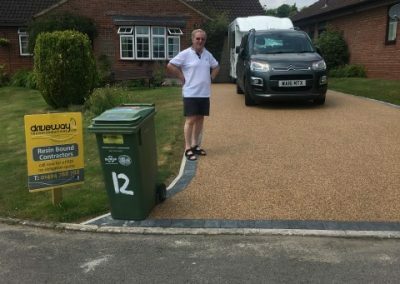 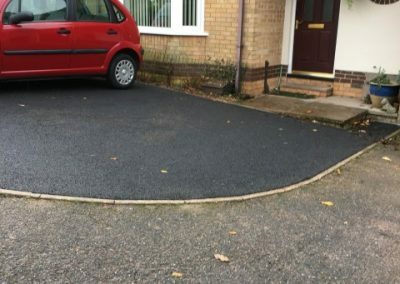 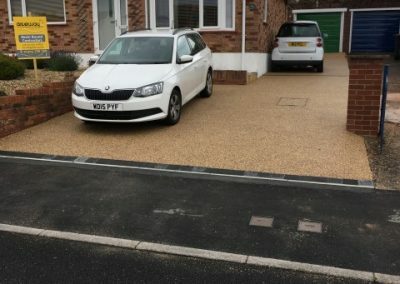 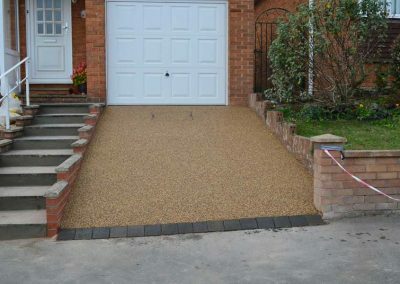 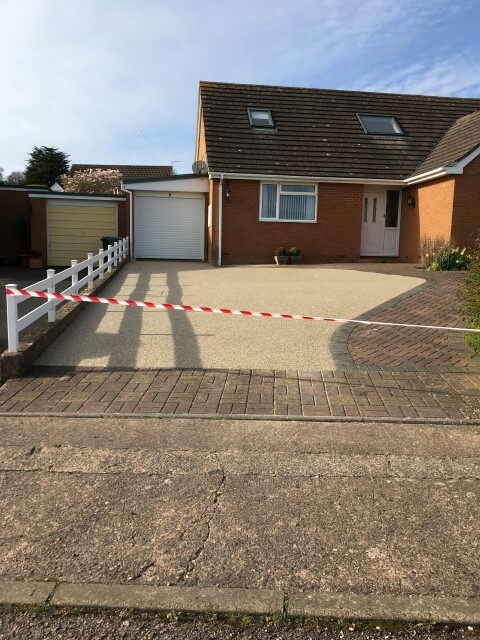 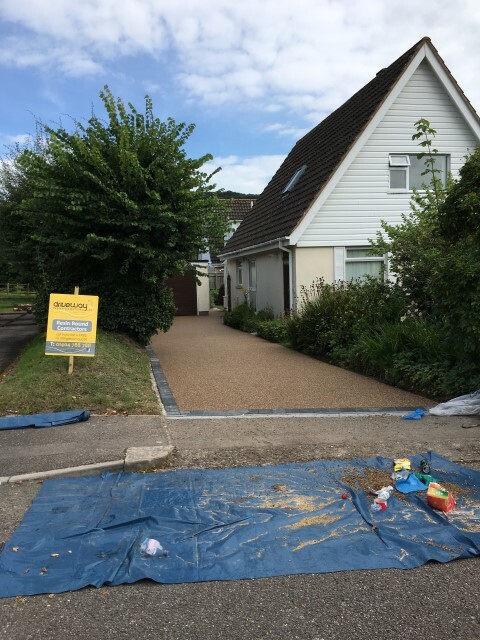 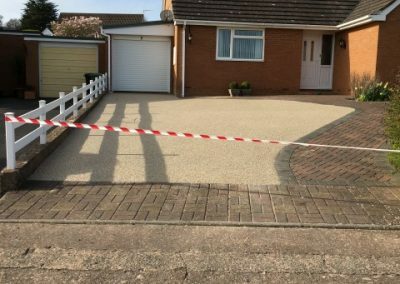 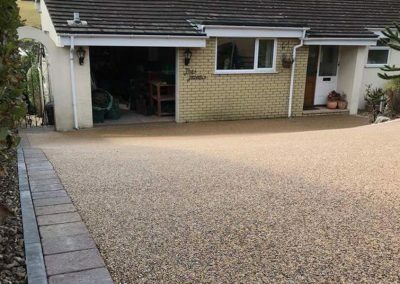 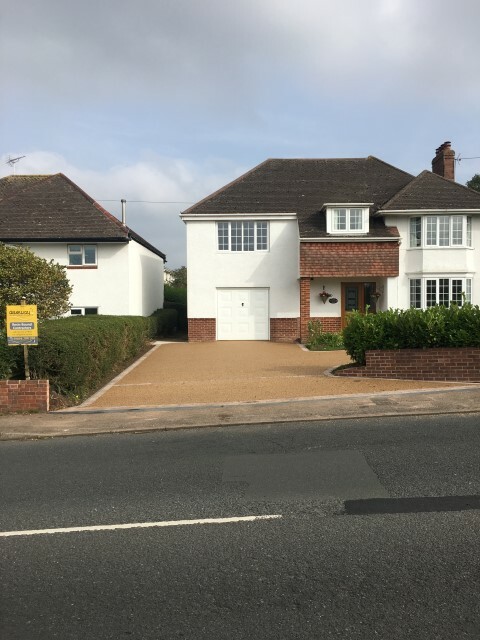 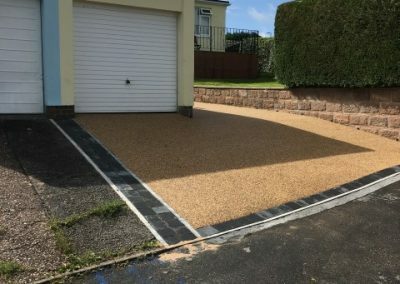 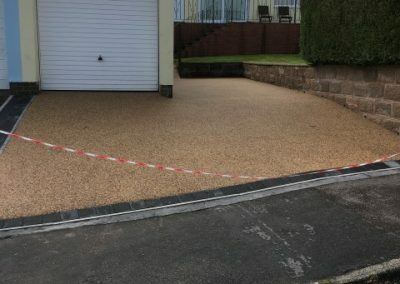 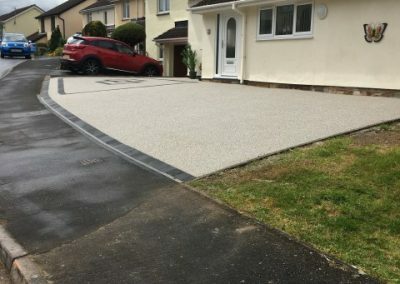 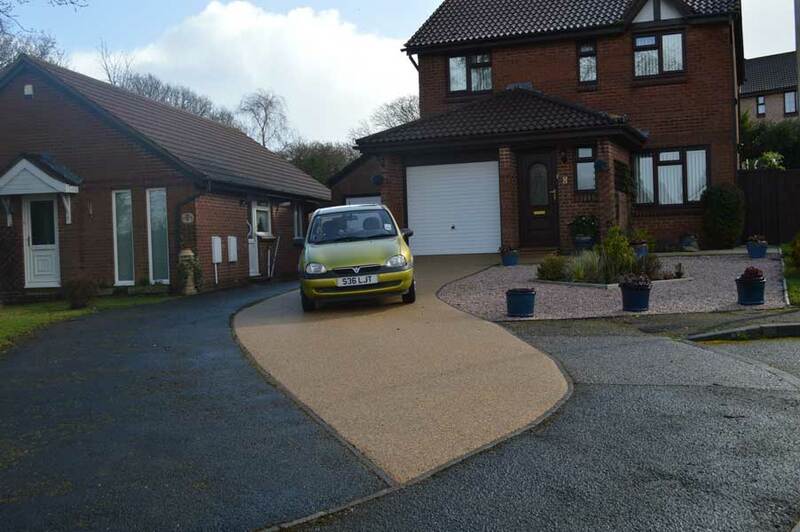 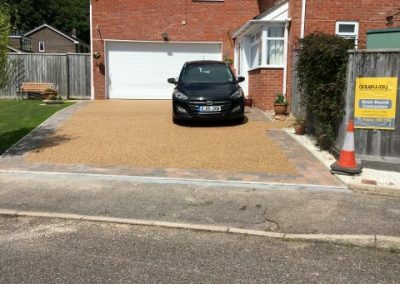 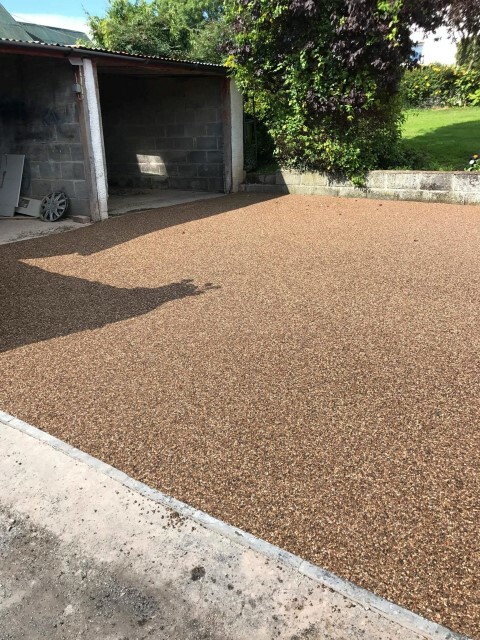 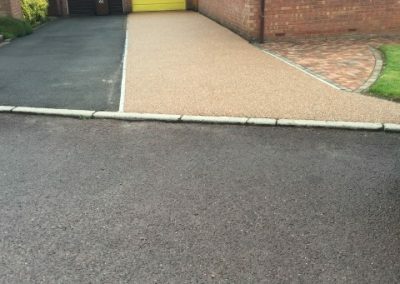 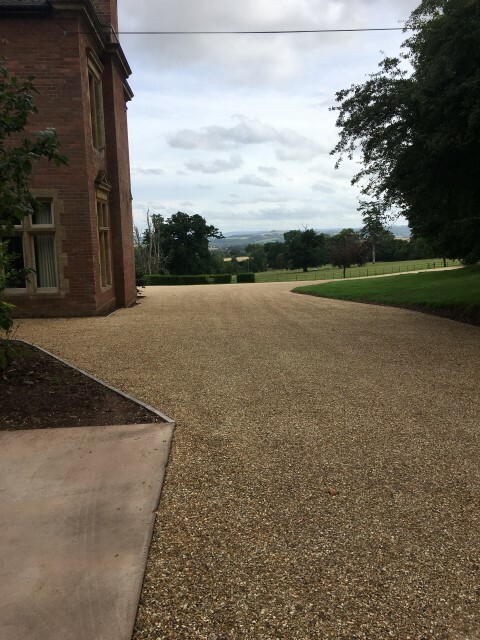 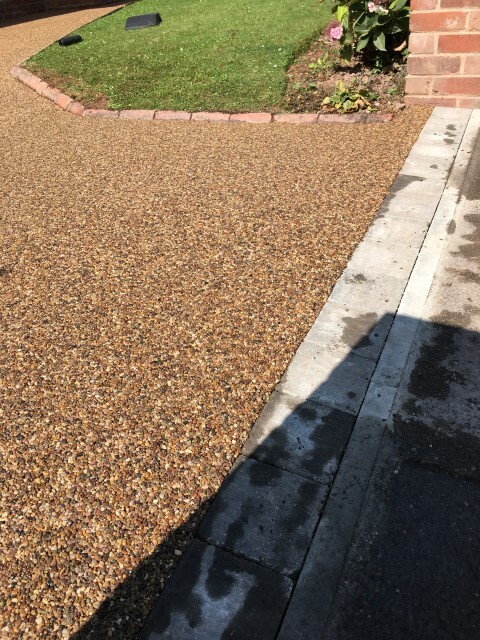 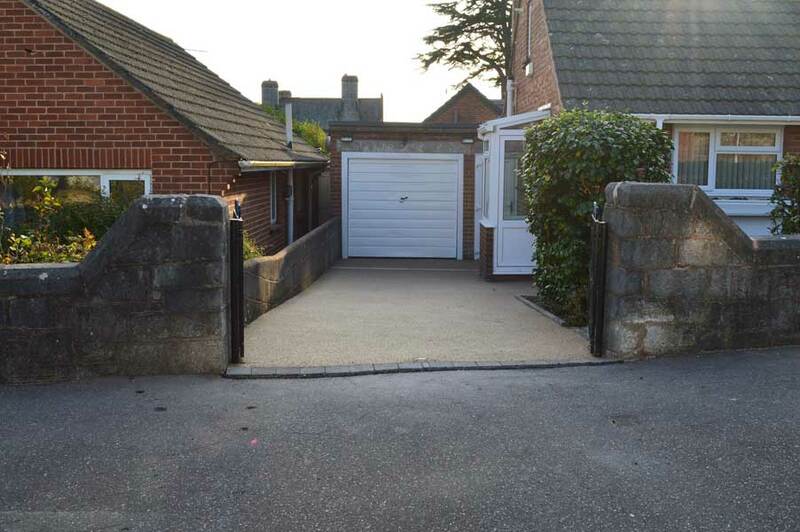 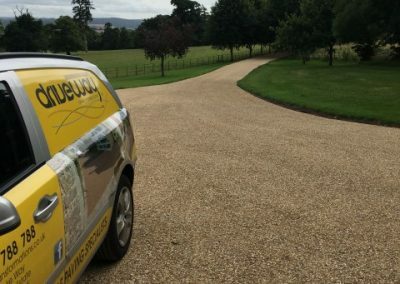 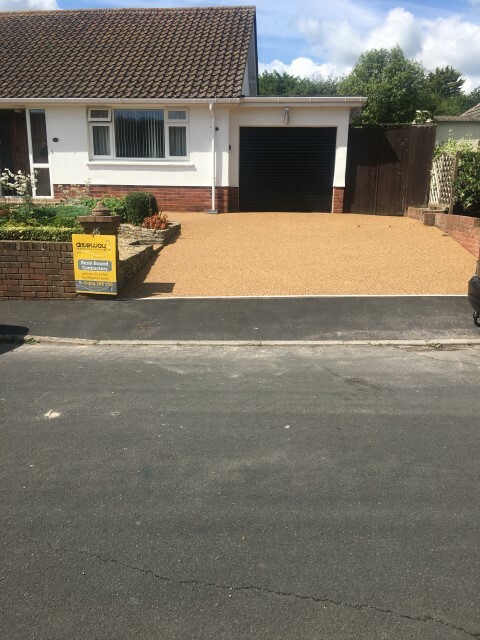 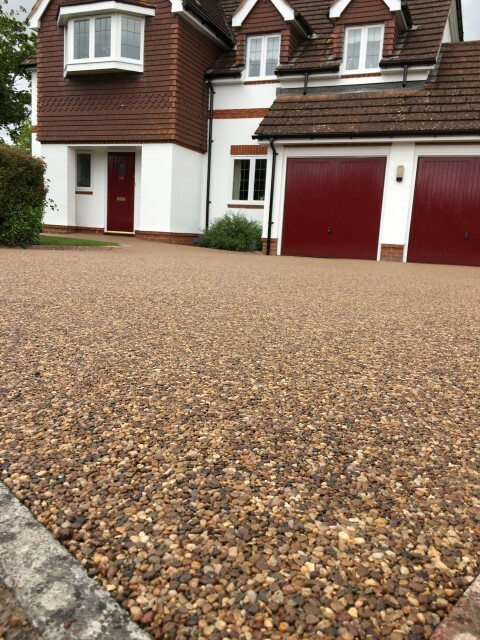 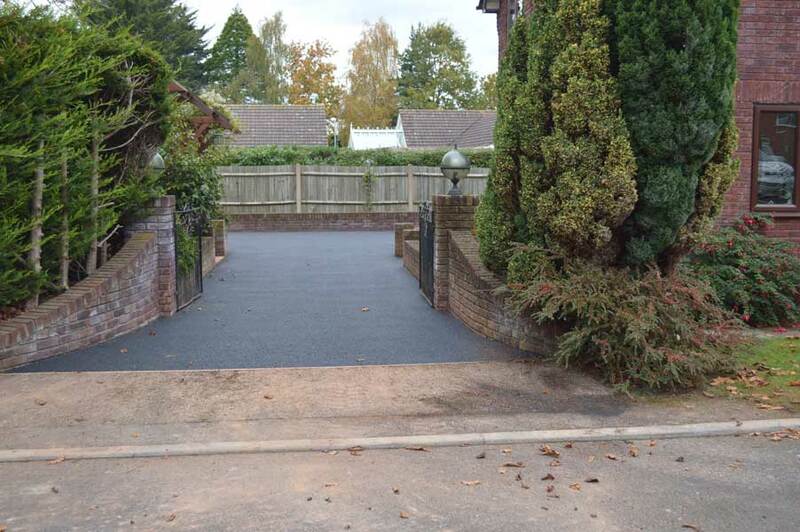 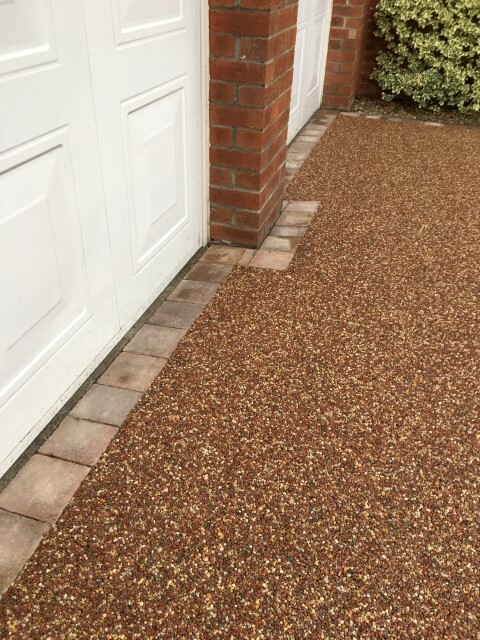 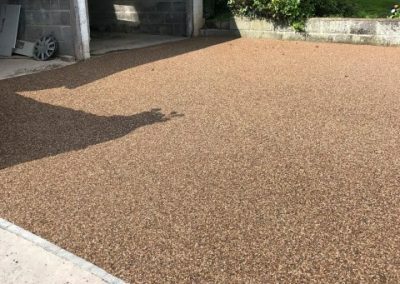 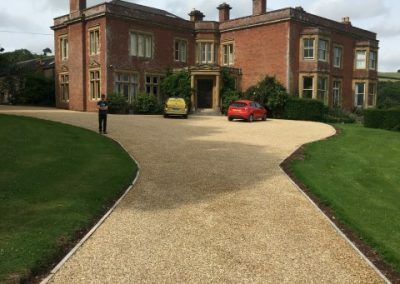 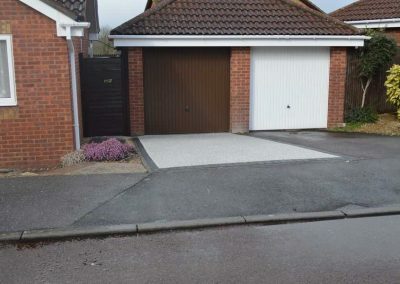 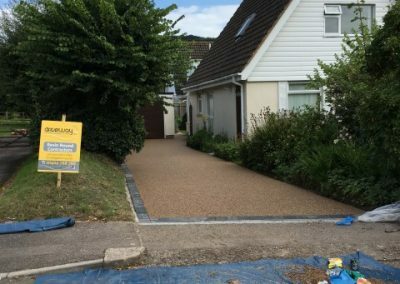 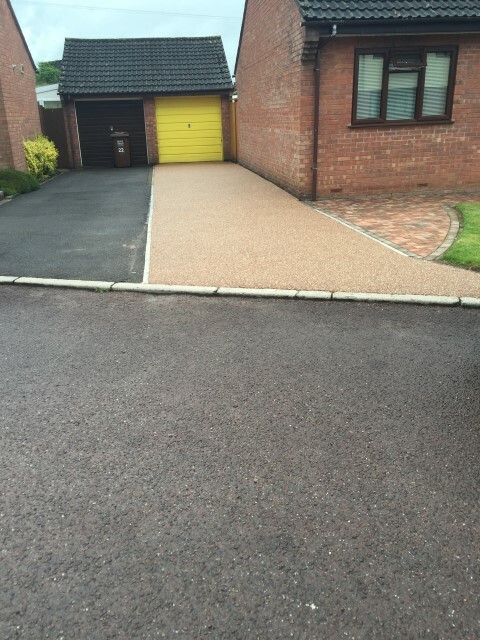 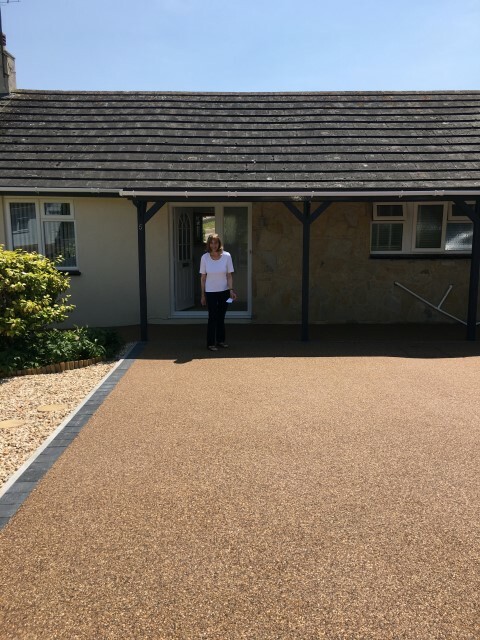 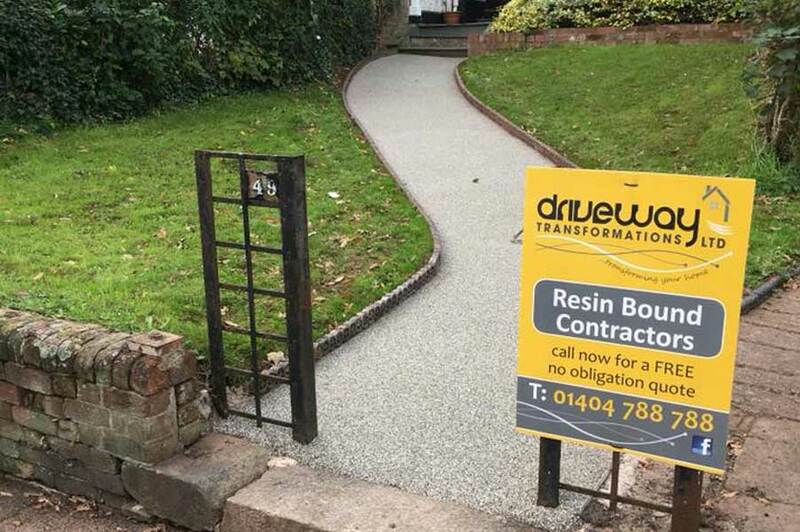 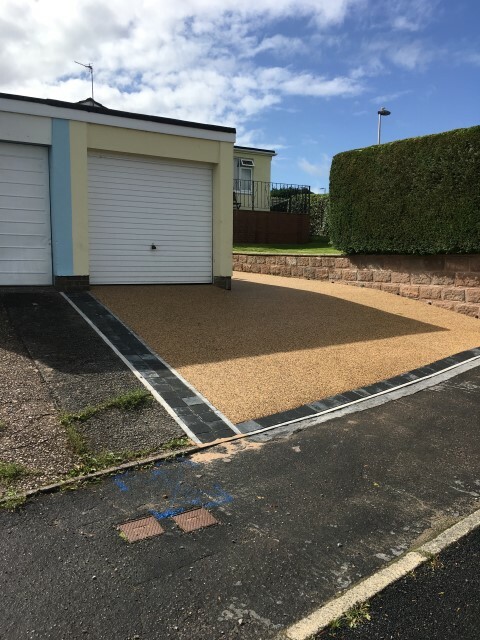 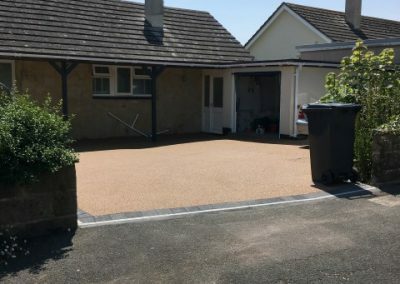 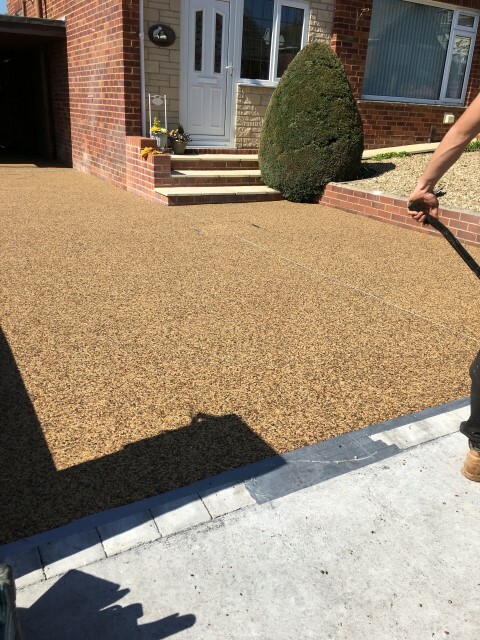 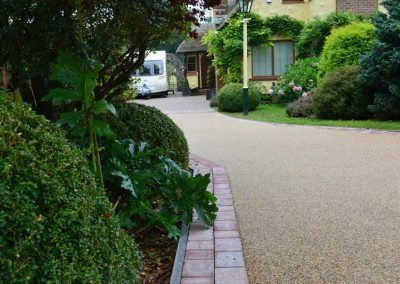 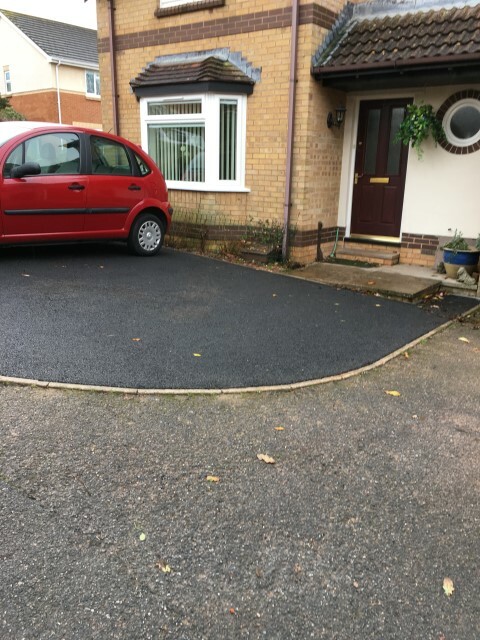 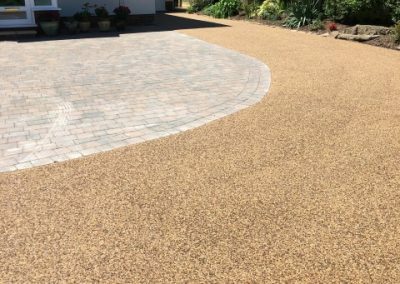 Resin bound driveway surfaces are low maintenance and fuss free, meaning you can enjoy that fresh finish for longer without the need for constant cleaning or worrying about the risk of damage. 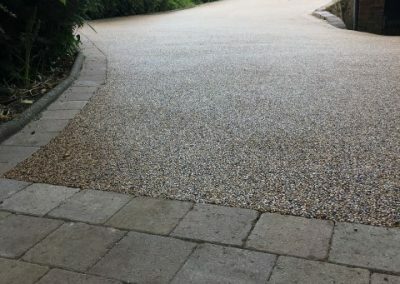 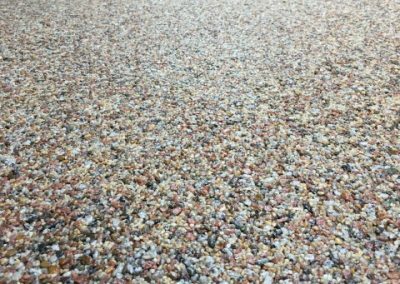 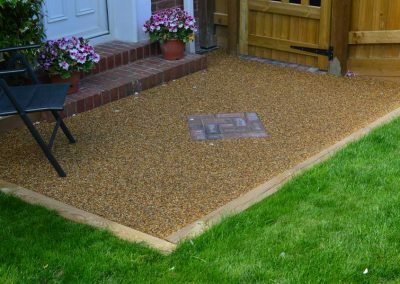 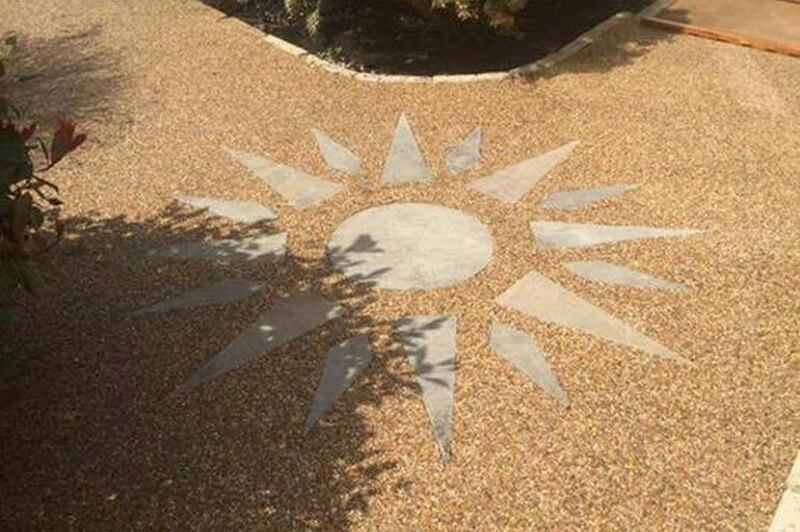 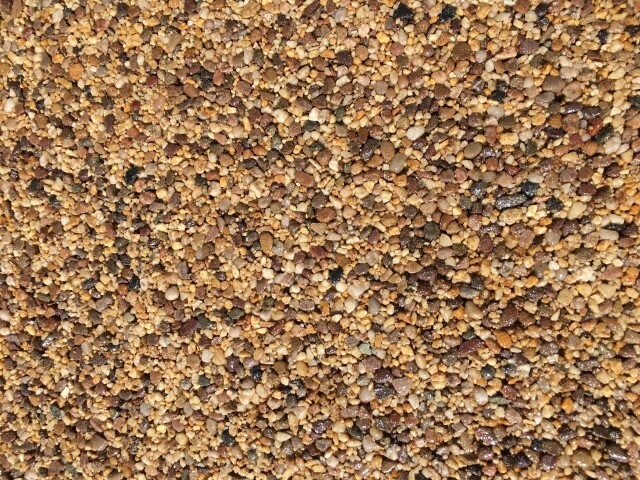 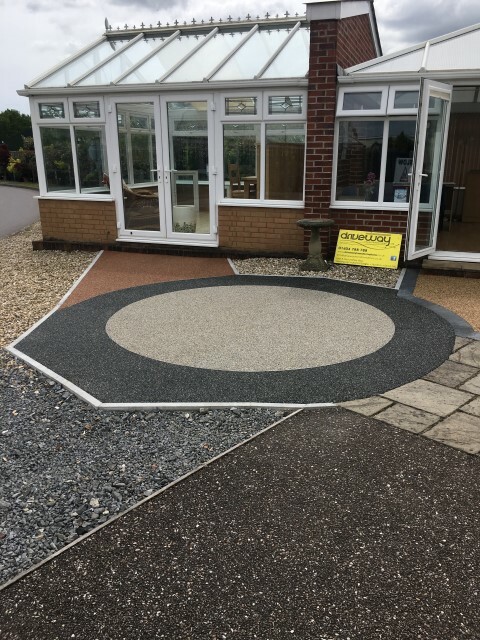 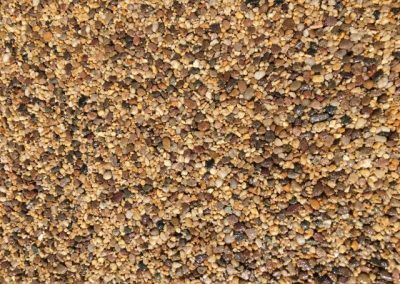 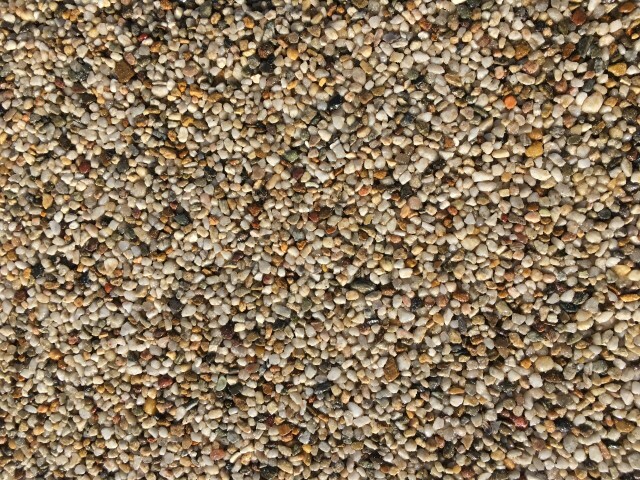 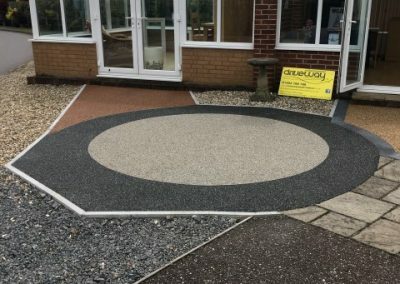 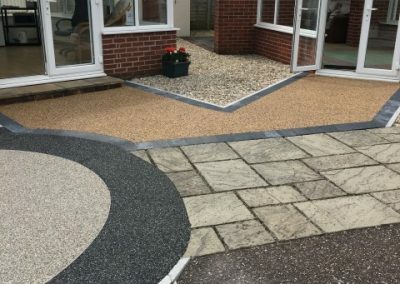 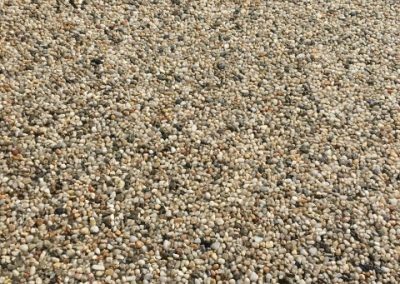 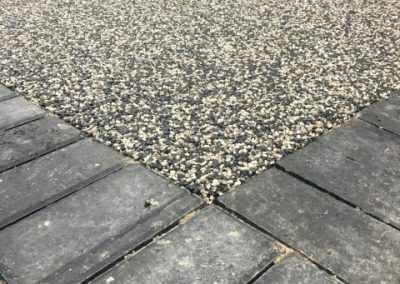 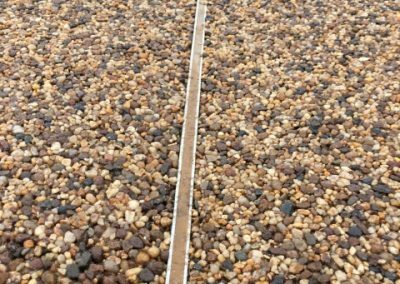 With eleven finishes available to choose from as standard, we can even create your very own bespoke resin aggregate mix using different colour resin to suit your requirements. 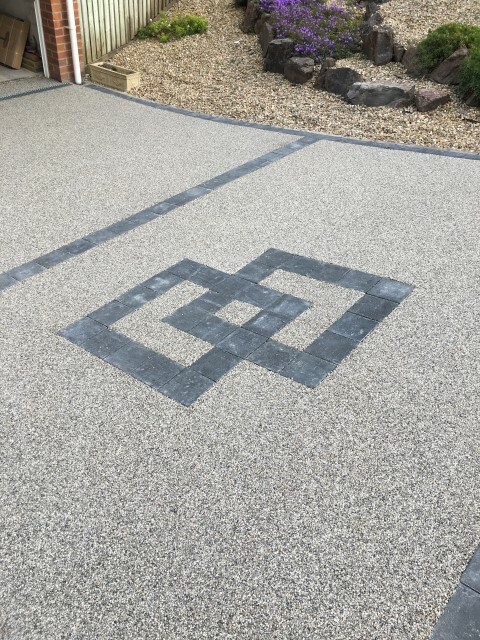 There’s also the ability to add a whole range of borders, motifs, patterns and much more to get a finish that suits, and reflects, your personal style. 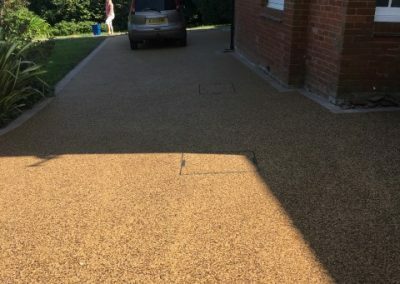 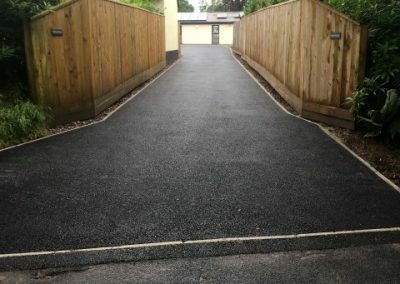 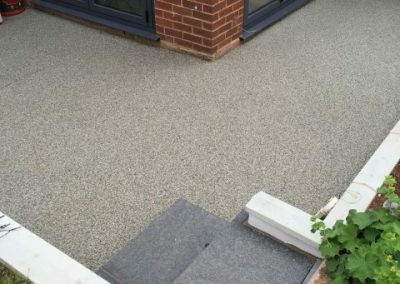 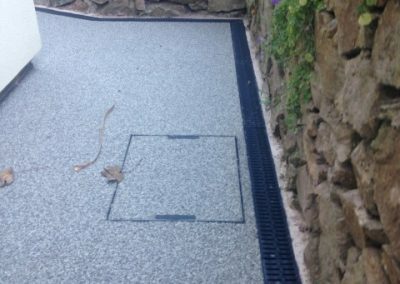 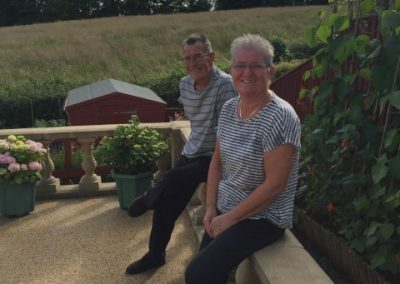 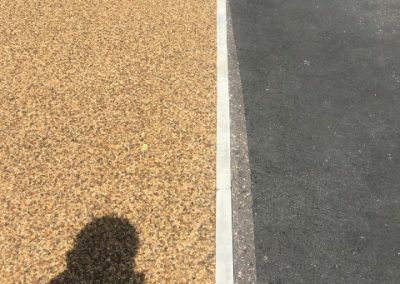 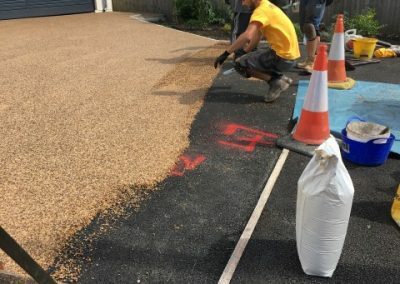 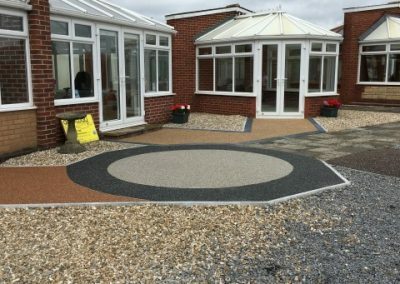 Why use resin bound surfacing? 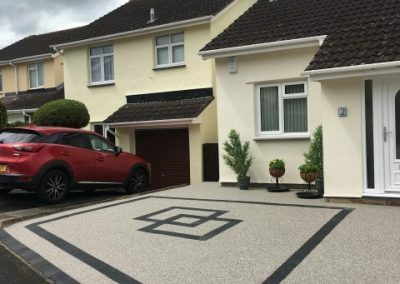 Offering a full supply and installation service we pride ourselves on our great reputation and the complete satisfaction of our customers. 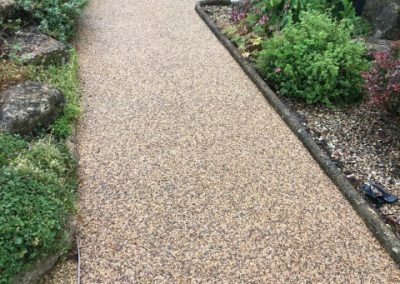 Easy to maintain and aesthetically pleasing surface that gives the appearance of natural gravel without the associated disadvantages. 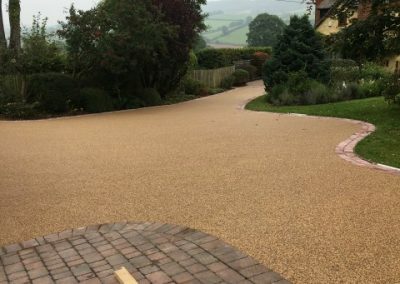 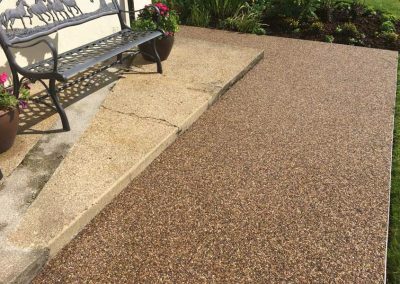 Resin bound Surfacing is permeable, thus allowing surface water to drain through the surface and back into the water table. 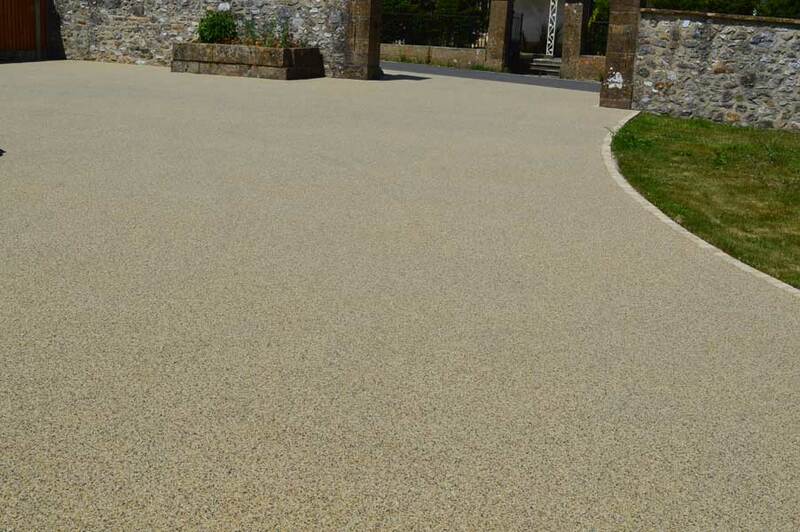 The finish is an anti slip, weed proof, porous surface with the performance of concrete or tarmac. 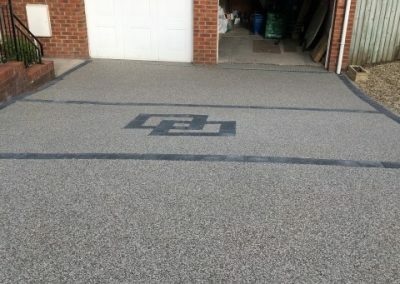 At Driveway Transformations, we pride ourselves on our quality products and professional workmanship. 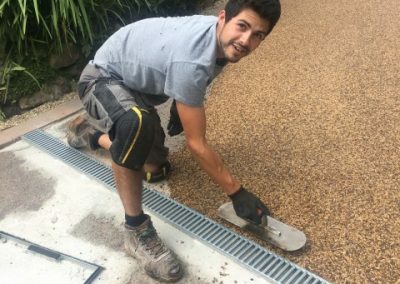 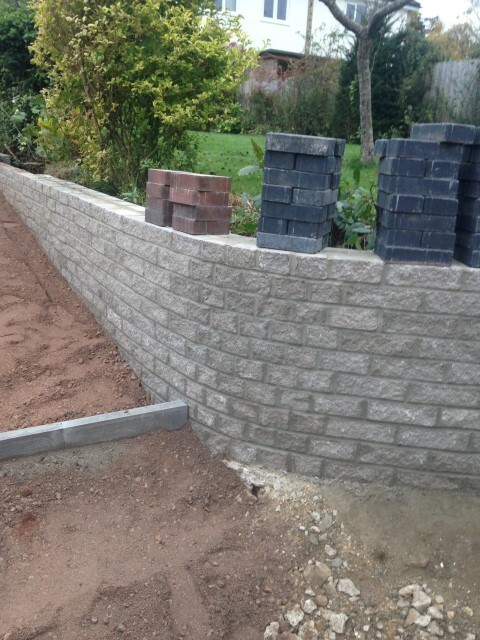 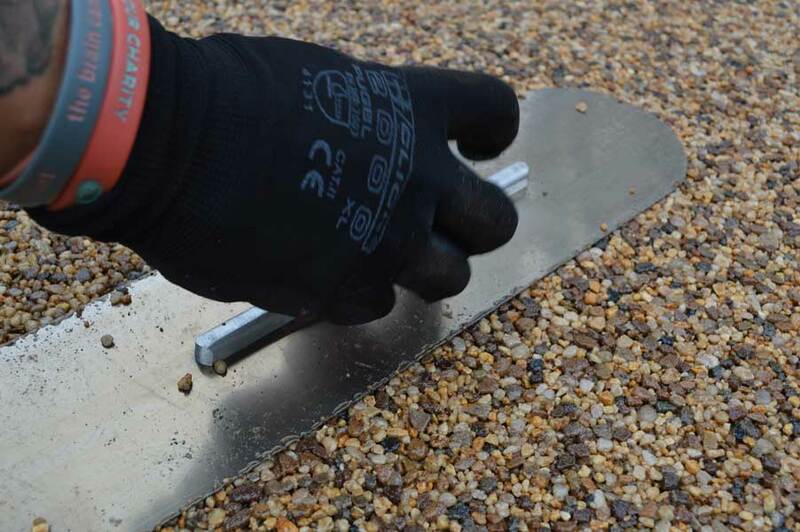 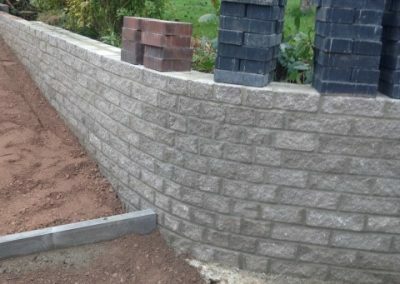 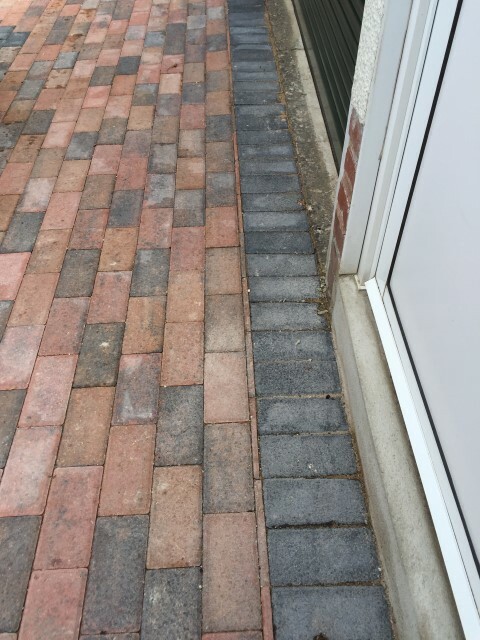 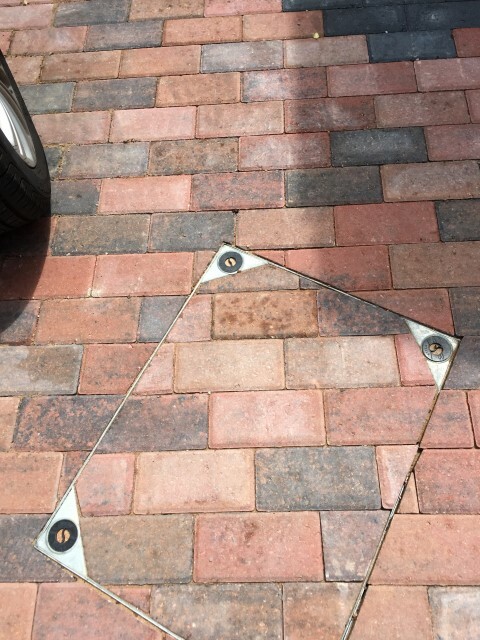 We supply the very best products, from DT resin to Marshalls paving slabs, and our groundwork technicians are all highly-skilled, experienced tradesmen. 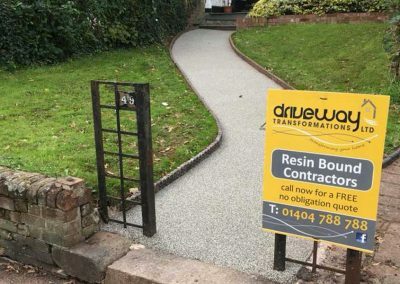 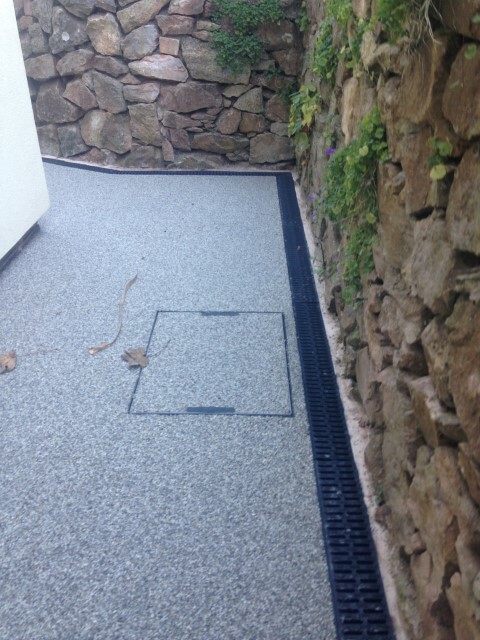 Our resin installation team are DT approved installers equipped with over 15 years experience and have successfully completed contracts at Bicton College, Exeter University, and Haven Holidays Devon Cliffs amongst many other local projects. 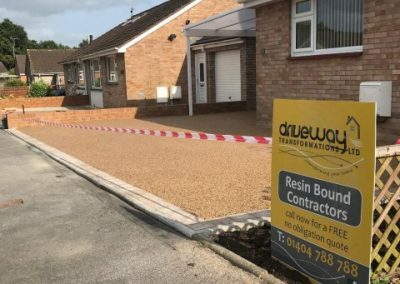 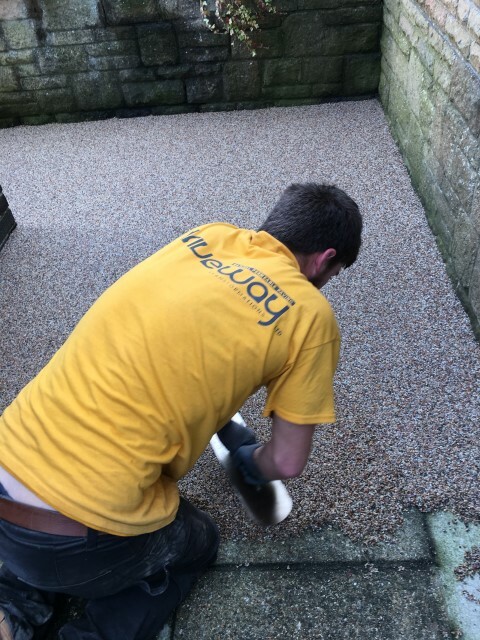 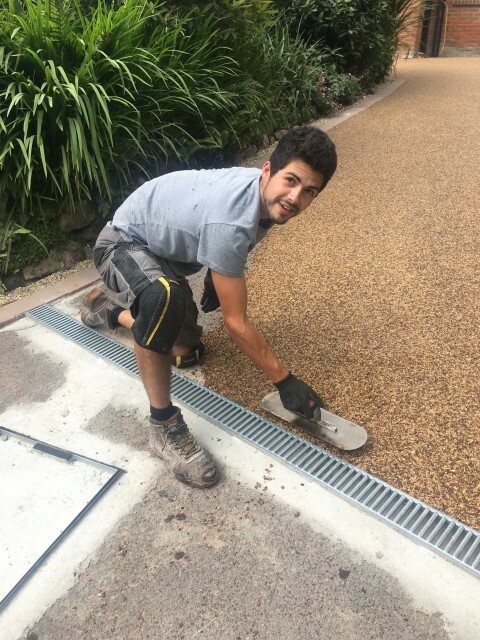 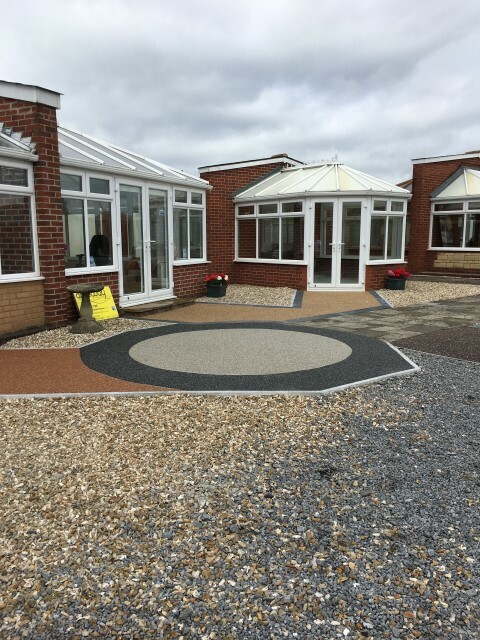 We’re so proud of our high standards of work that we offer a 10 year guarantee with all of our supplied and installed resin bound surfaces, giving you complete customer satisfaction for years to come. 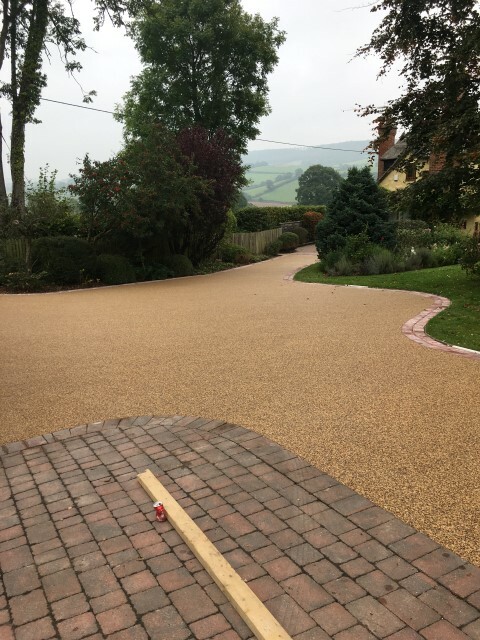 Resin Bound overlay 160m2 in total. 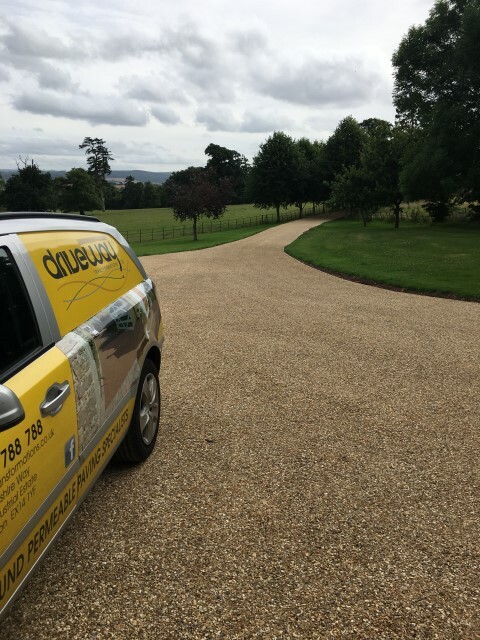 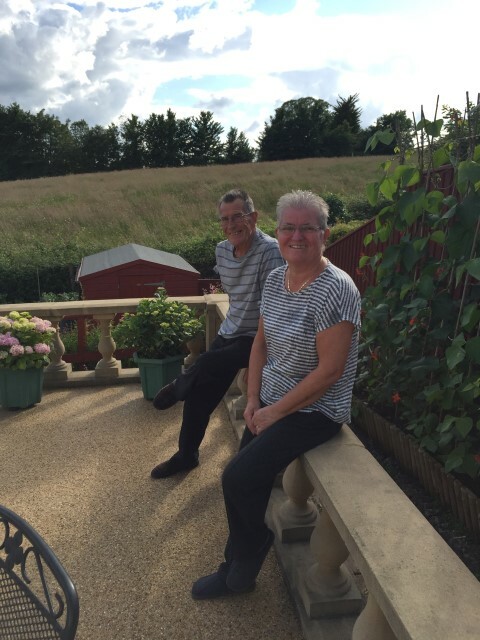 We believe in old fashioned values and always put our customers first ensuring a high quality professional service that represents excellent value for money. 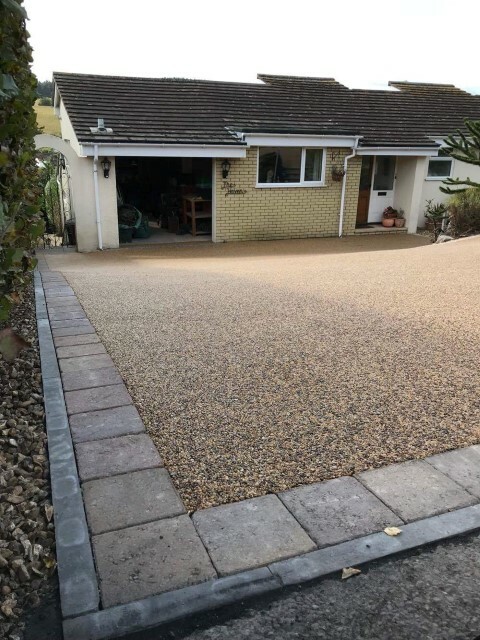 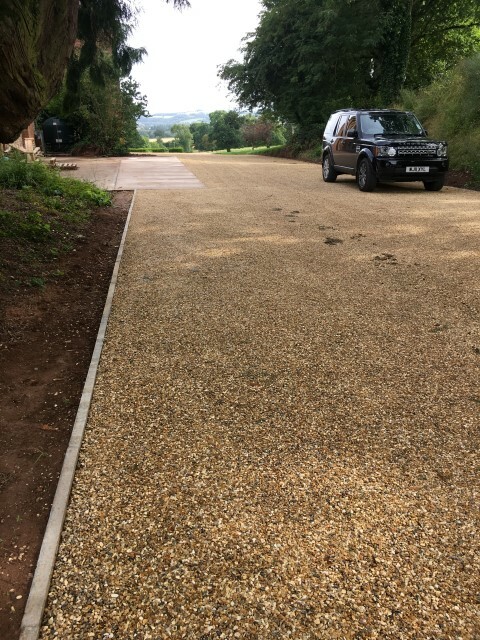 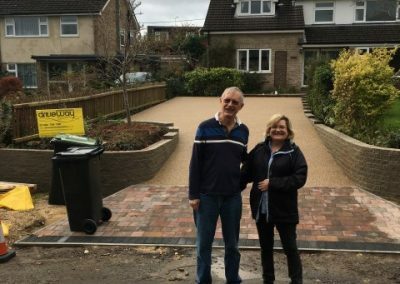 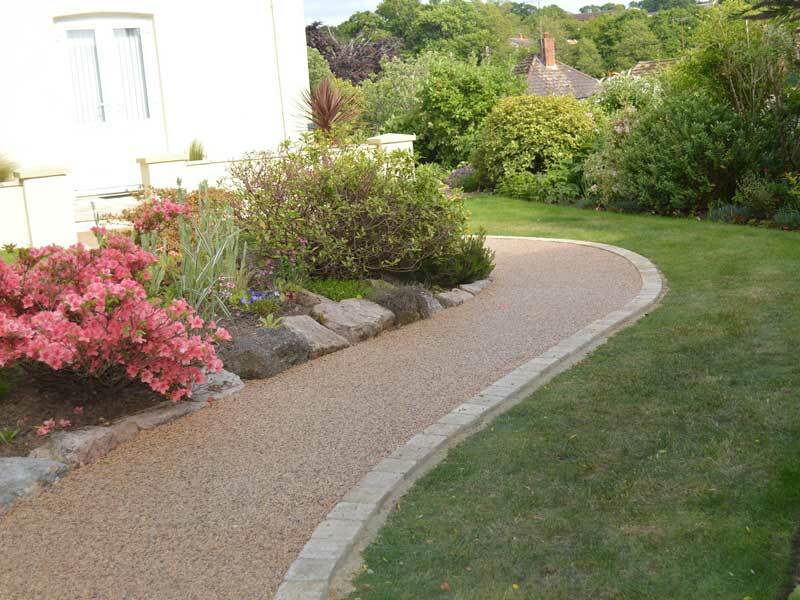 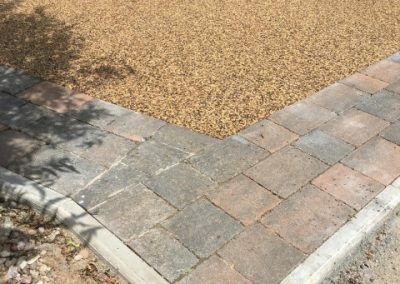 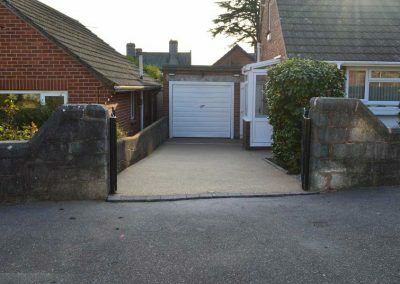 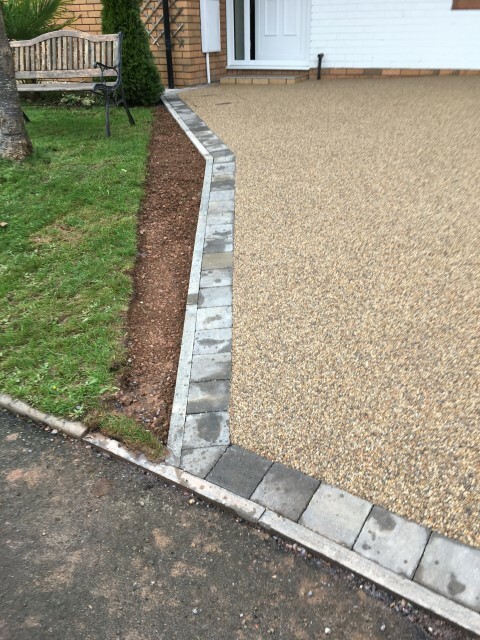 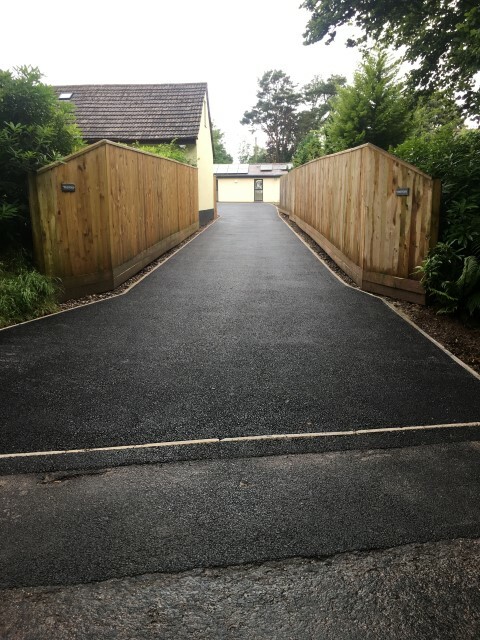 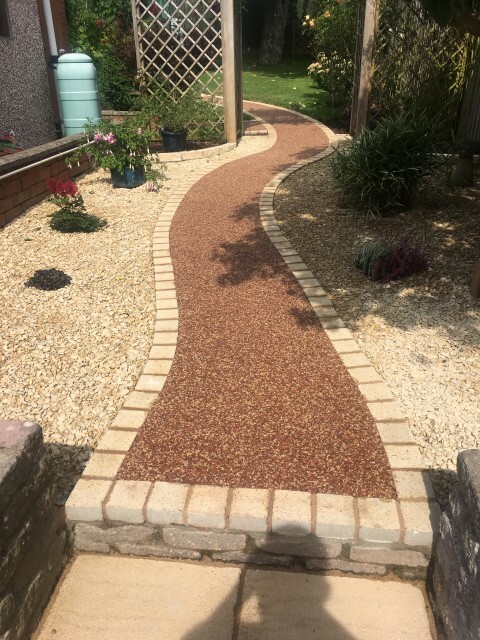 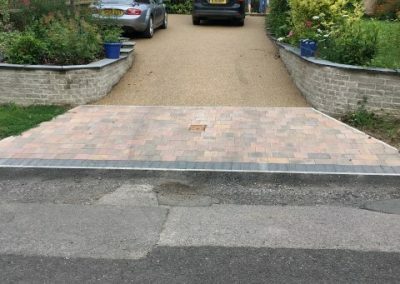 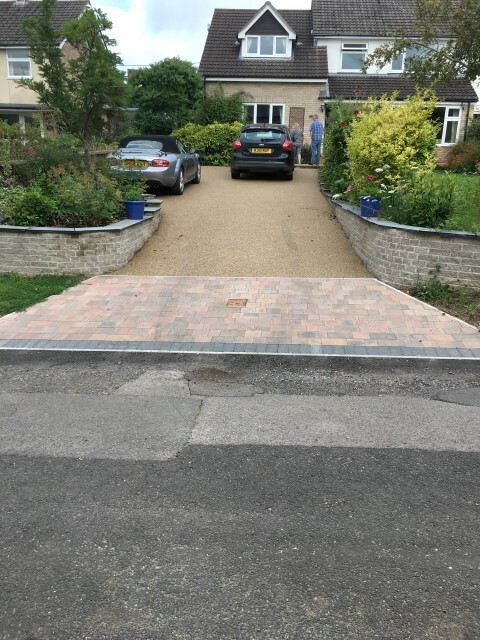 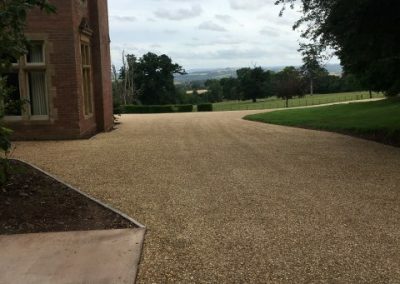 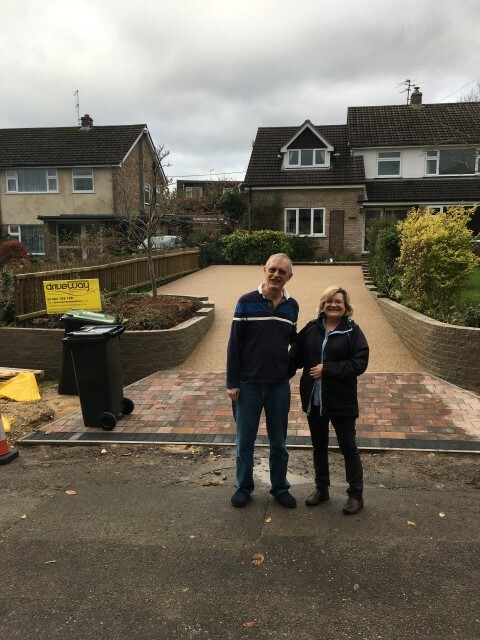 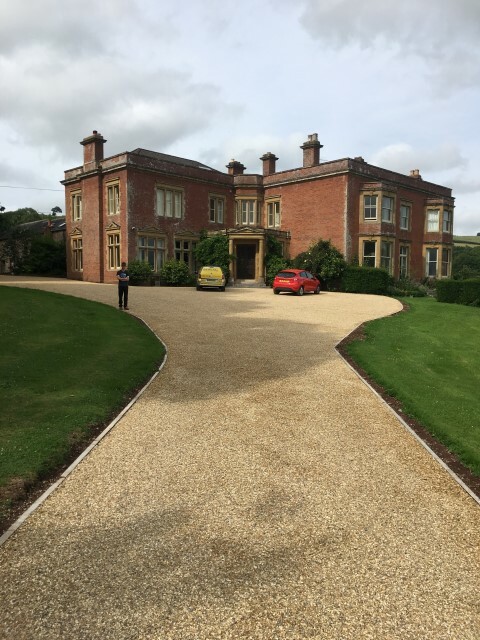 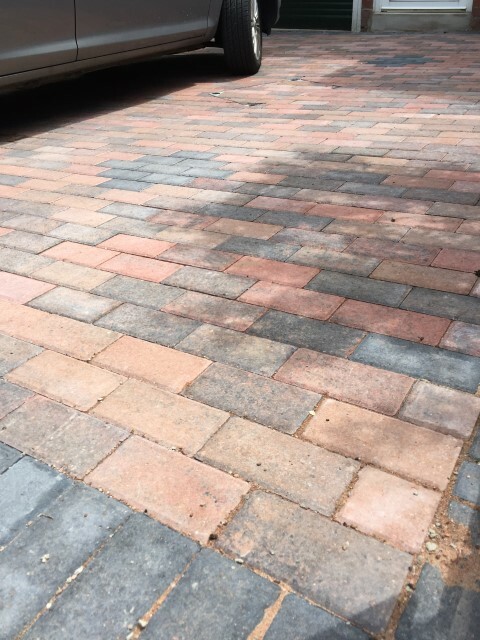 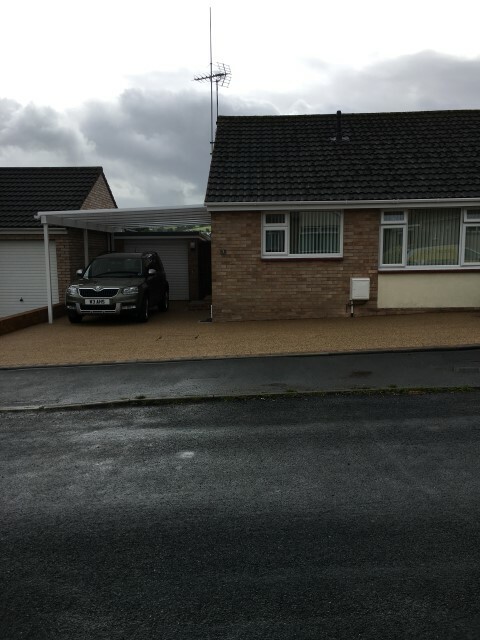 Driveway Transformations are leading installers of paths, patios, driveways and block paving in Devon, Cornwall, Somerset and Dorset. 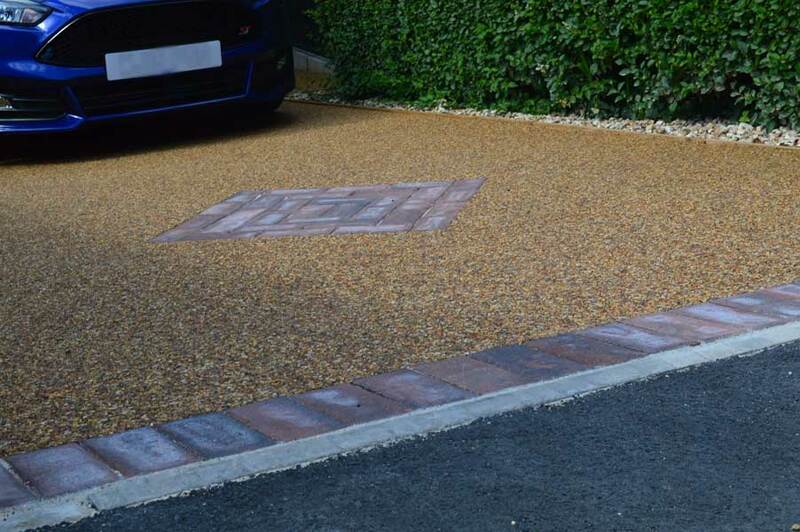 We strive to offer the best products with the highest level of service both during and after the sales process.